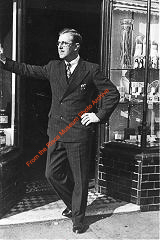 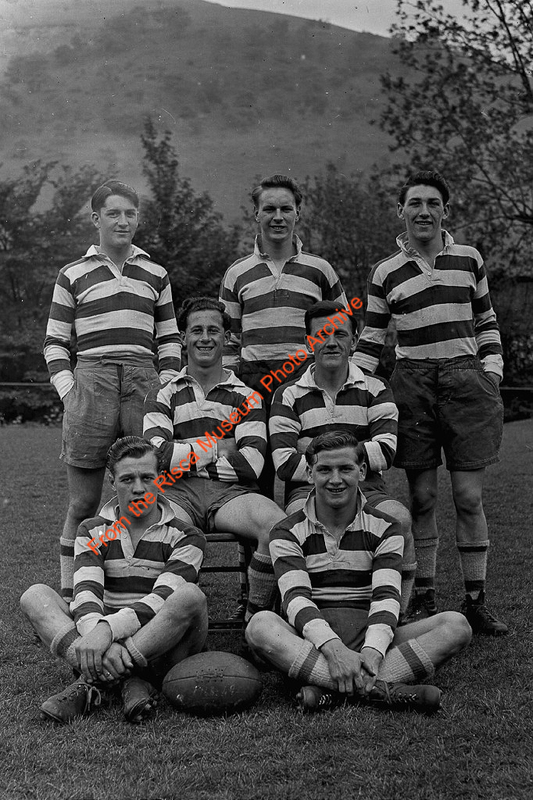 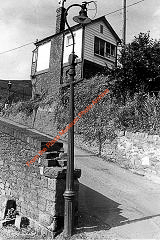 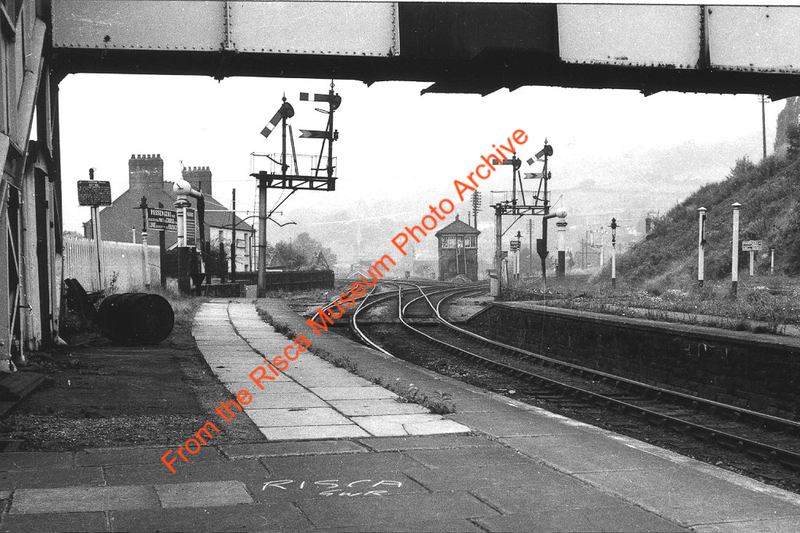 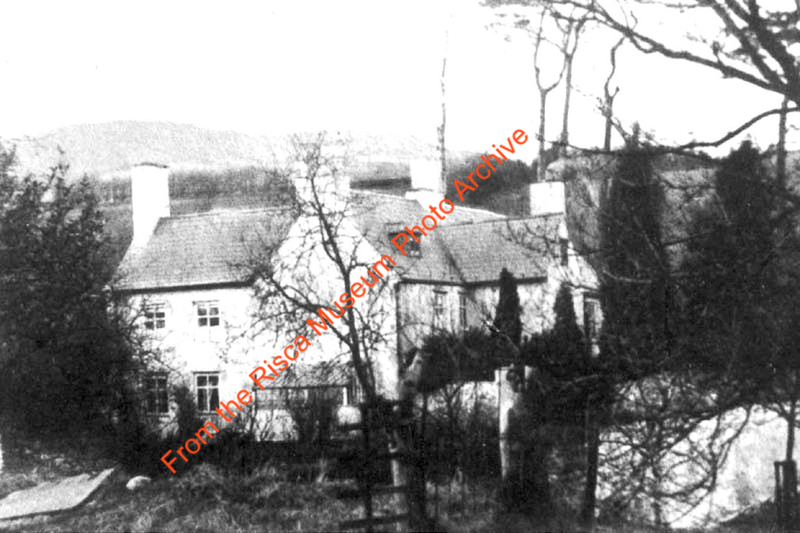 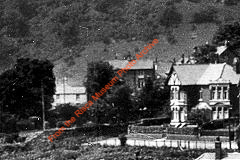 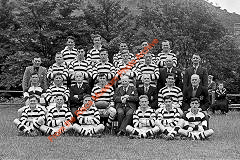 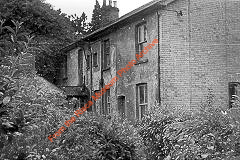 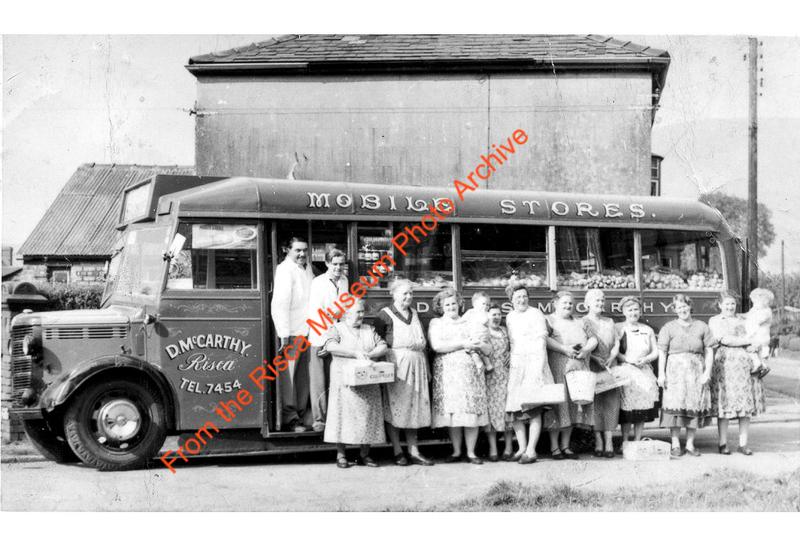 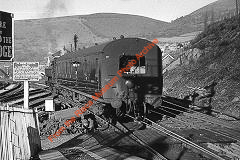 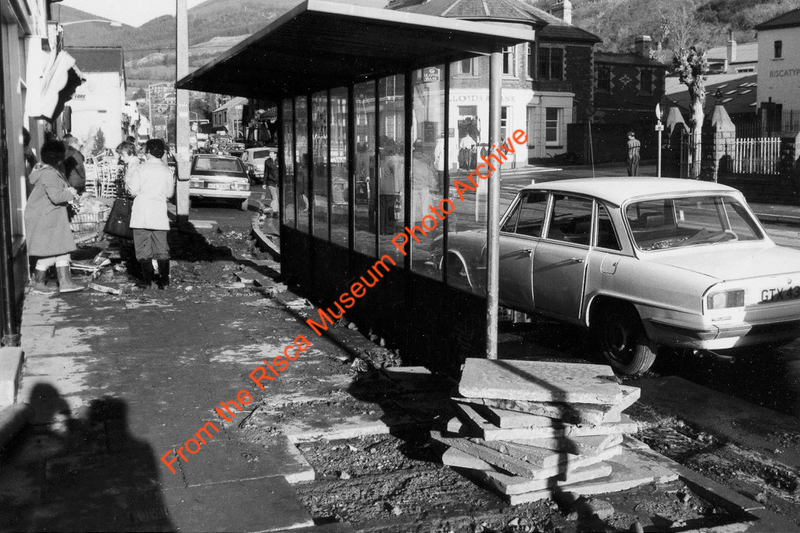 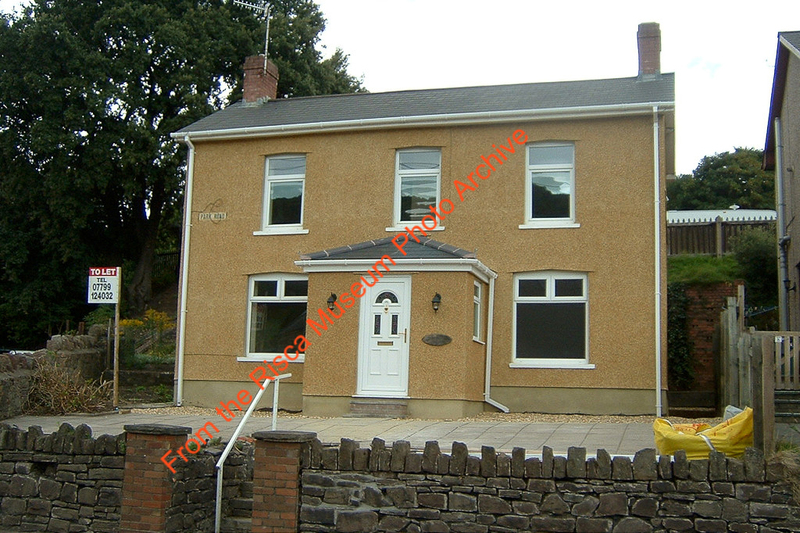 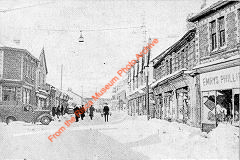 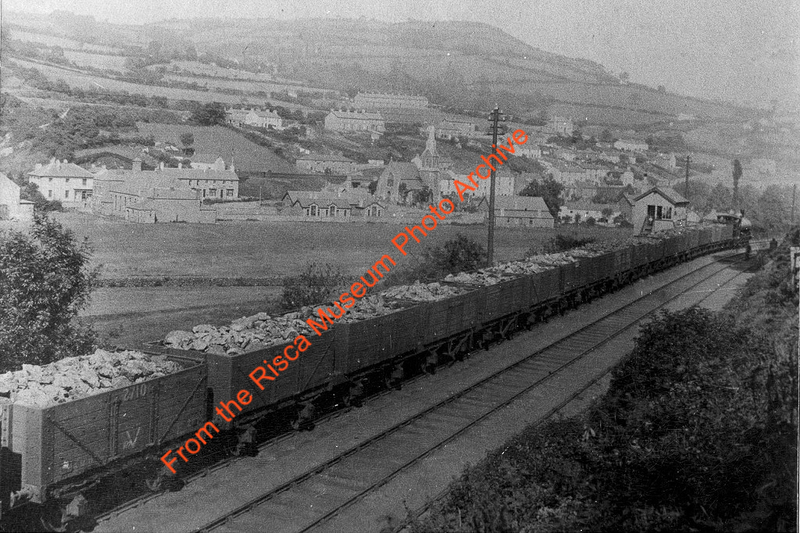 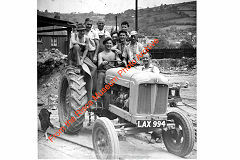 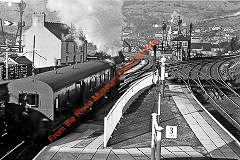 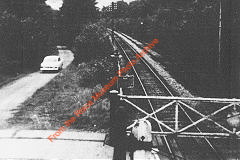 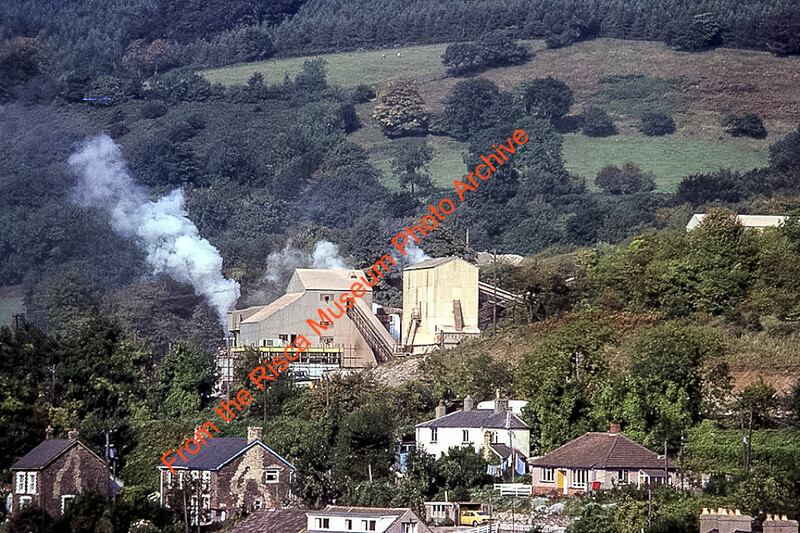 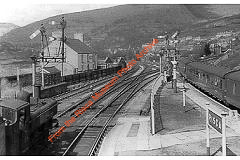 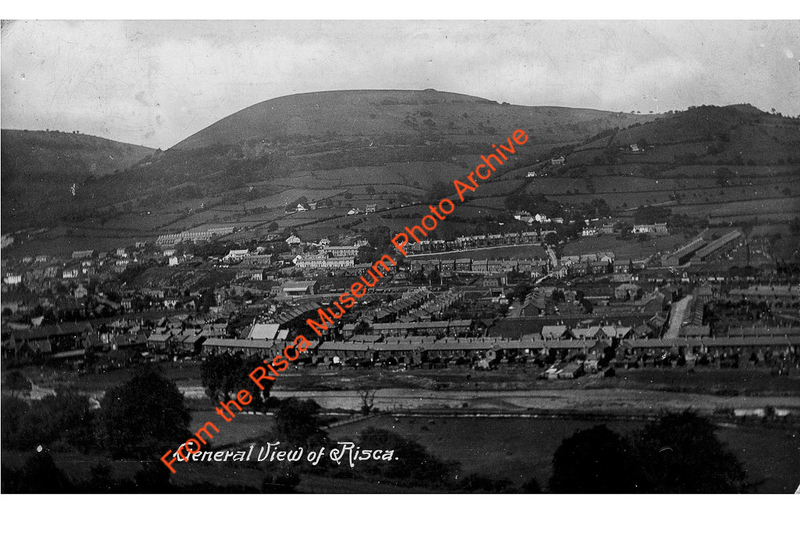 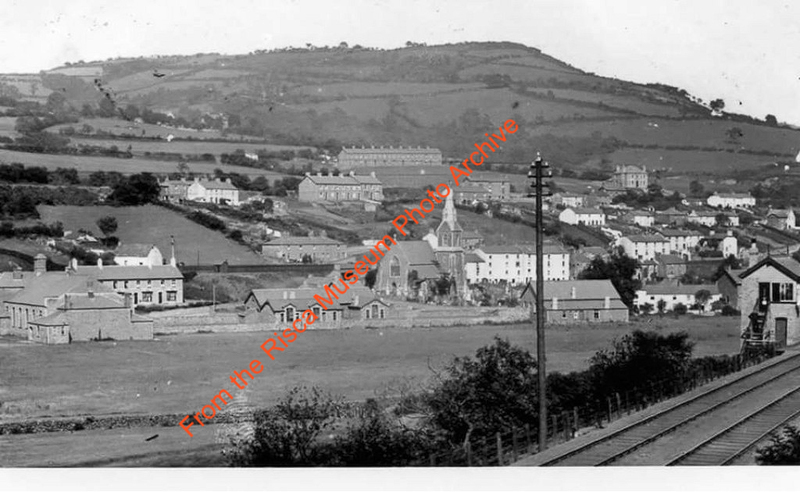 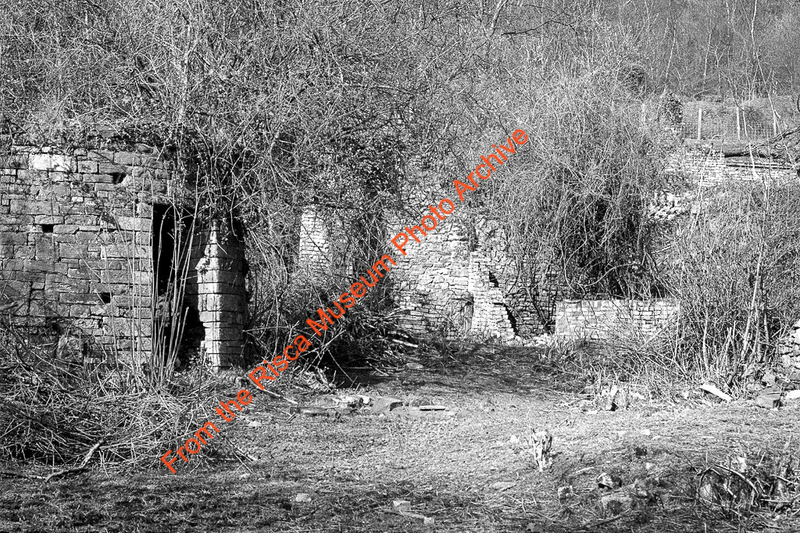 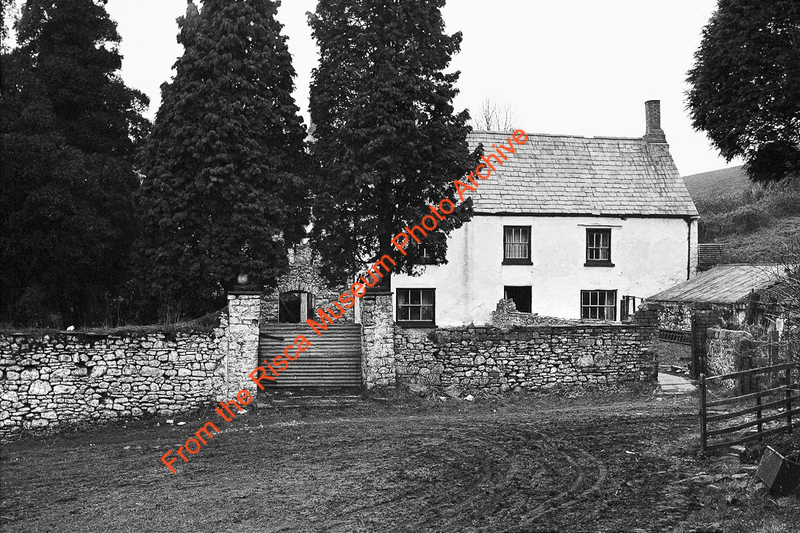 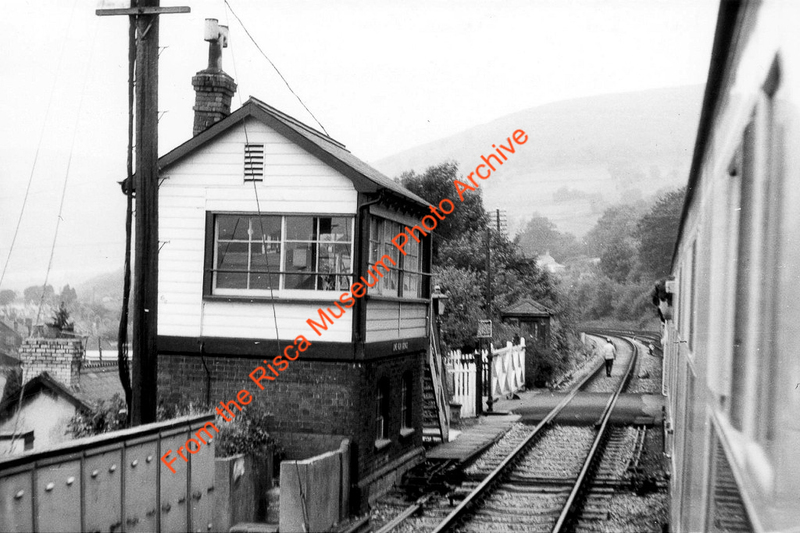 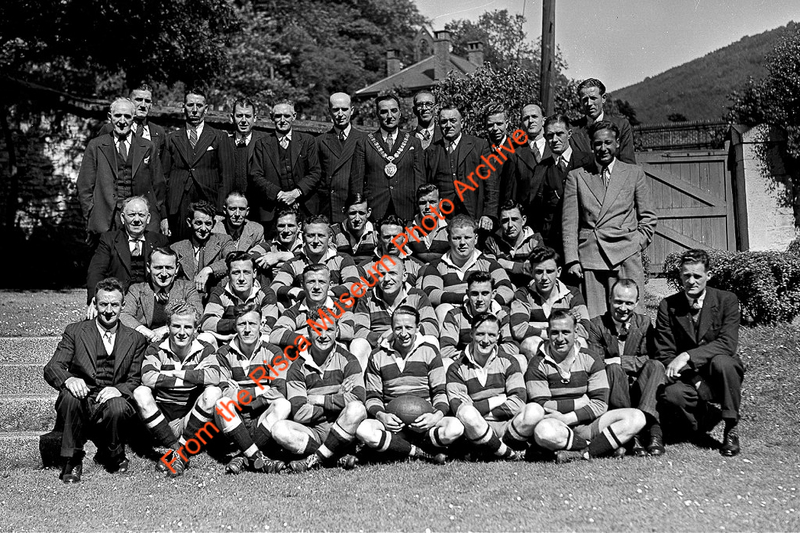 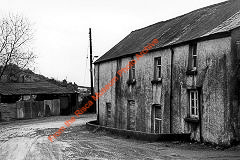 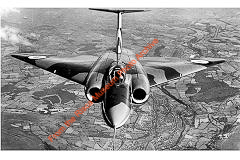 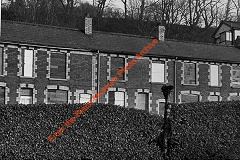 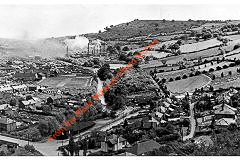 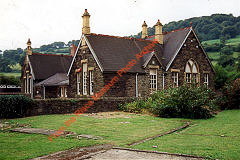 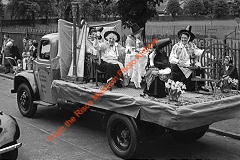 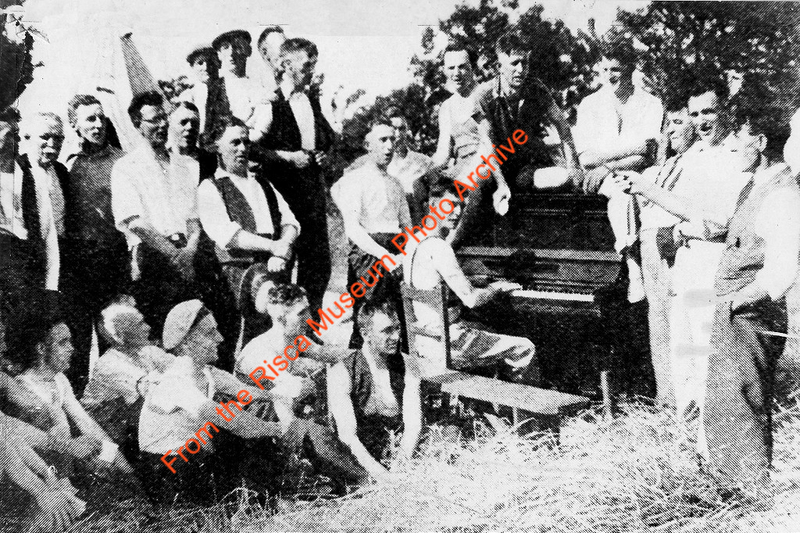 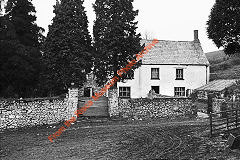 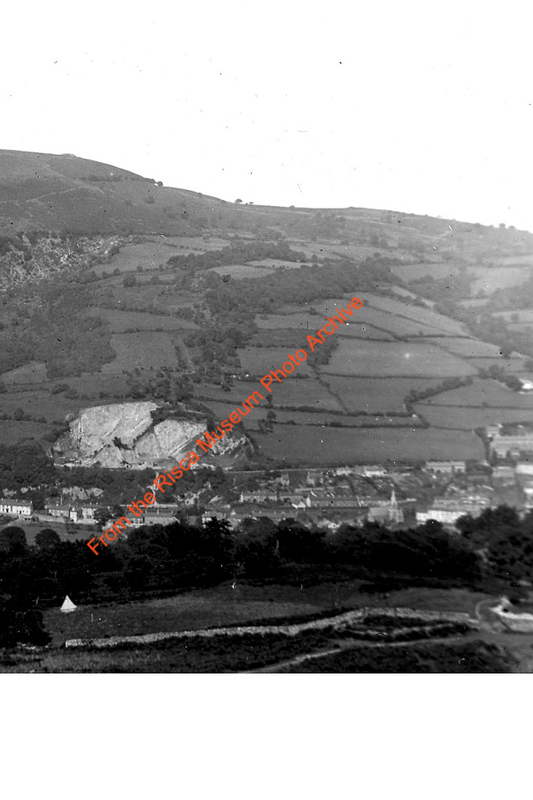 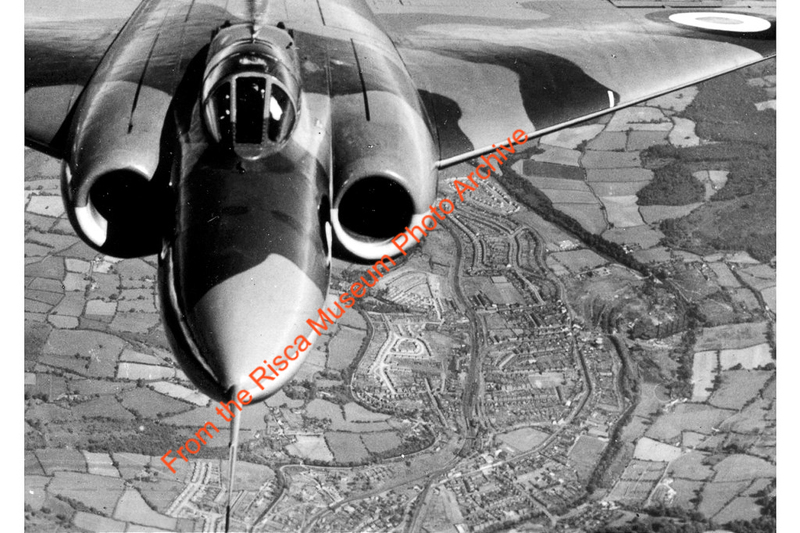 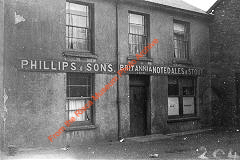 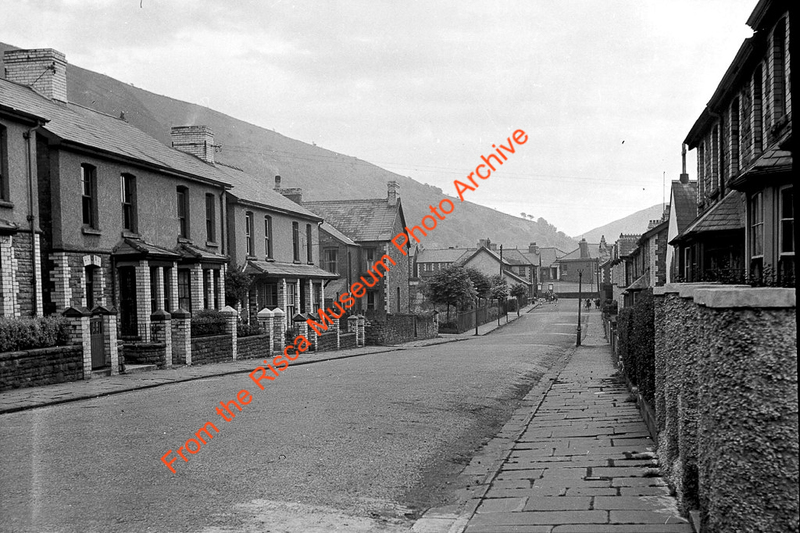 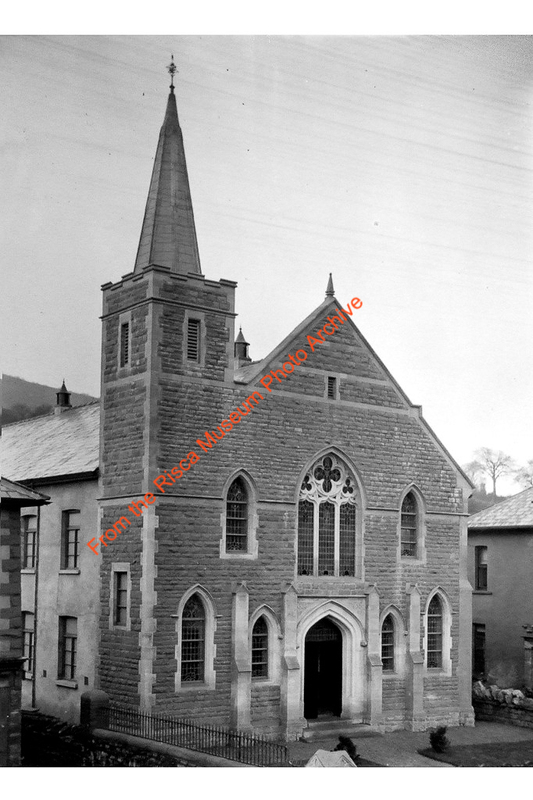 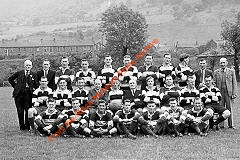 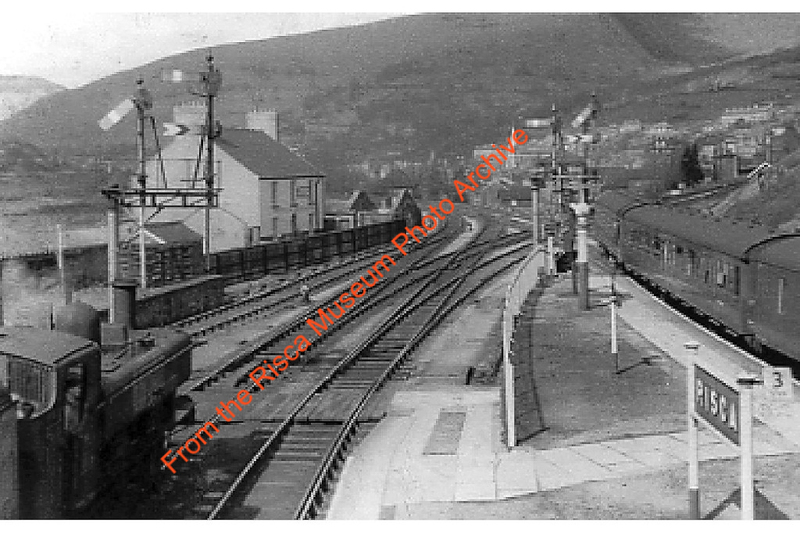 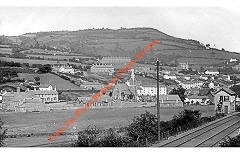 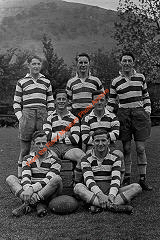 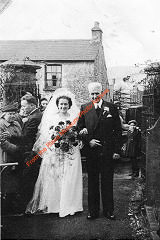 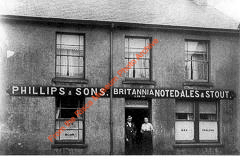 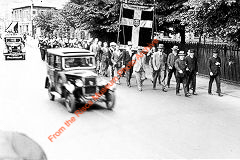 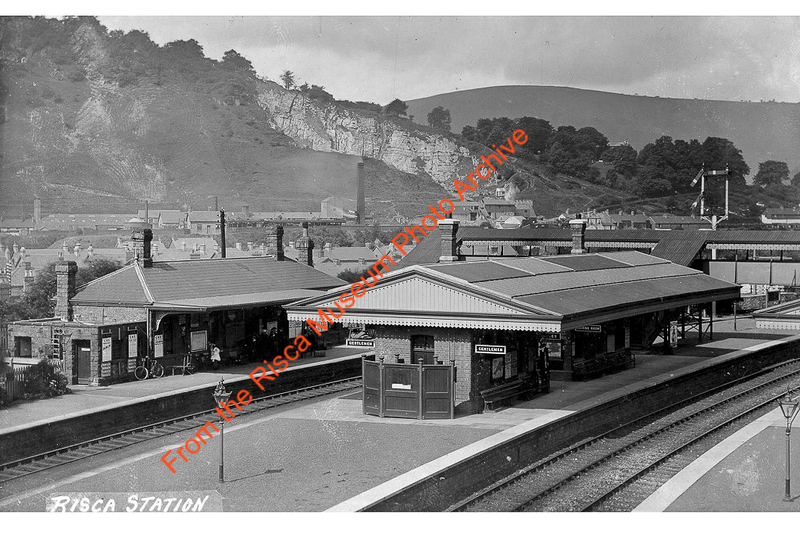 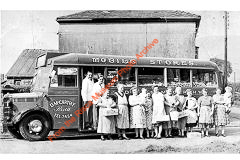 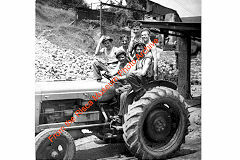 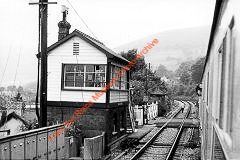 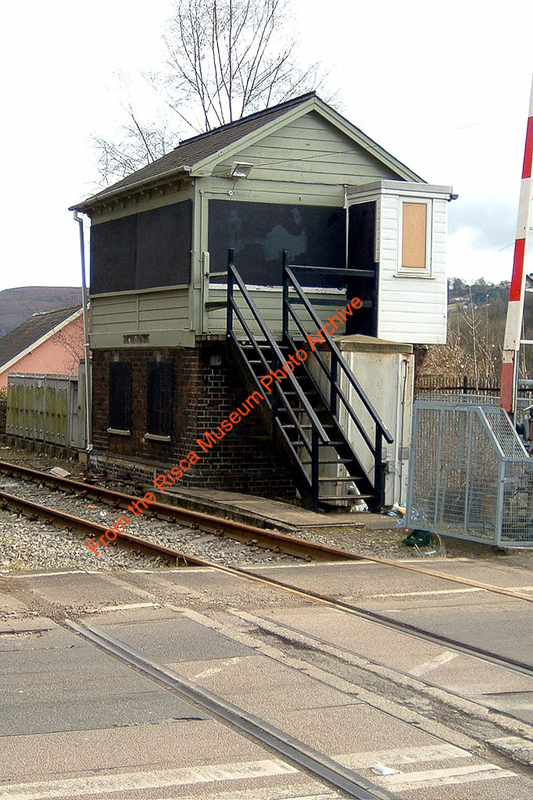 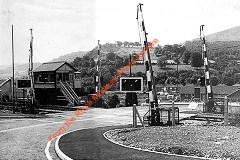 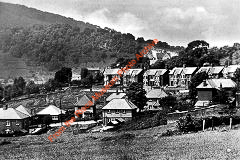 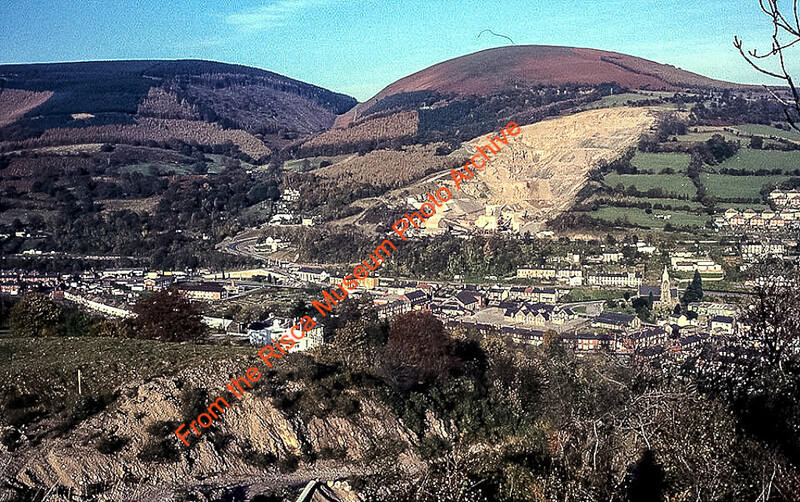 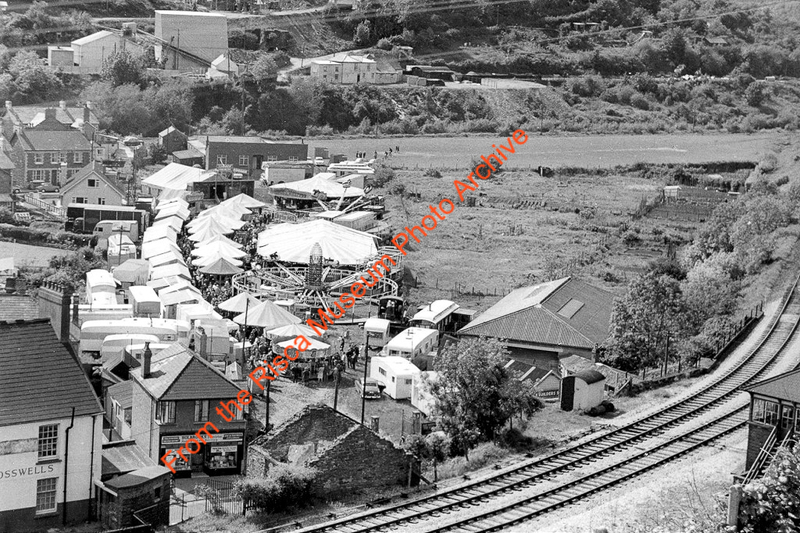 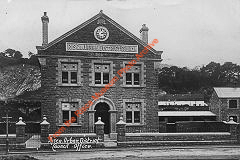 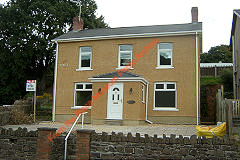 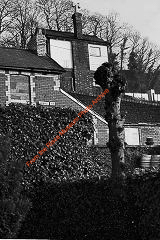 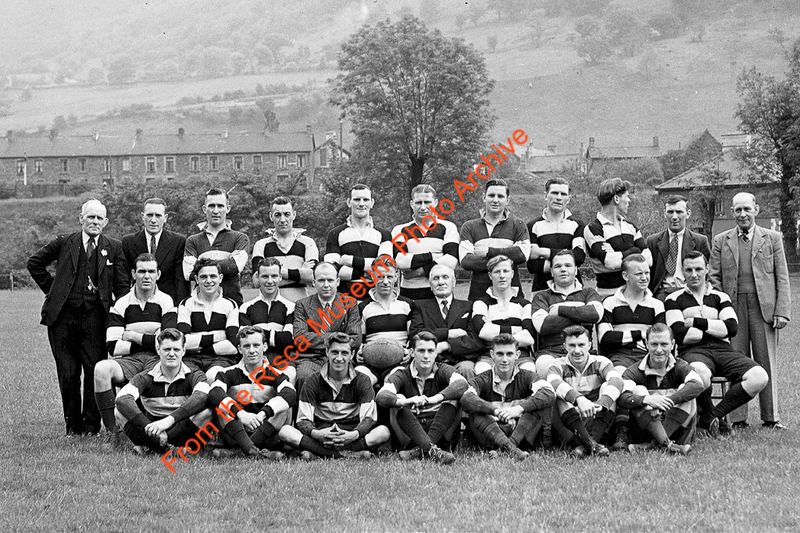 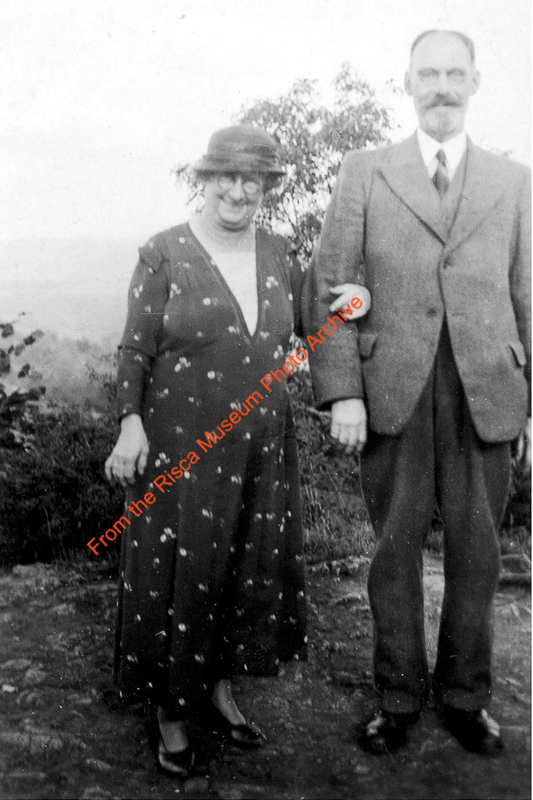 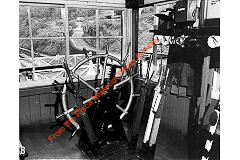 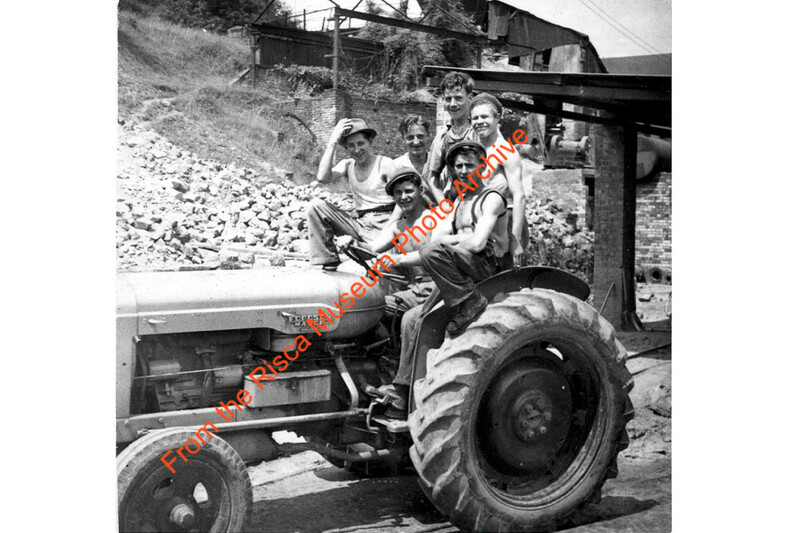 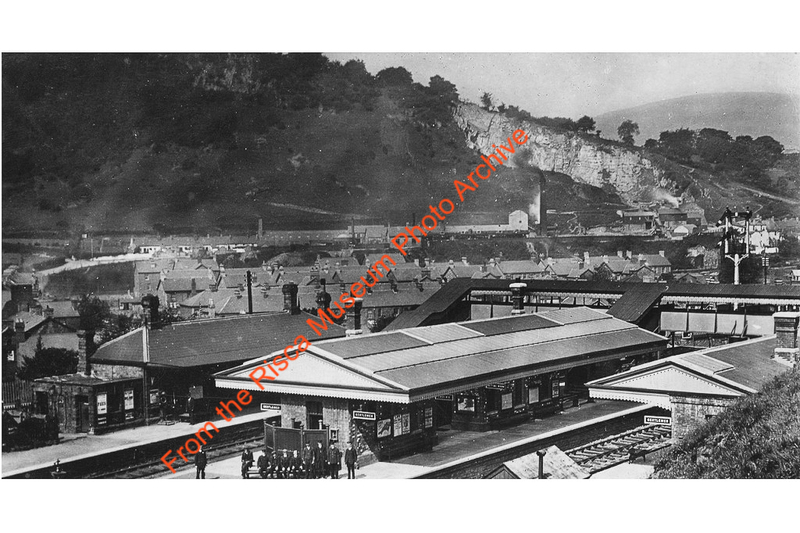 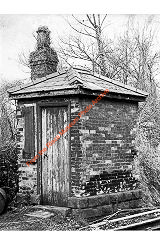 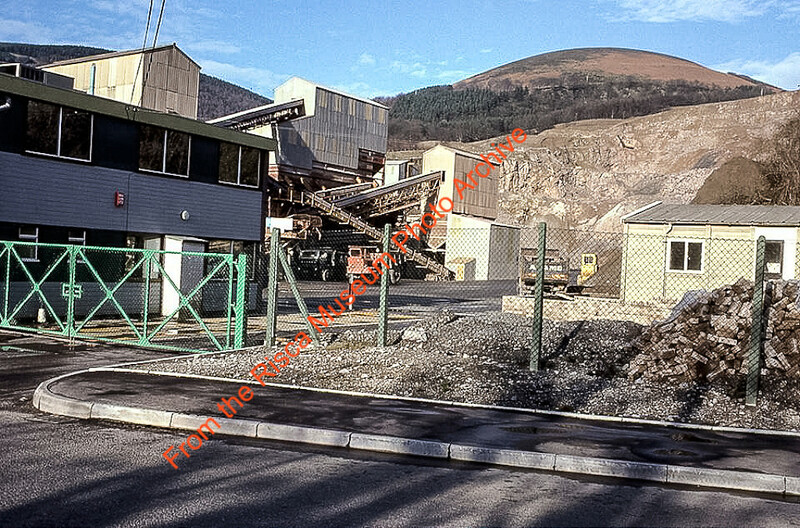 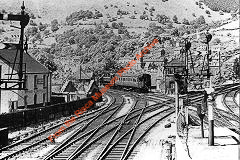 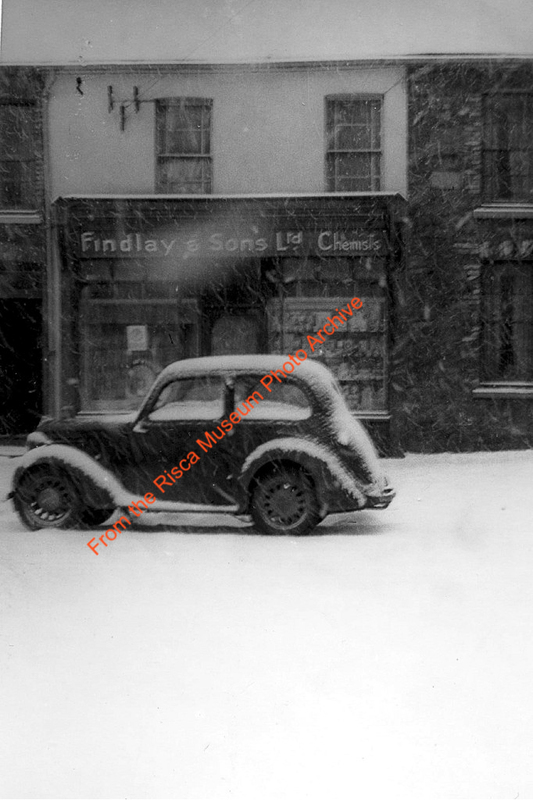 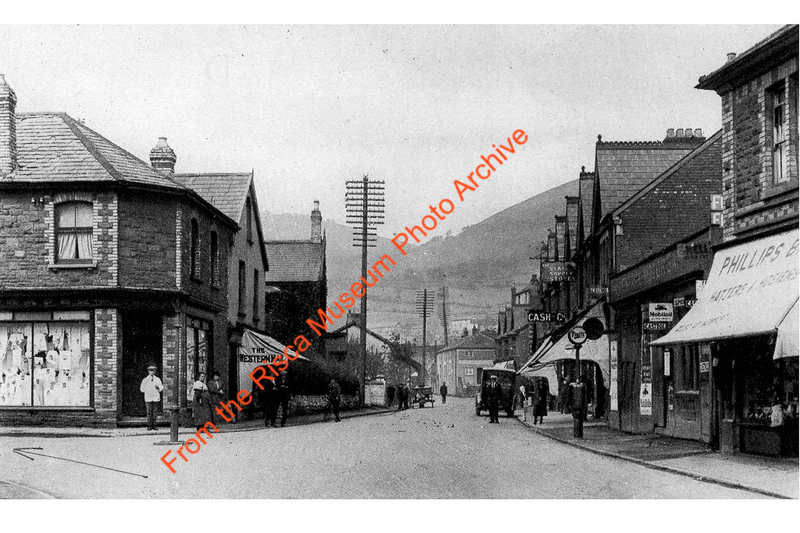 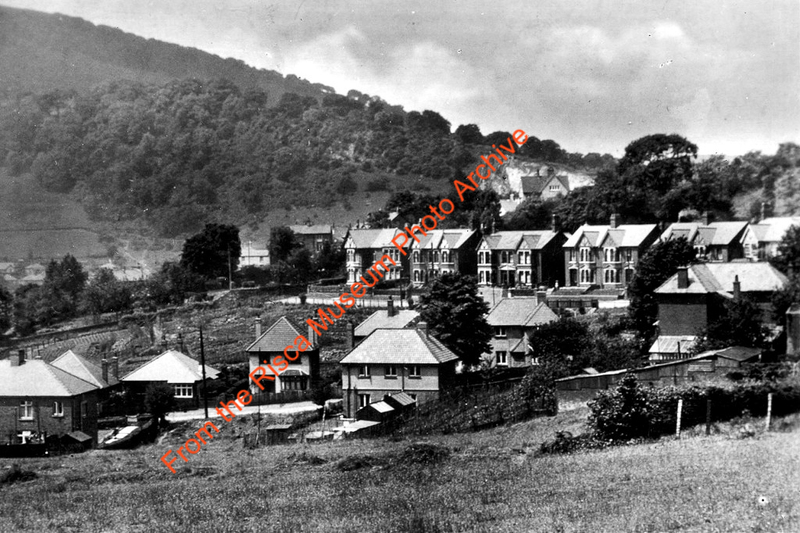 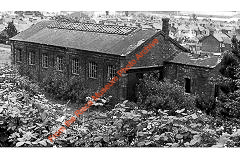 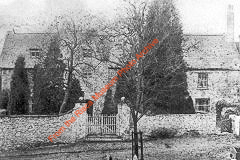 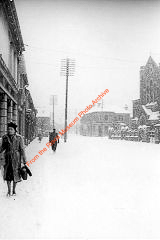 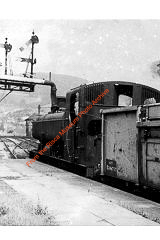 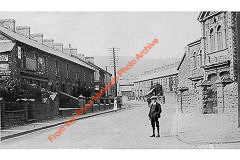 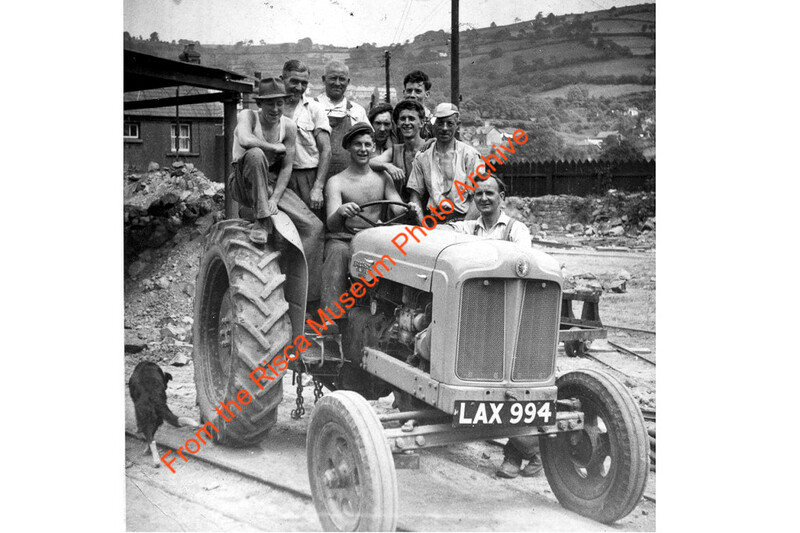 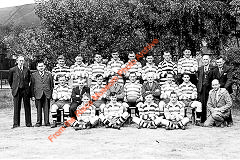 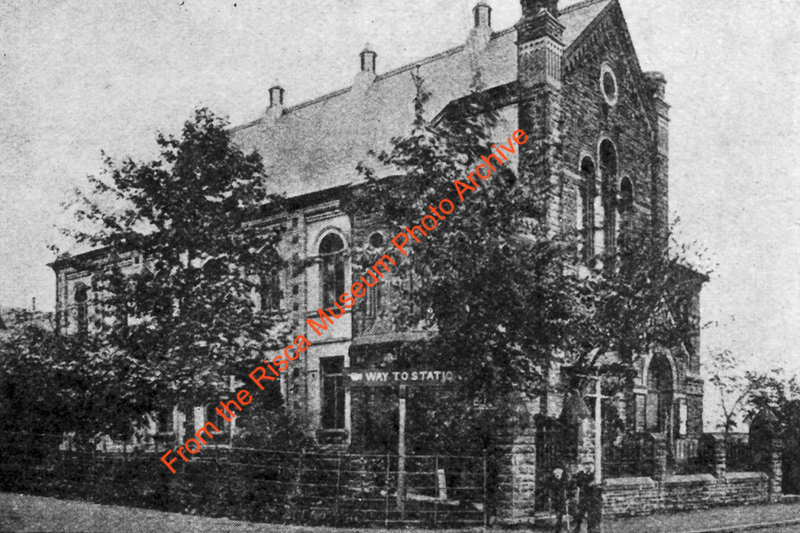 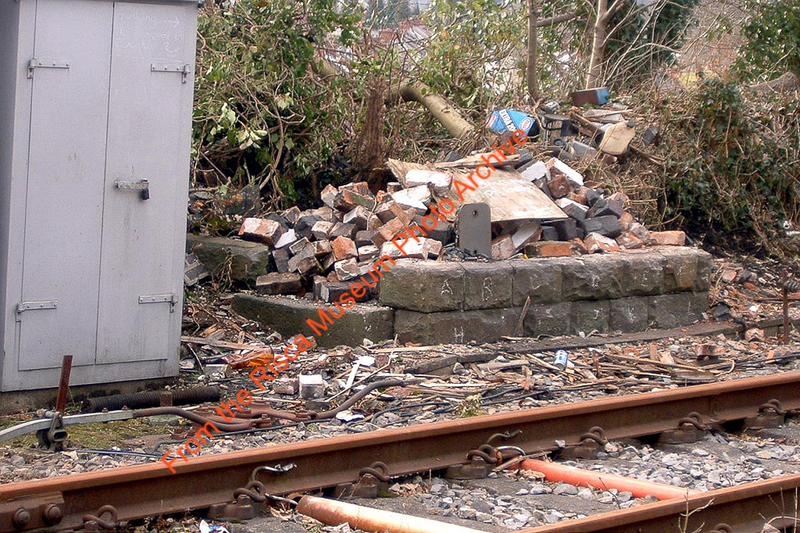 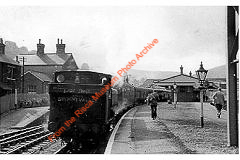 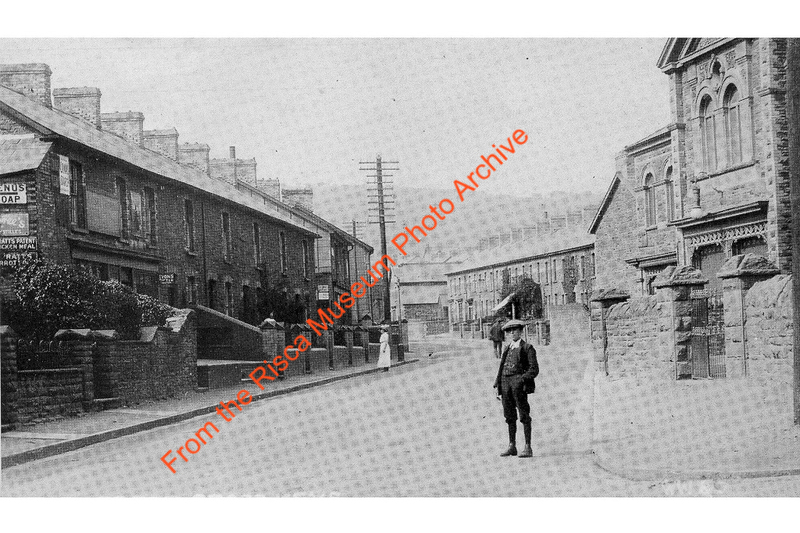 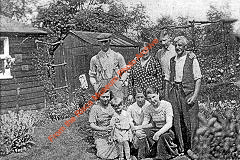 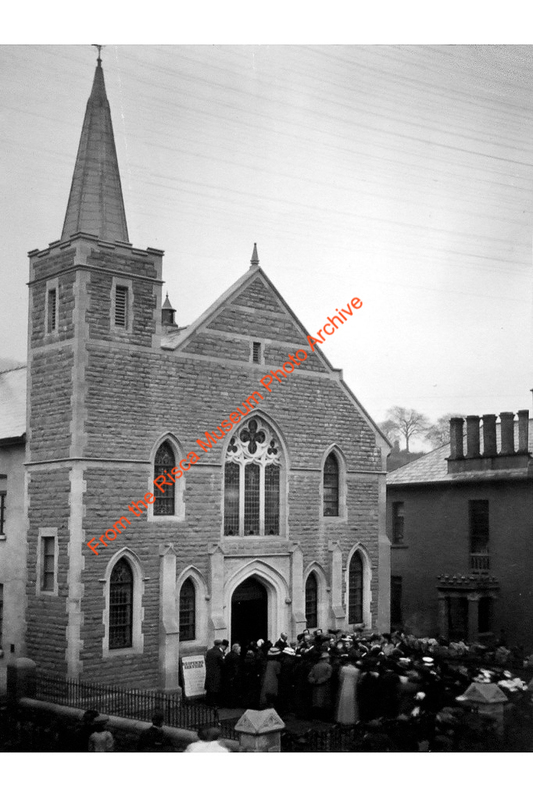 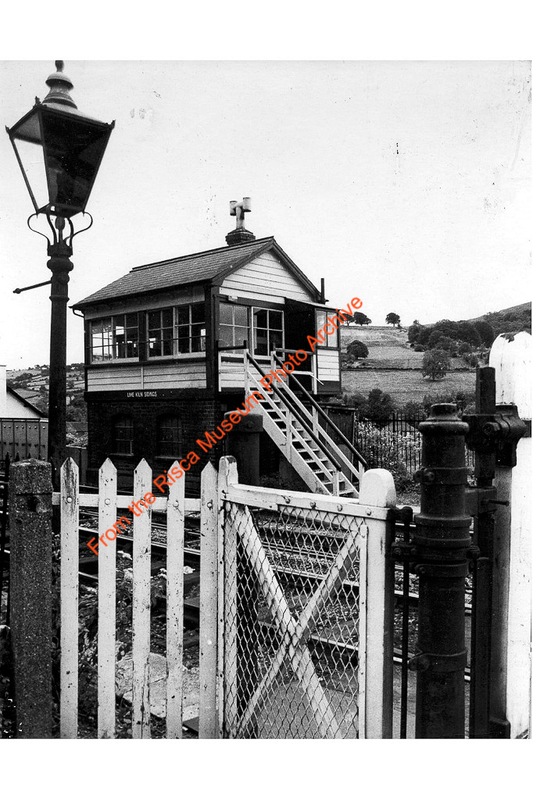 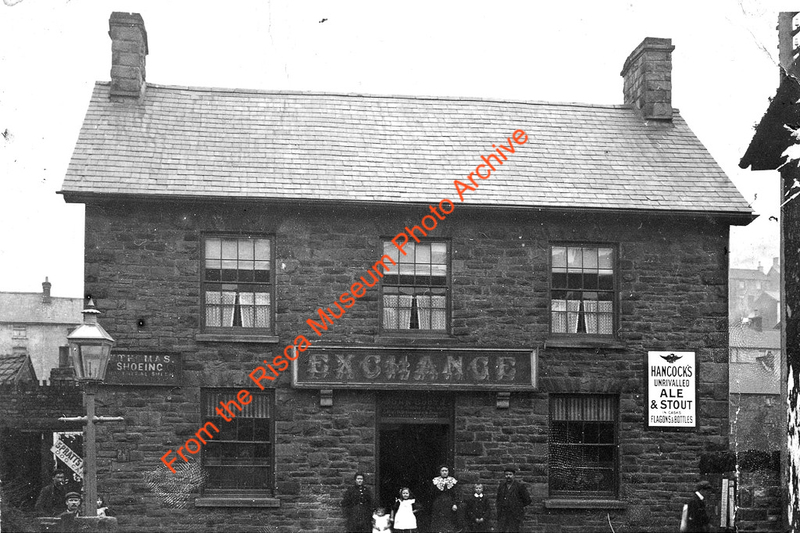 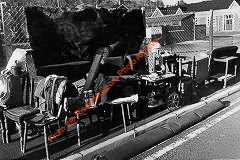 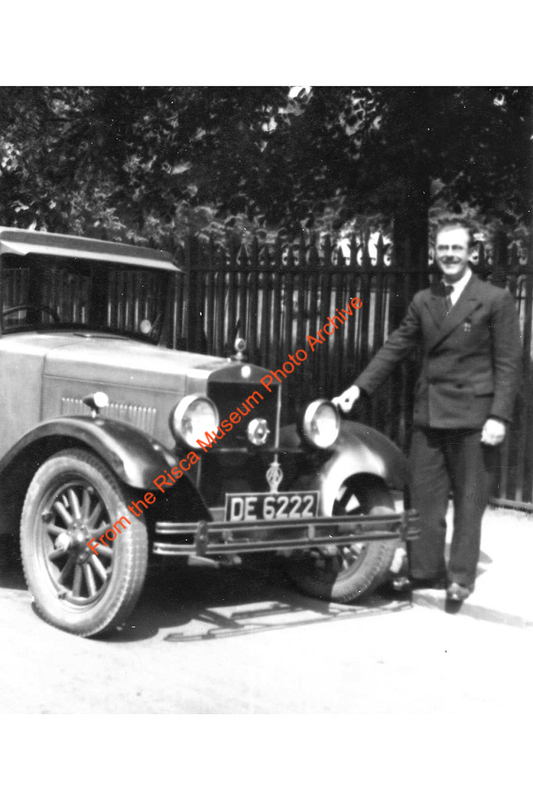 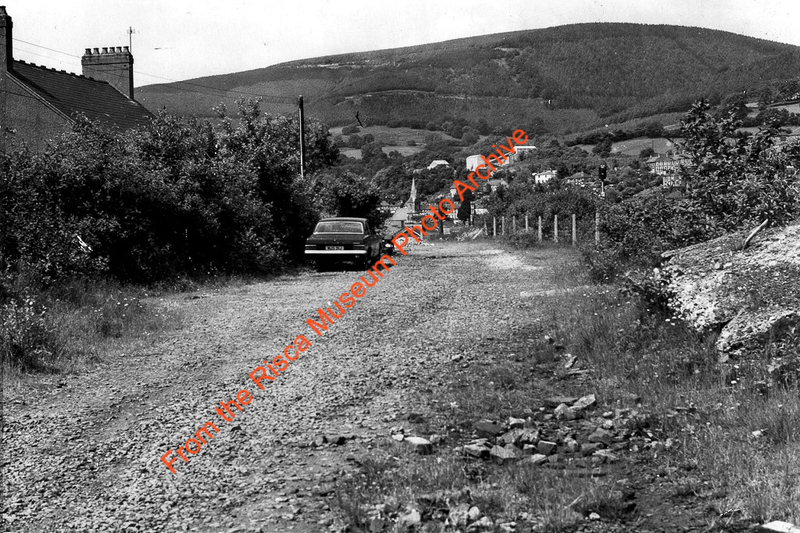 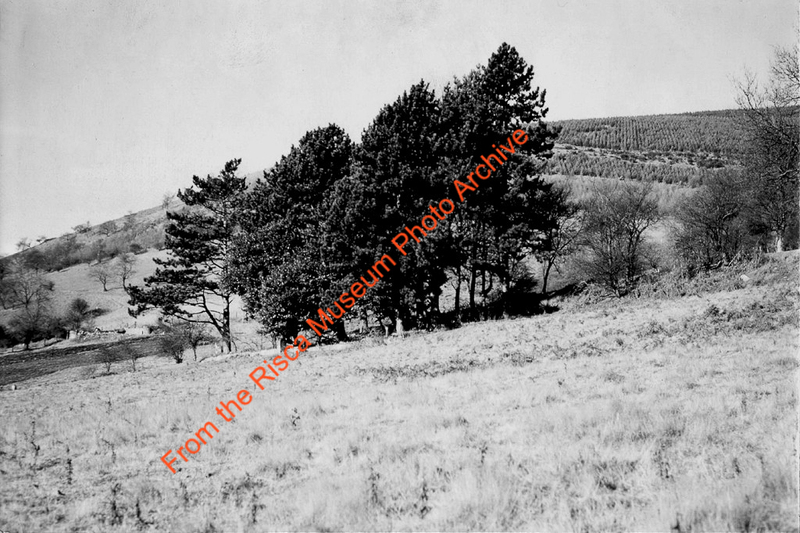 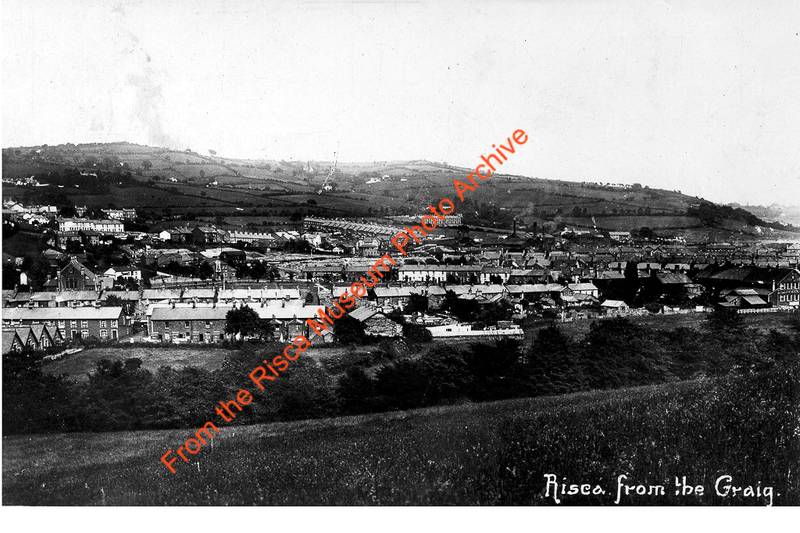 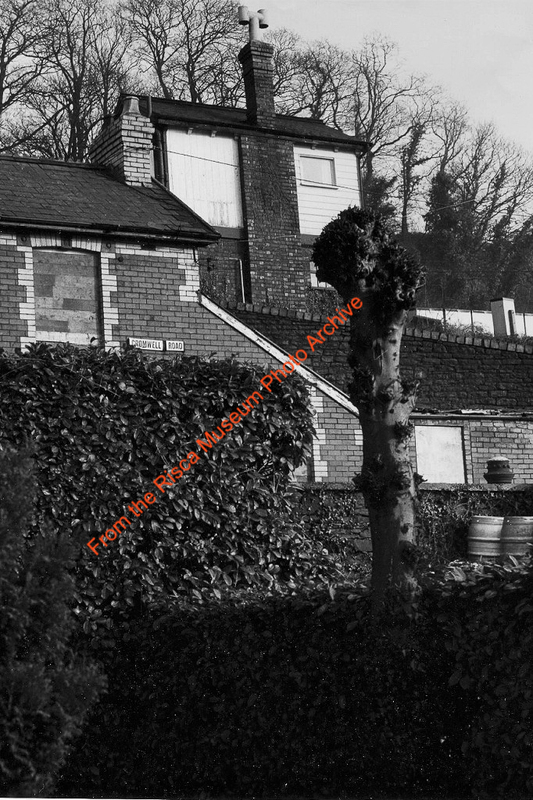 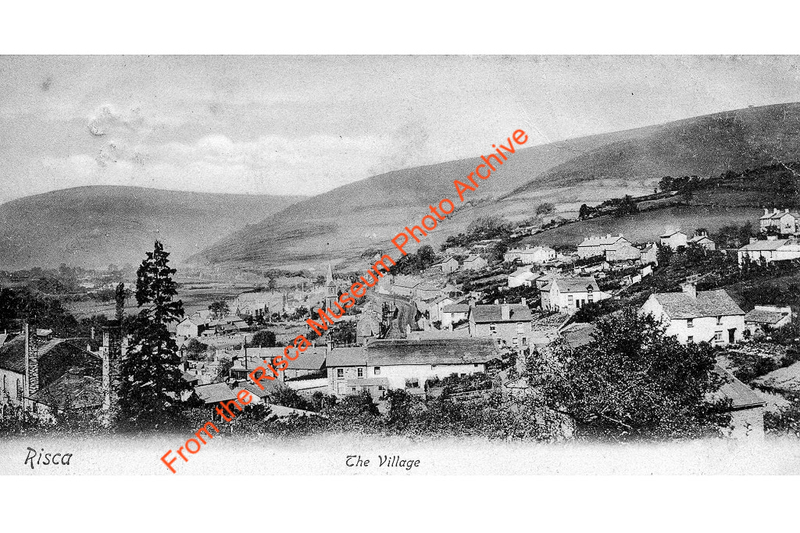 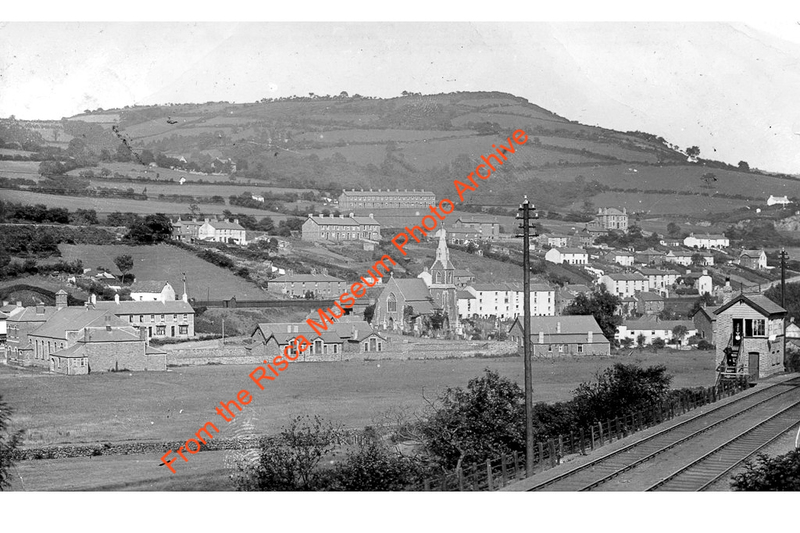 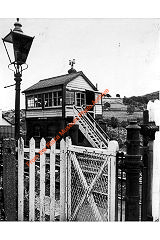 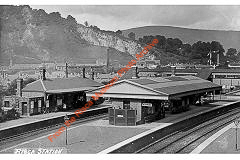 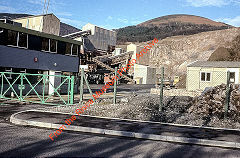 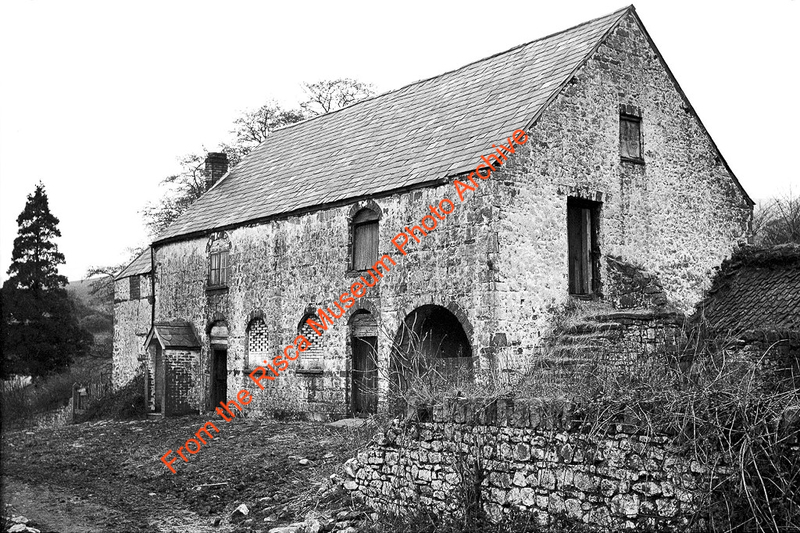 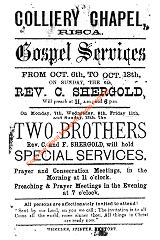 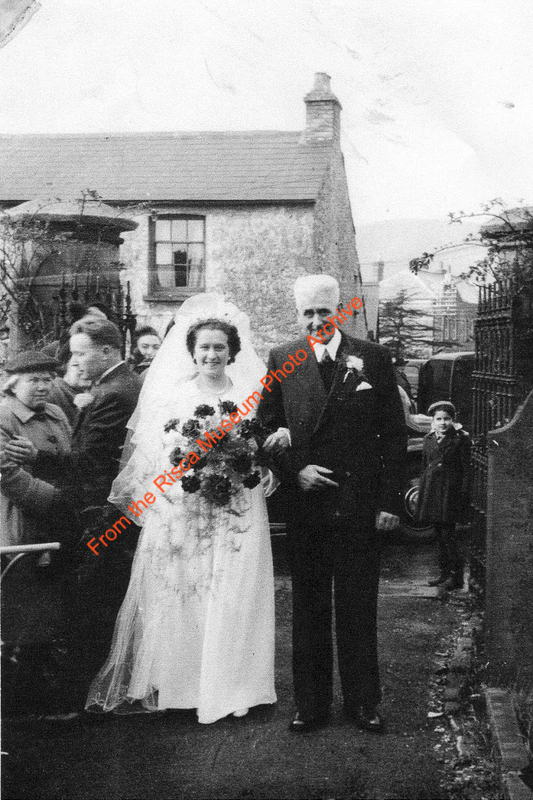 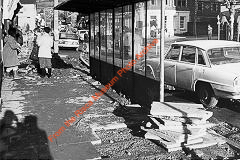 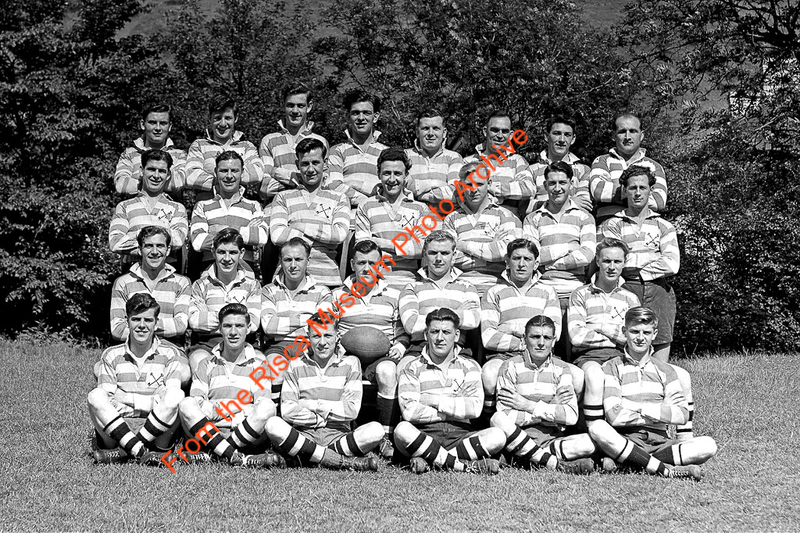 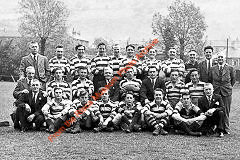 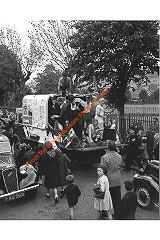 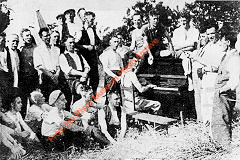 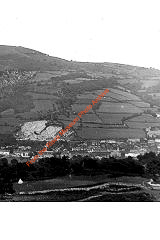 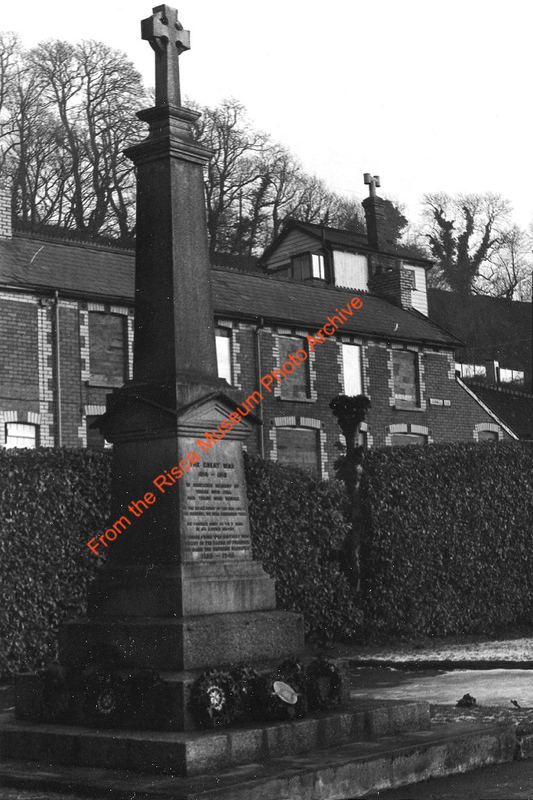 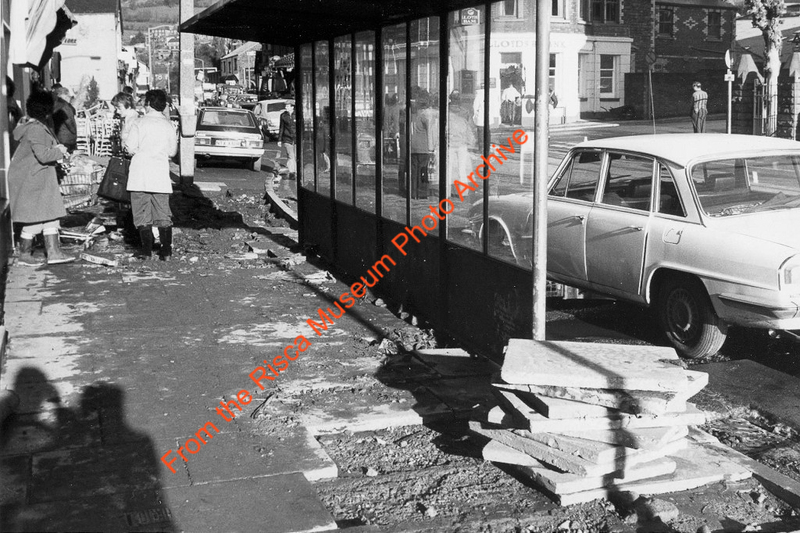 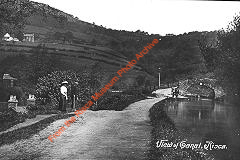 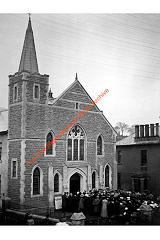 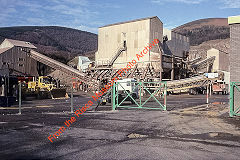 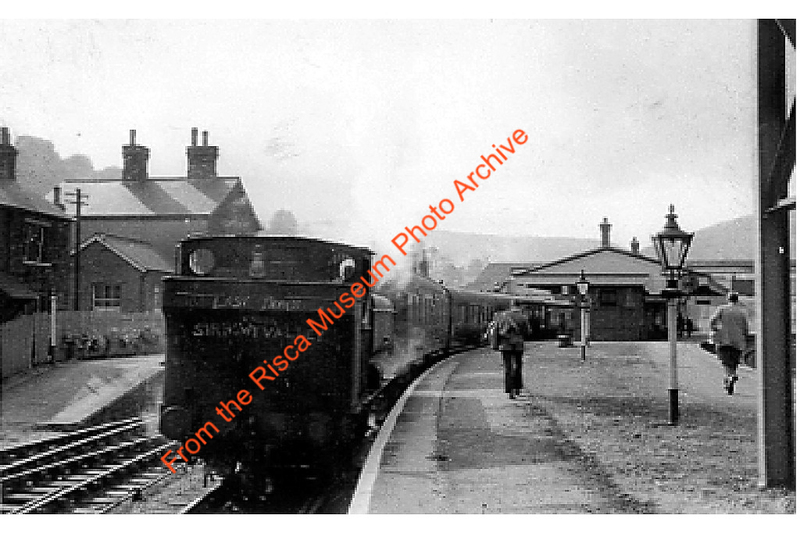 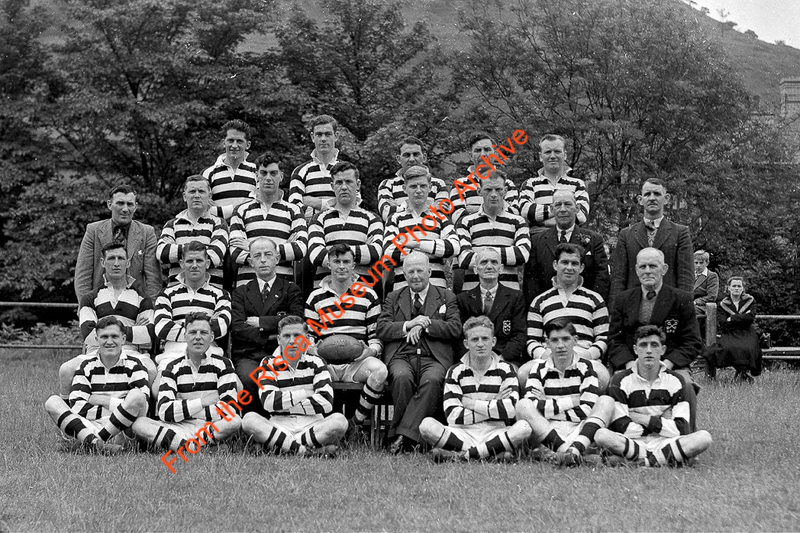 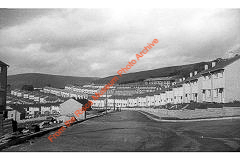 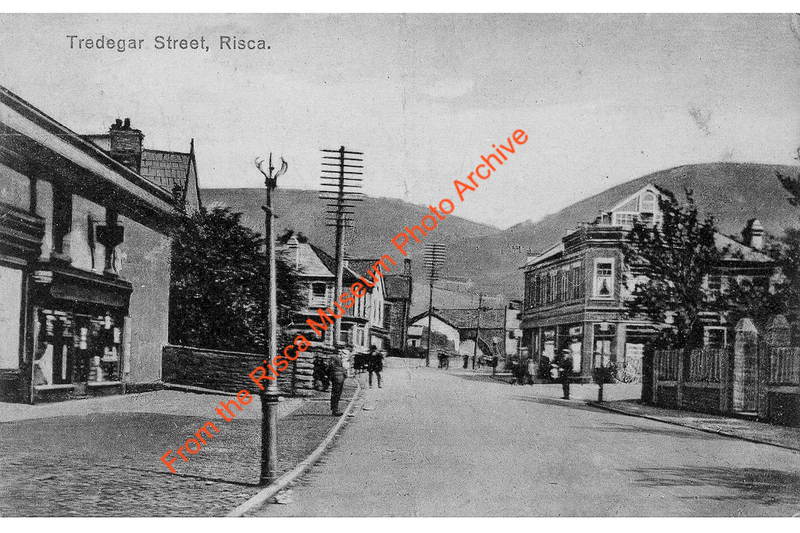 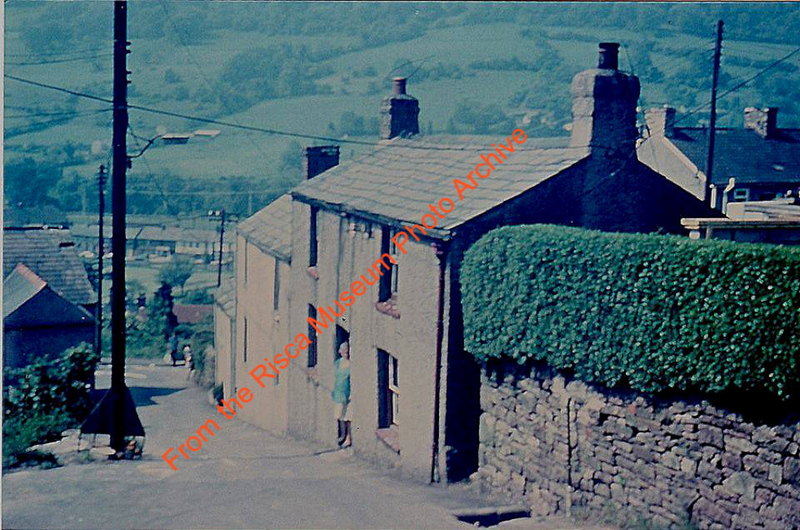 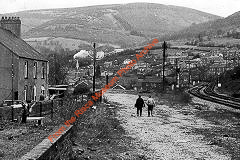 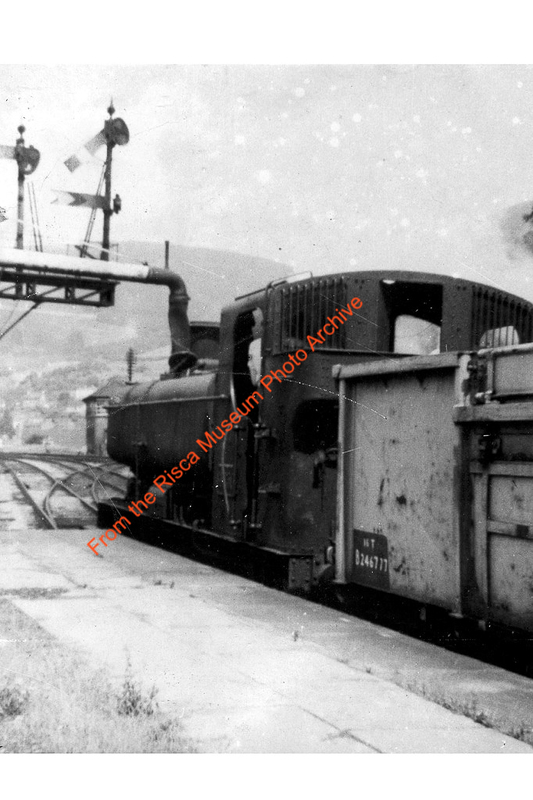 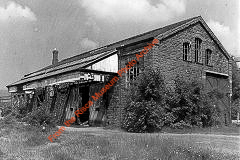 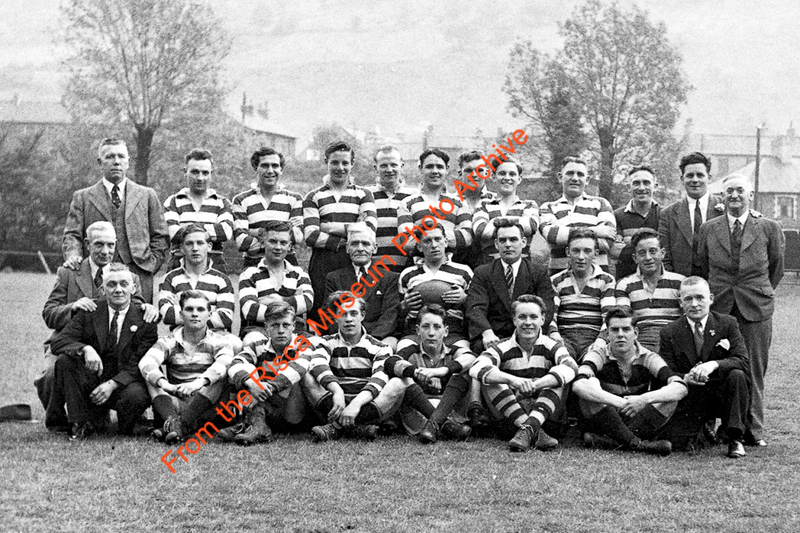 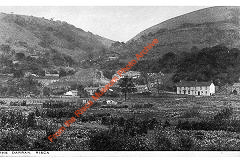 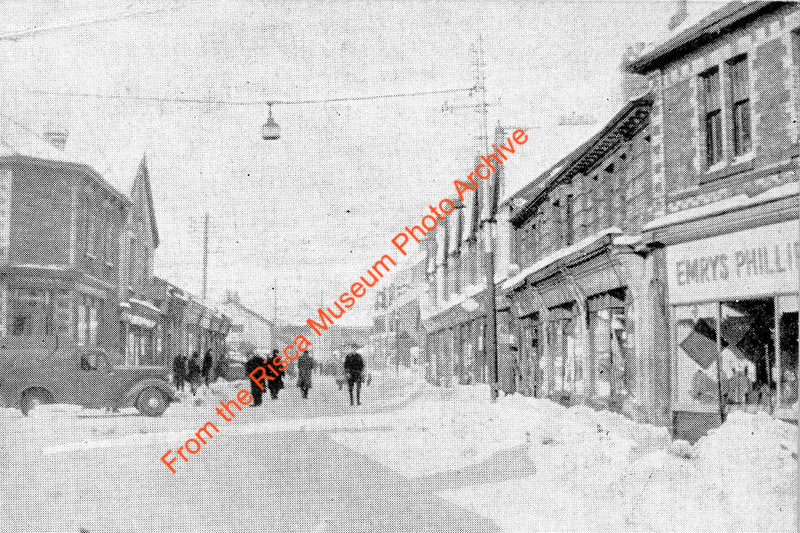 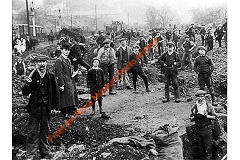 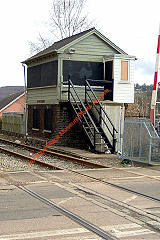 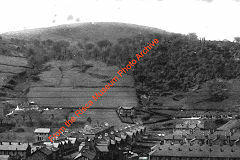 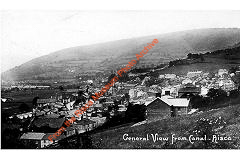 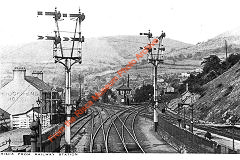 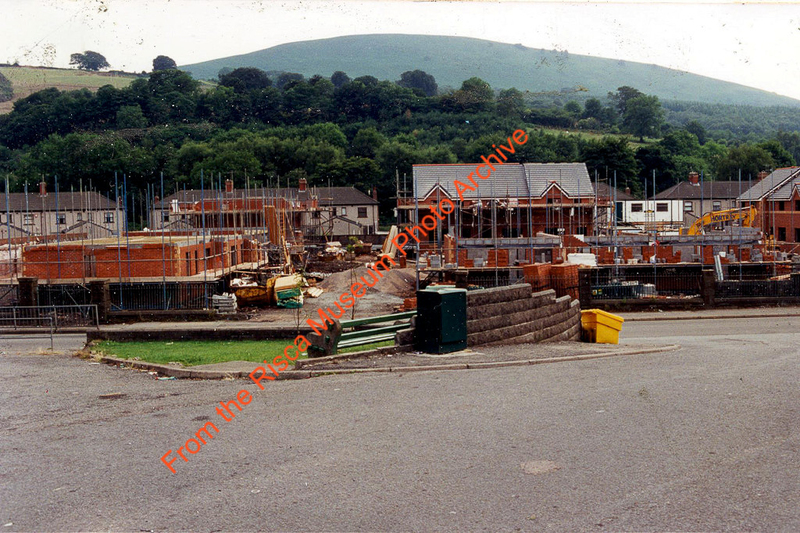 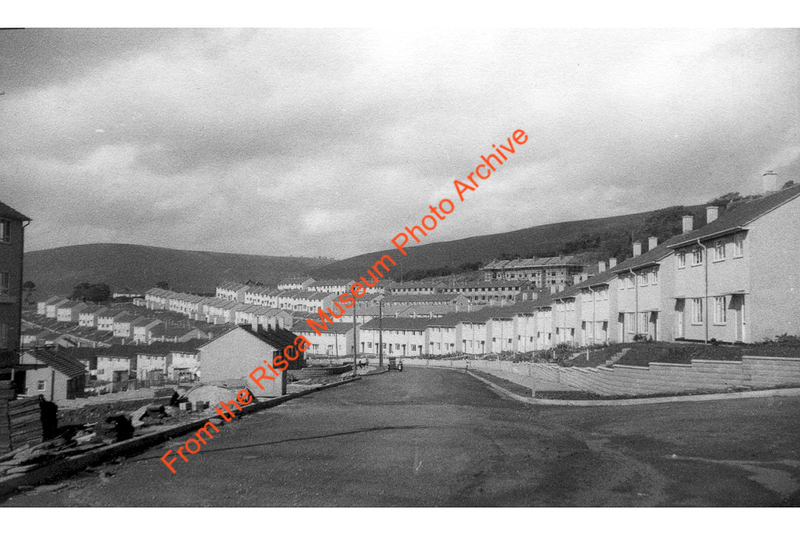 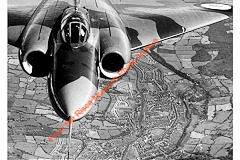 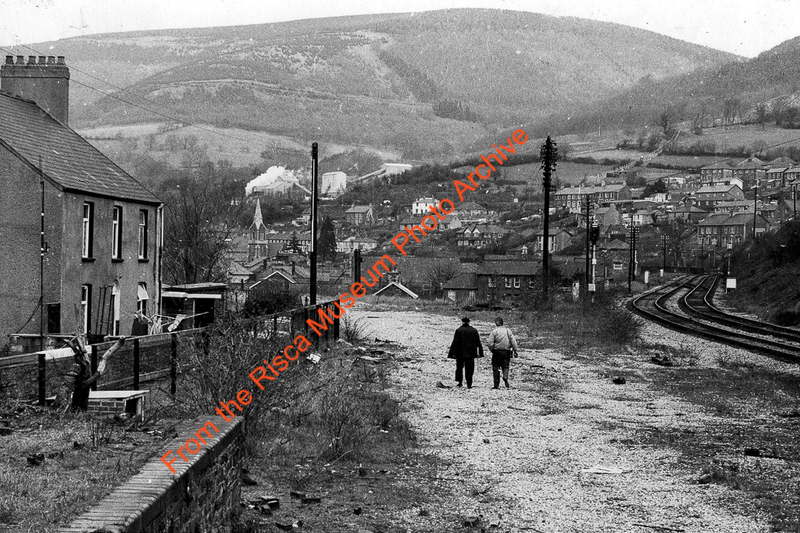 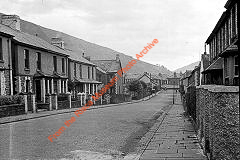 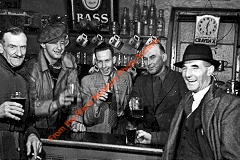 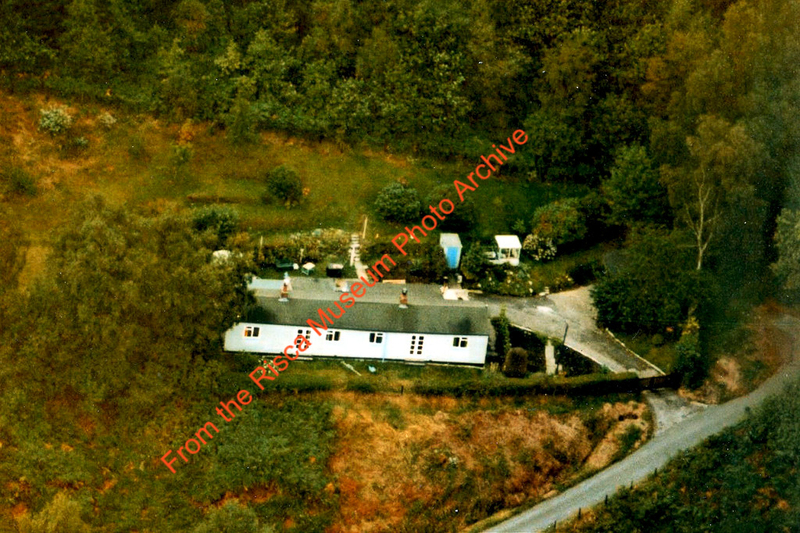 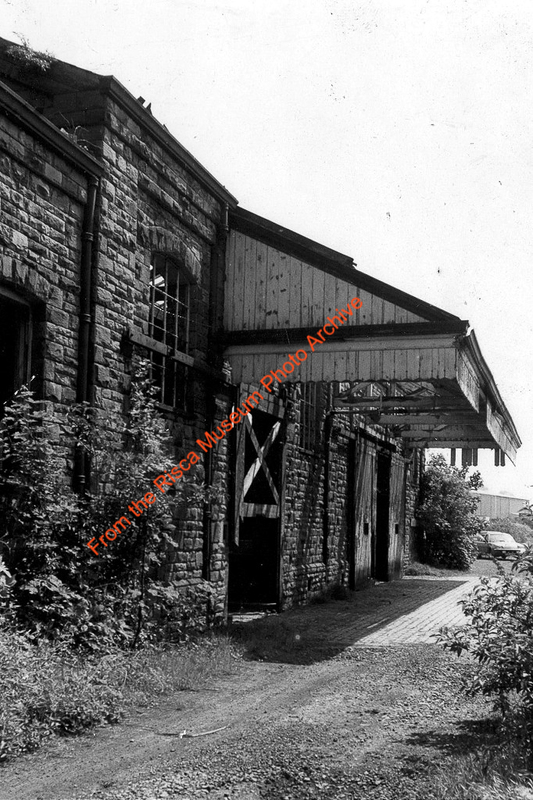 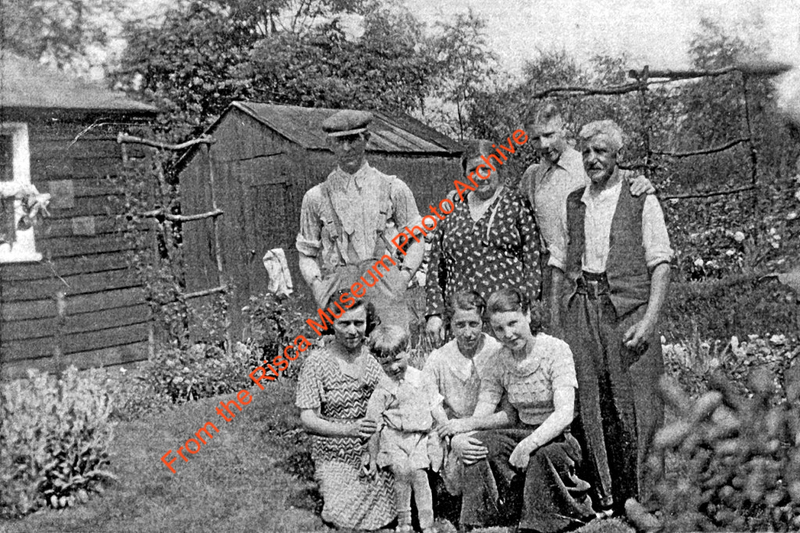 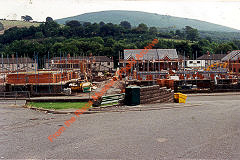 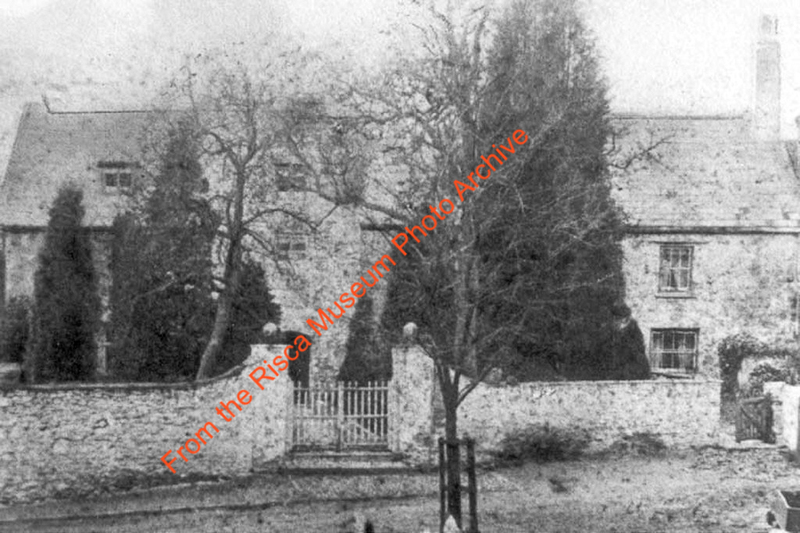 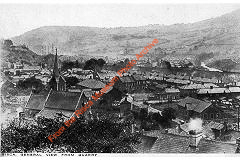 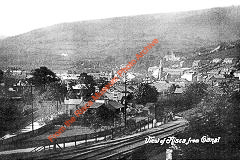 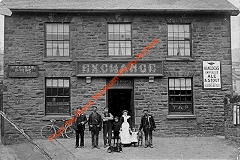 ...currently consists of around 1500 photos mainly covers from Rogerstone to Abercarn, though there are some interesting photos from elsewhere. 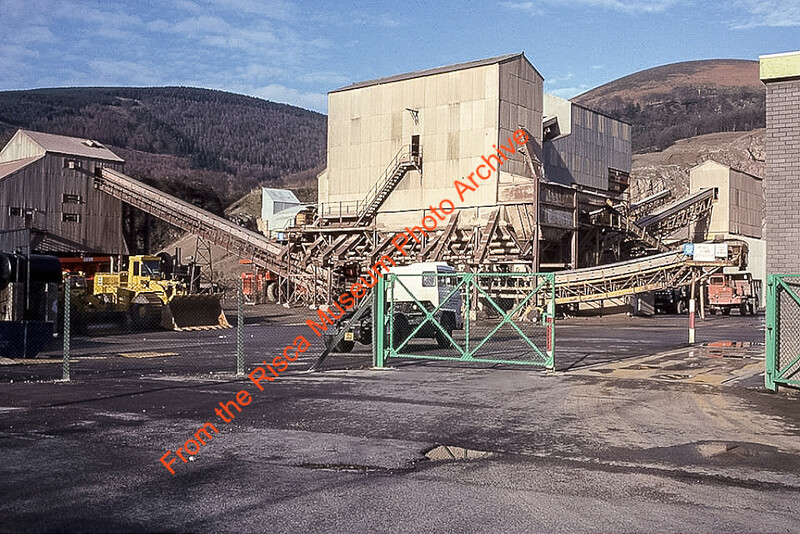 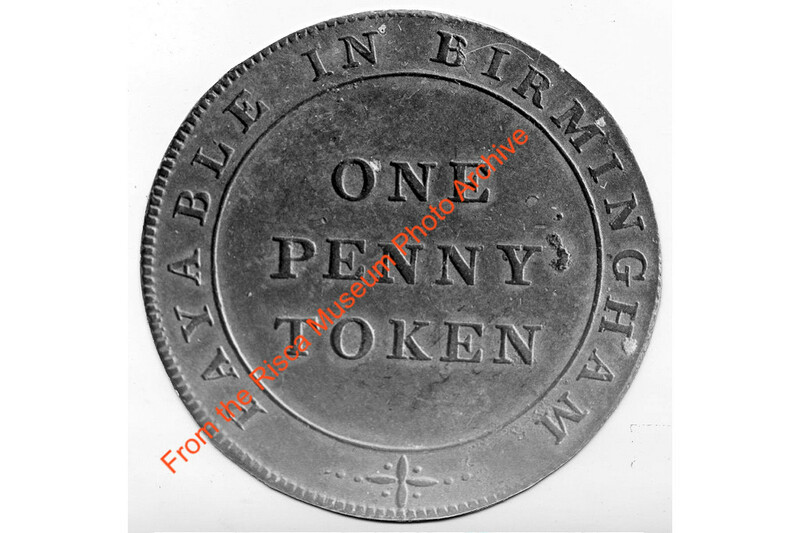 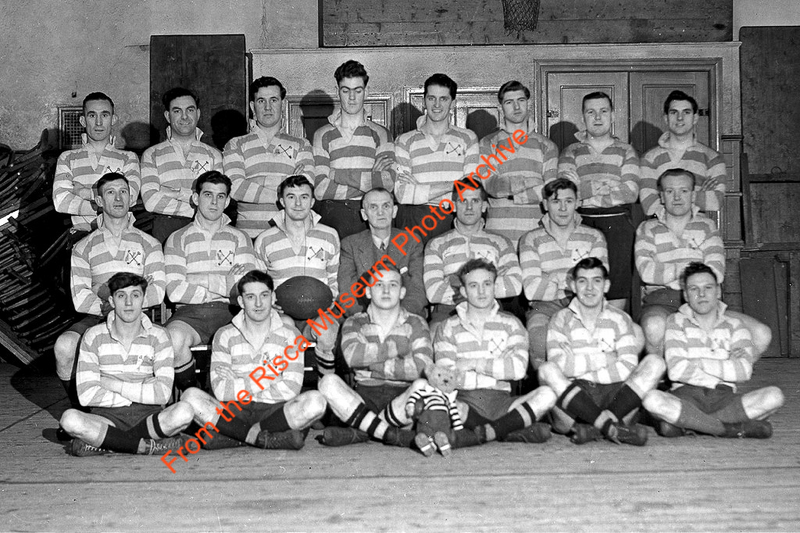 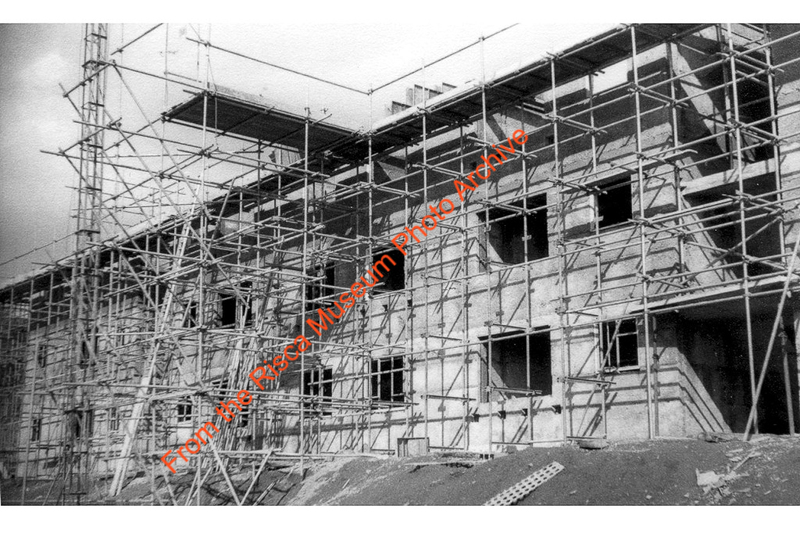 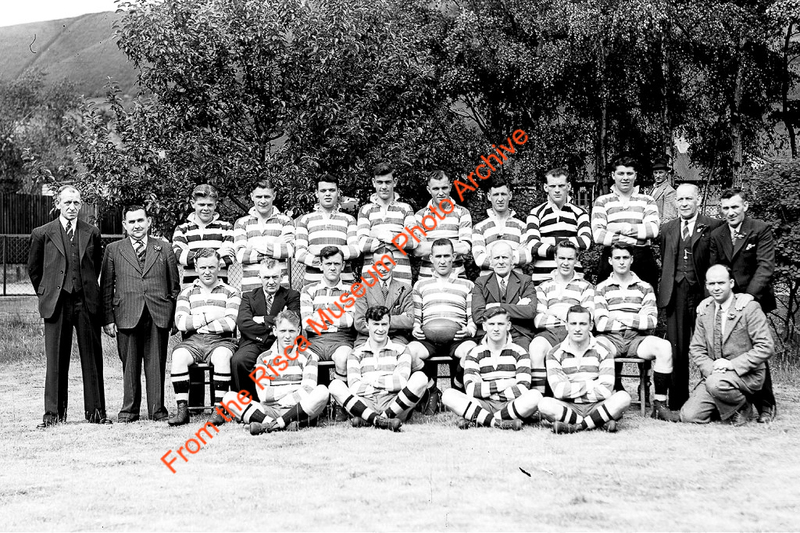 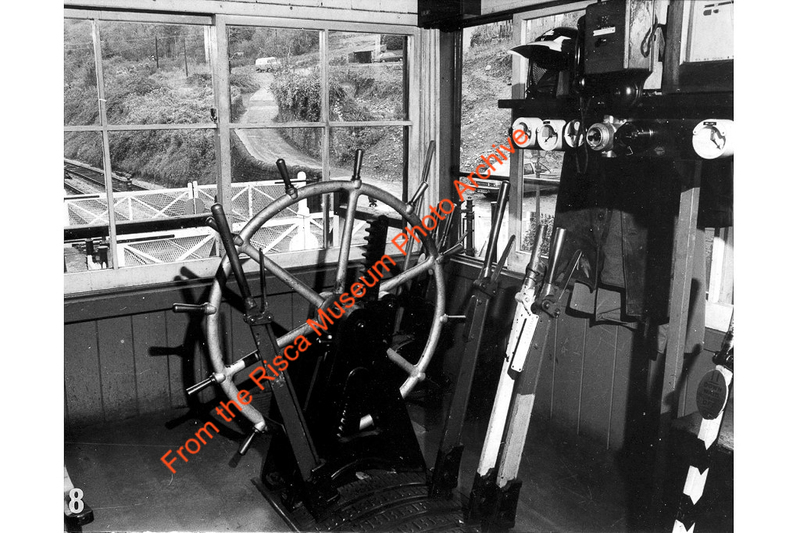 All the photos have been digitised but there are a few hundred slides to be processed eventually as these are more difficult to scan. 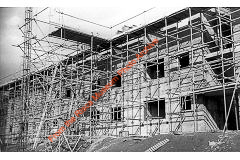 This is 'work-in-progress' so there may be minimal captions and coverage at the moment but other areas will be added in due course. 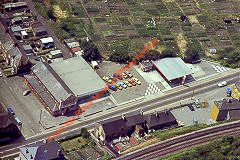 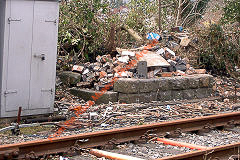 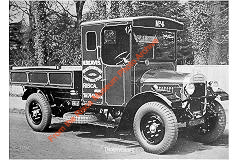 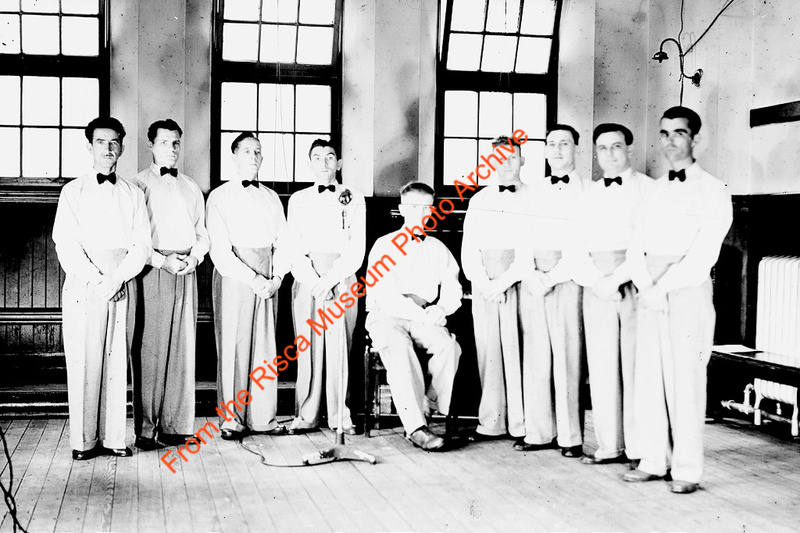 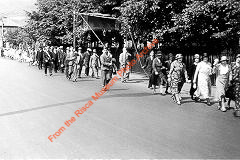 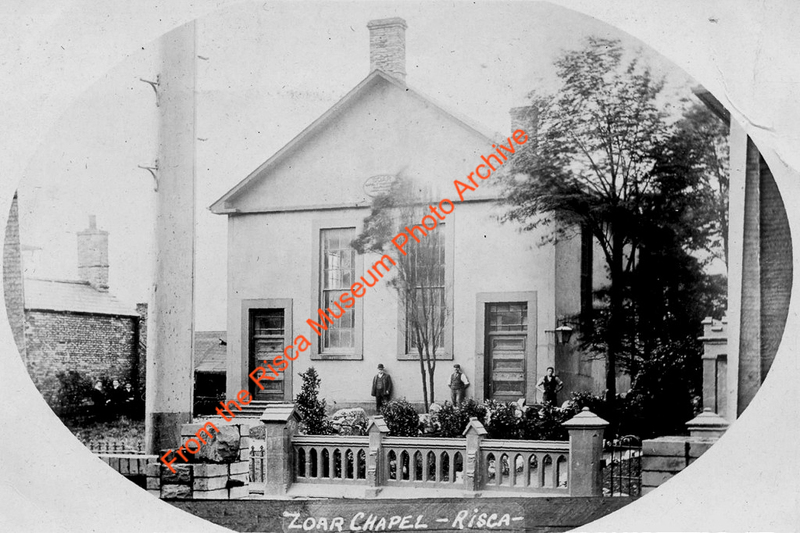 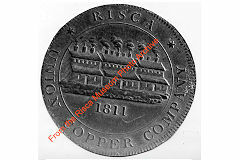 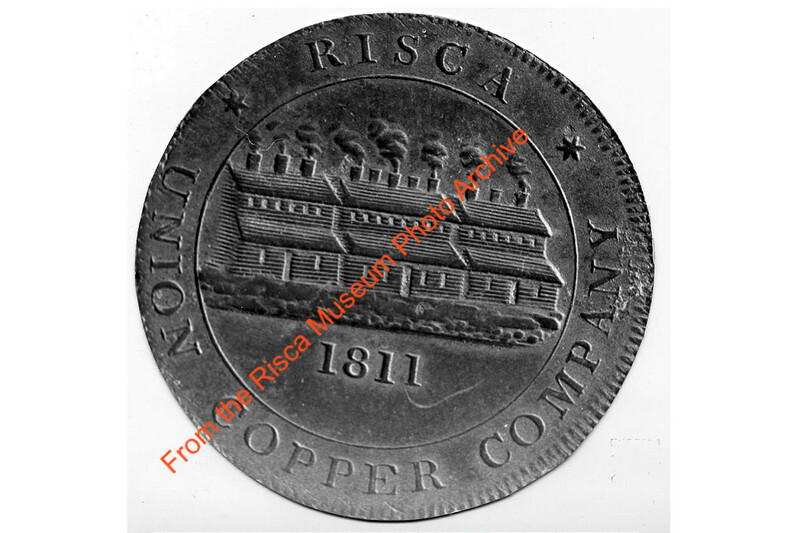 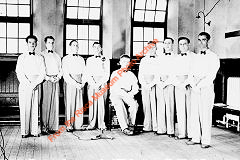 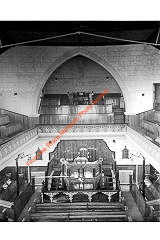 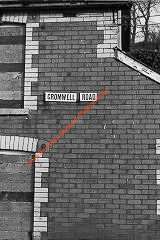 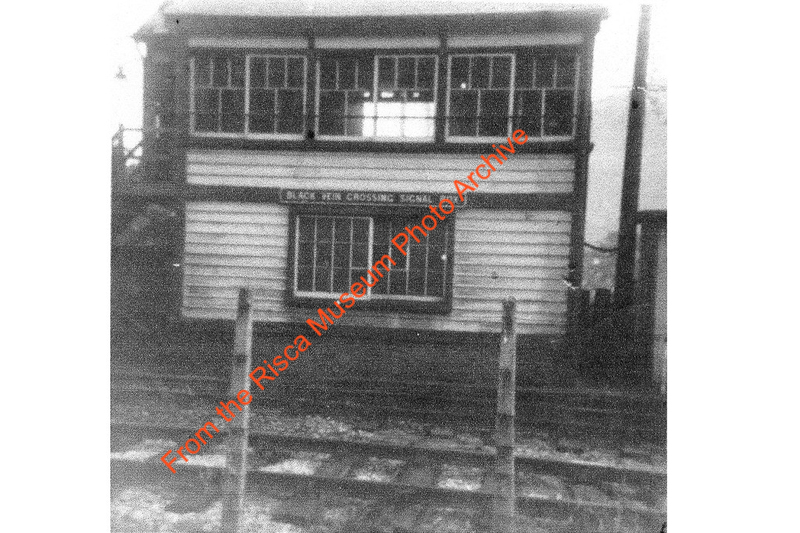 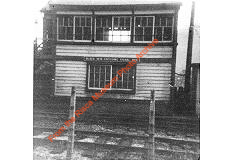 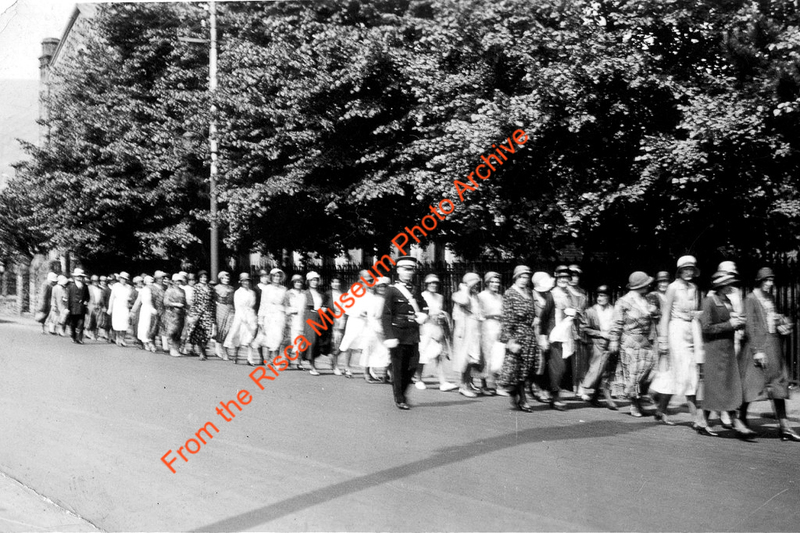 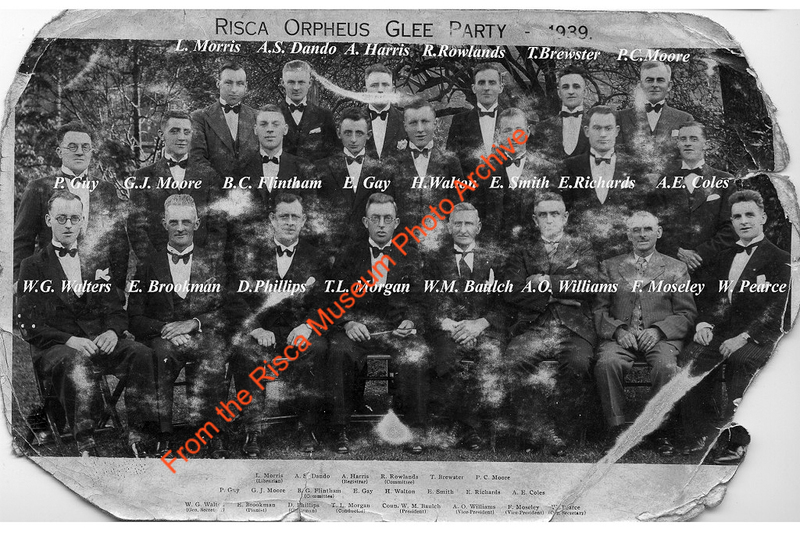 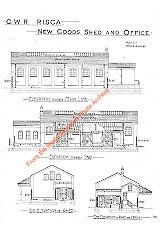 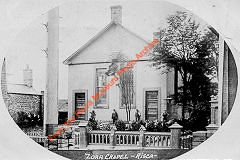 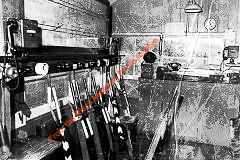 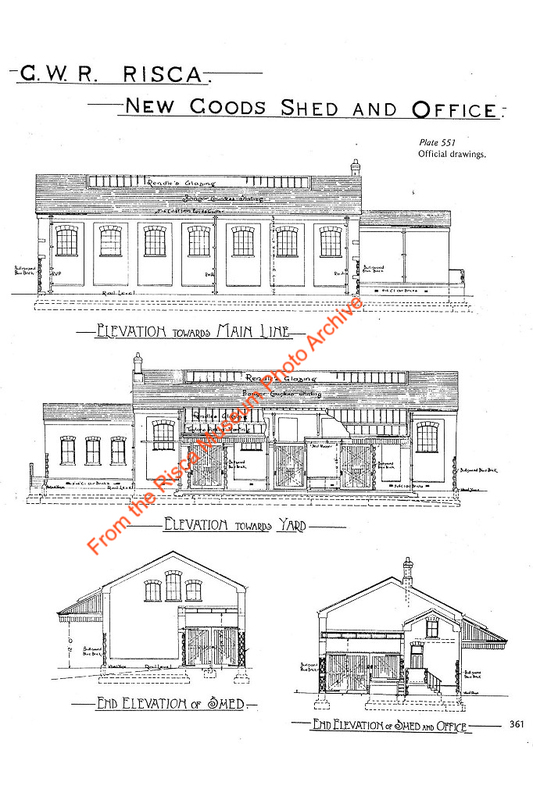 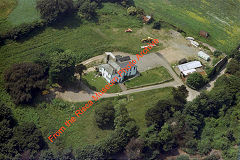 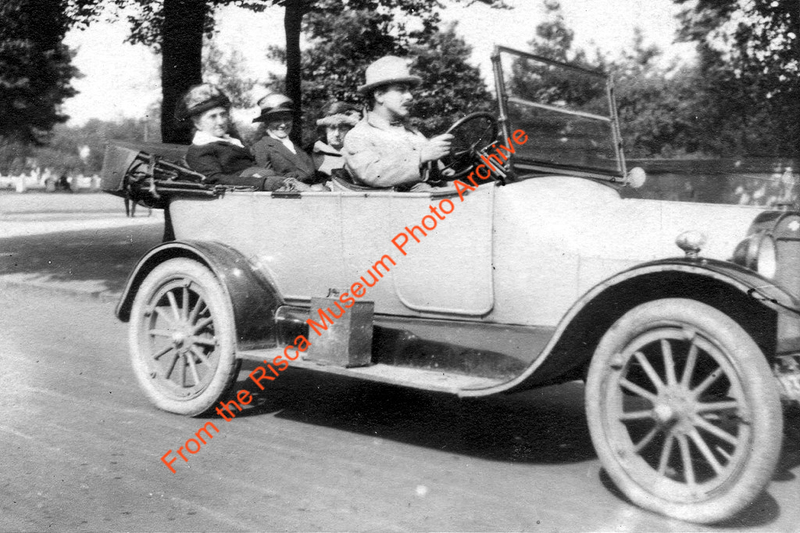 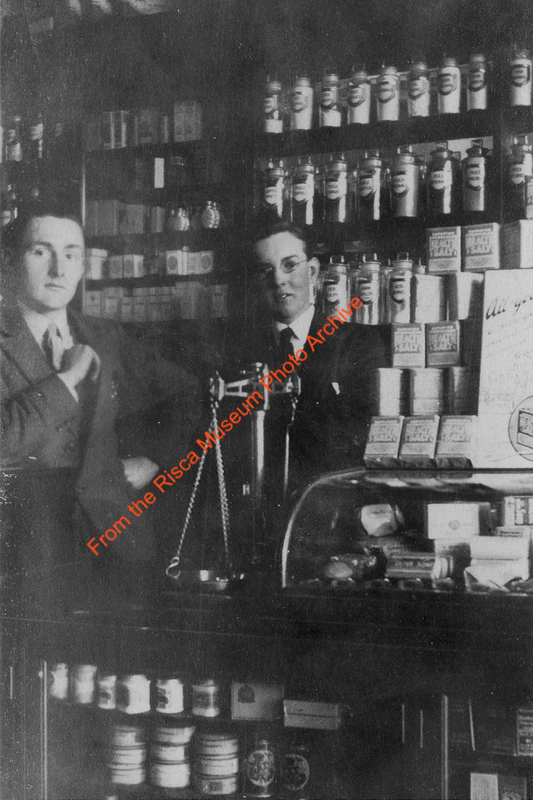 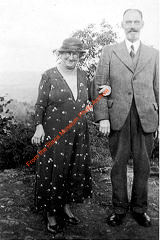 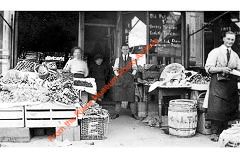 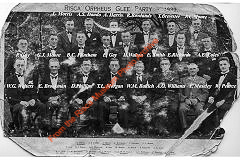 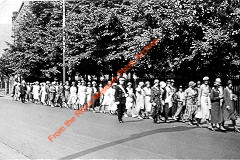 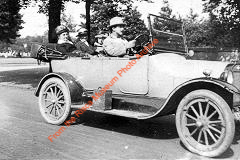 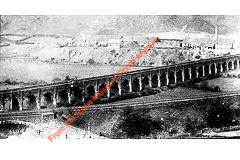 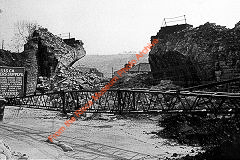 Click on the thumbnail to enlarge a photo or map and sometimes read more about it. 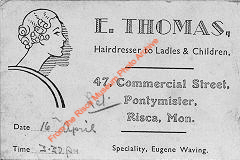 Then click 'Full Size' on the toolbar to see it in all its glory. 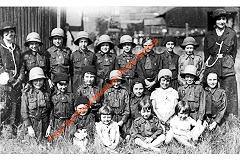 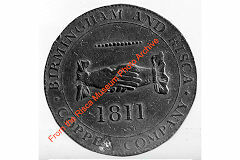 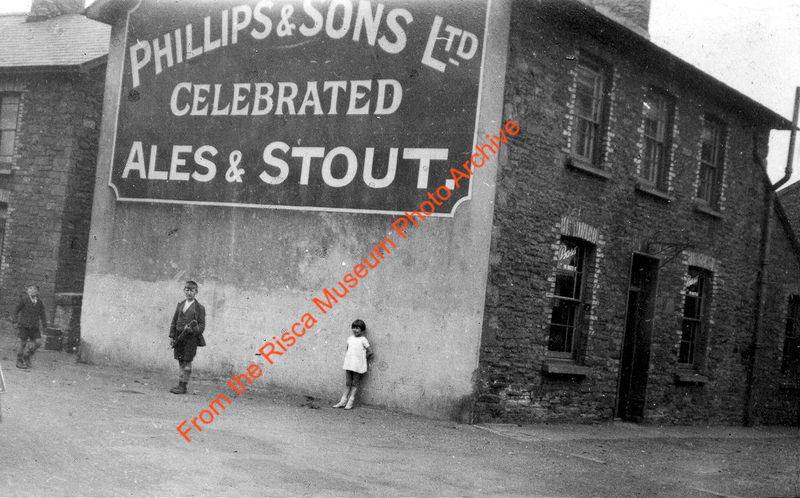 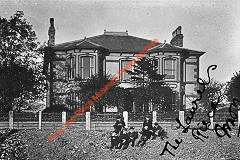 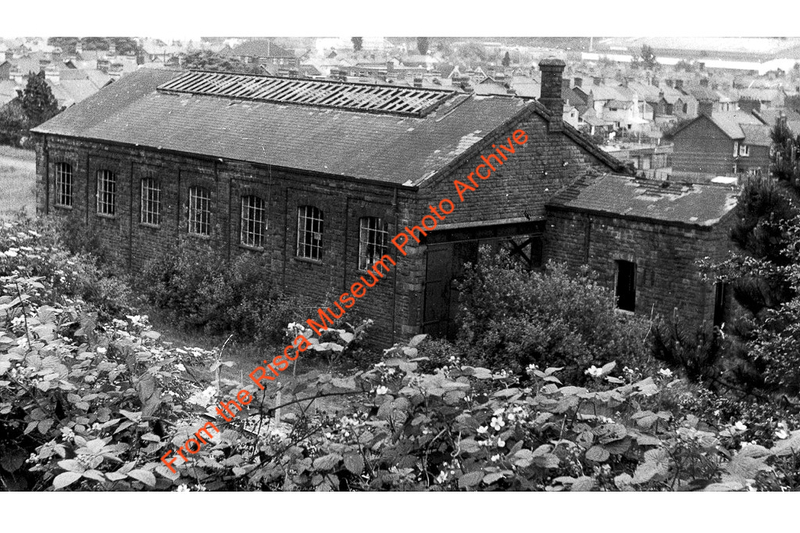 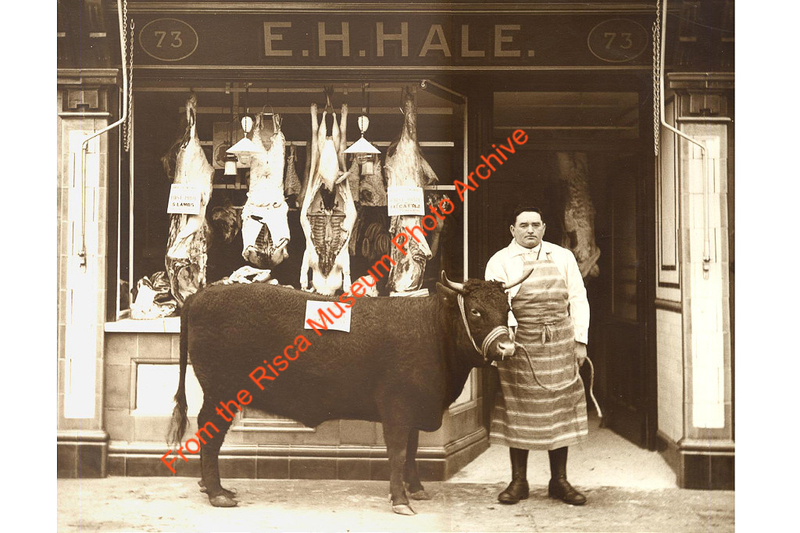 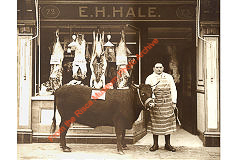 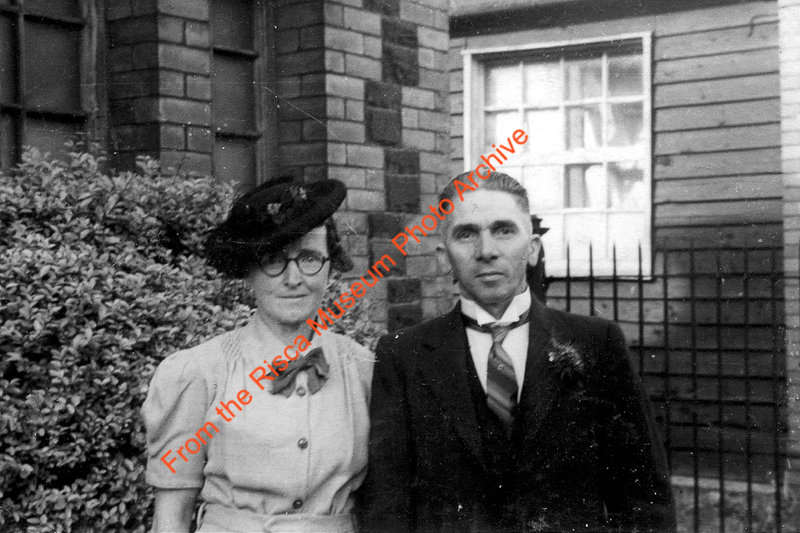 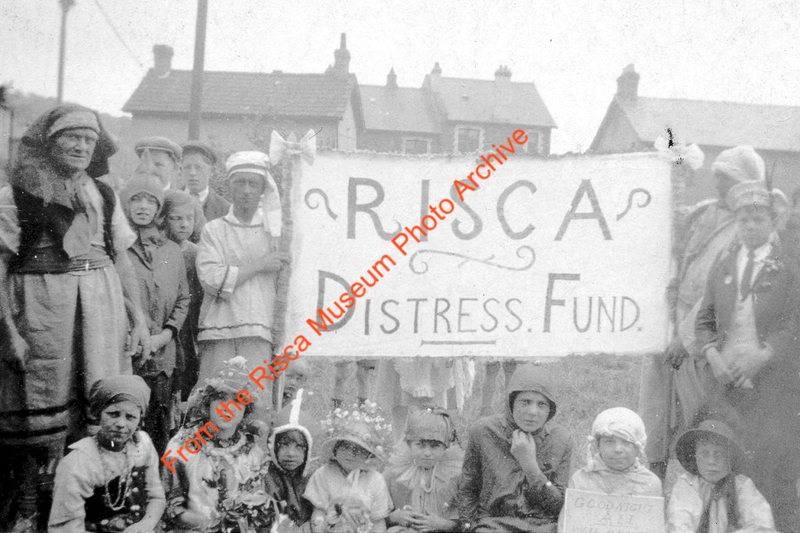 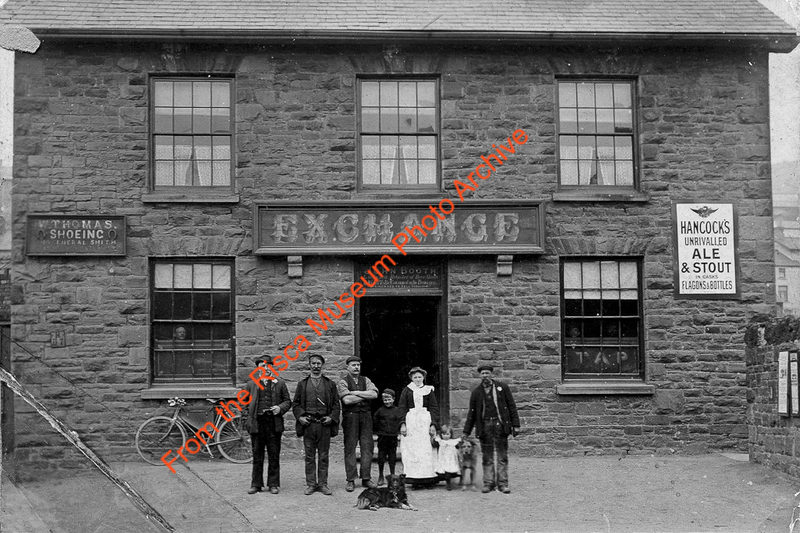 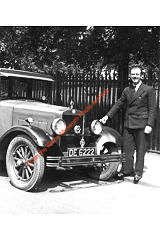 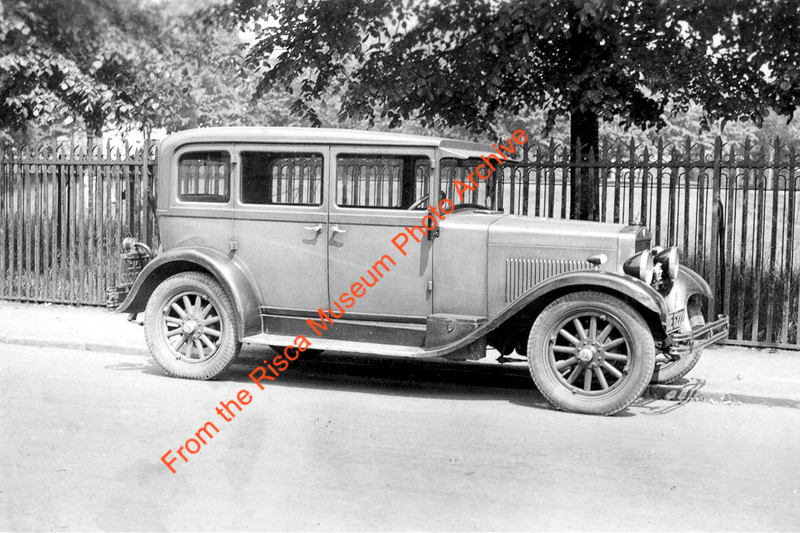 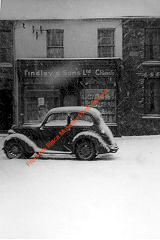 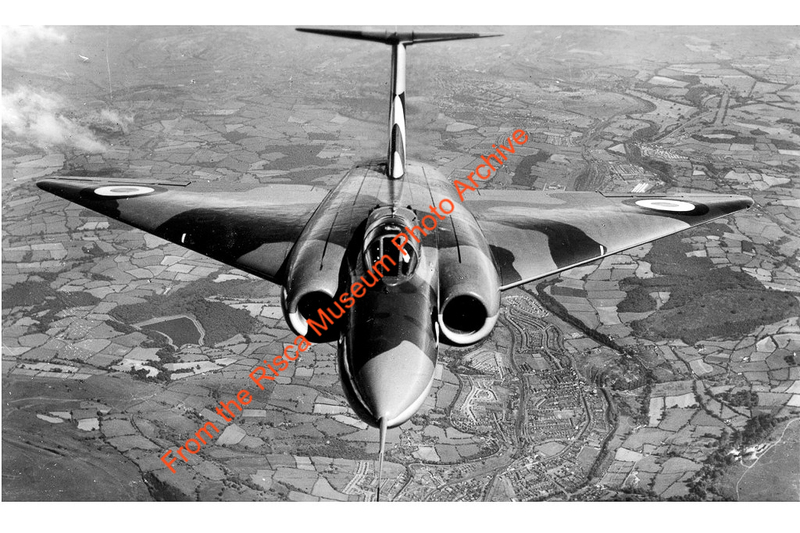 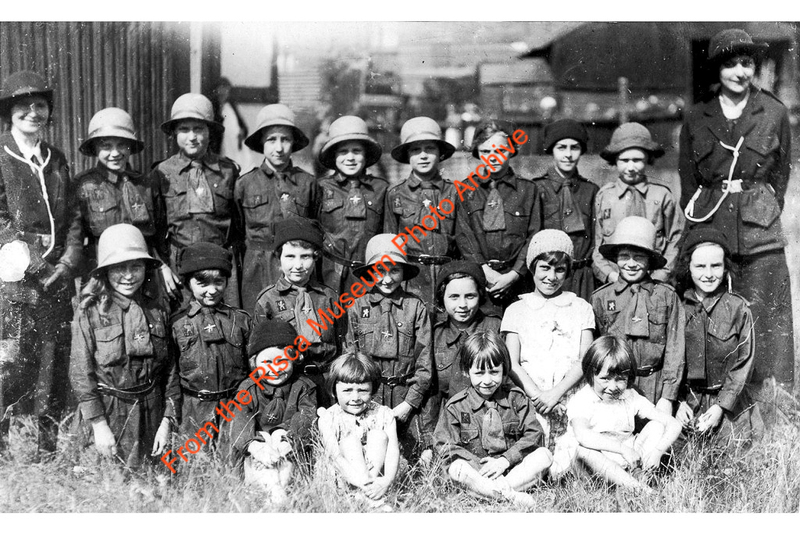 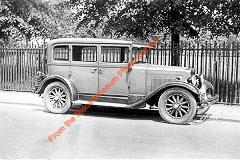 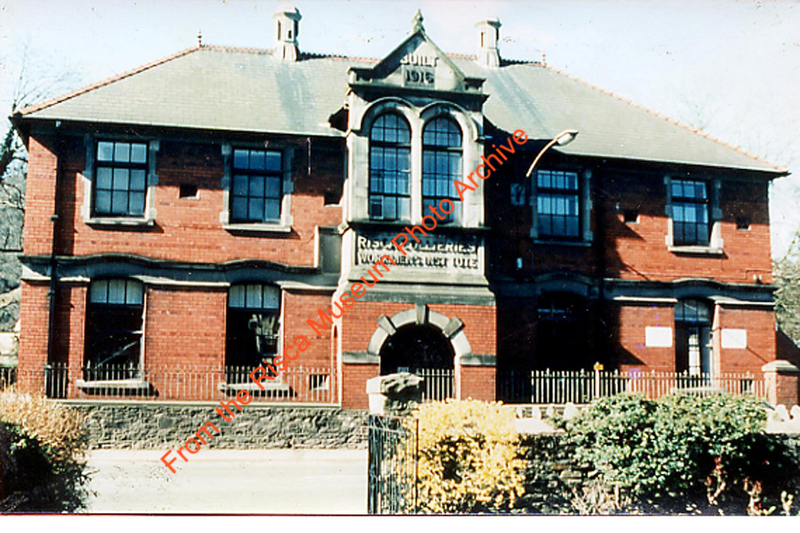 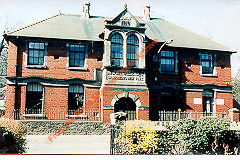 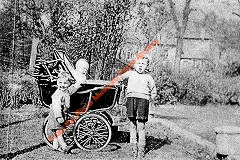 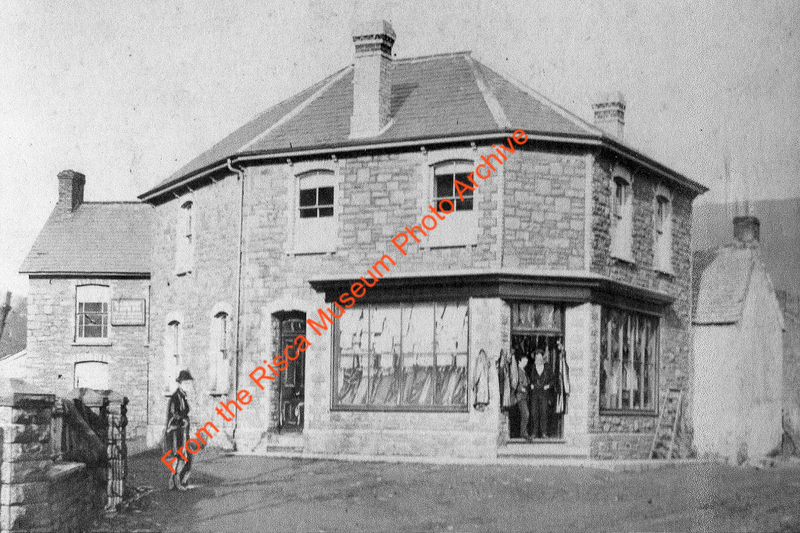 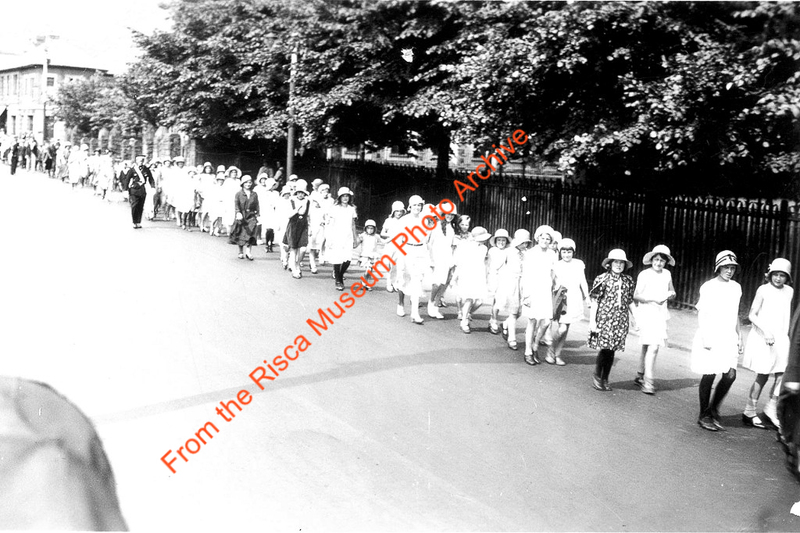 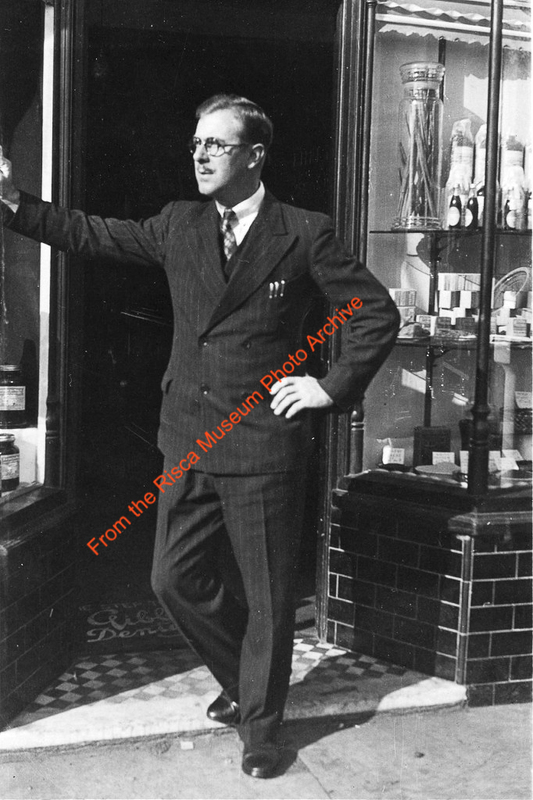 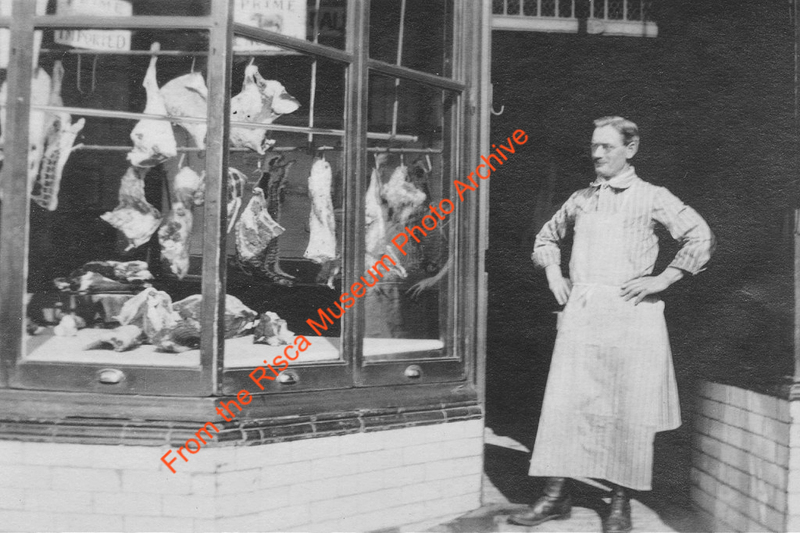 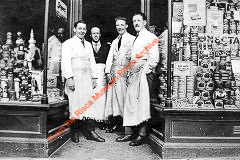 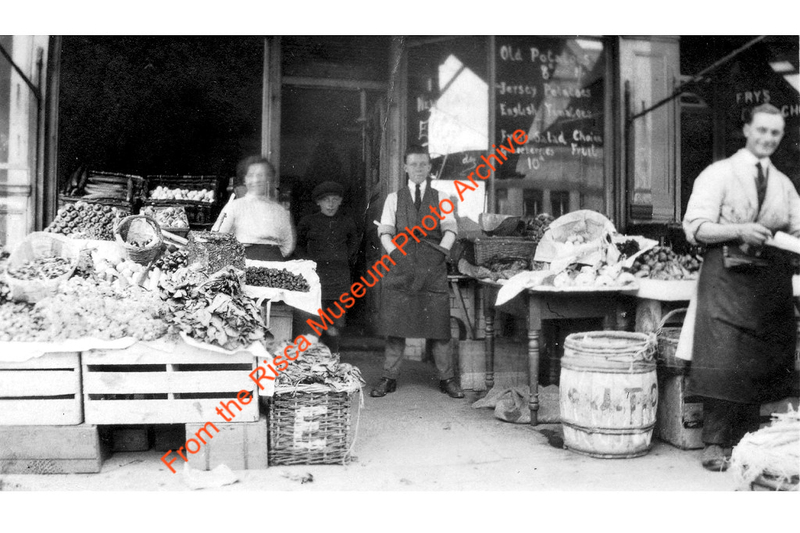 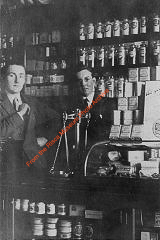 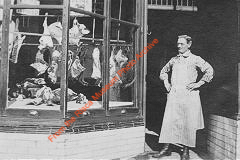 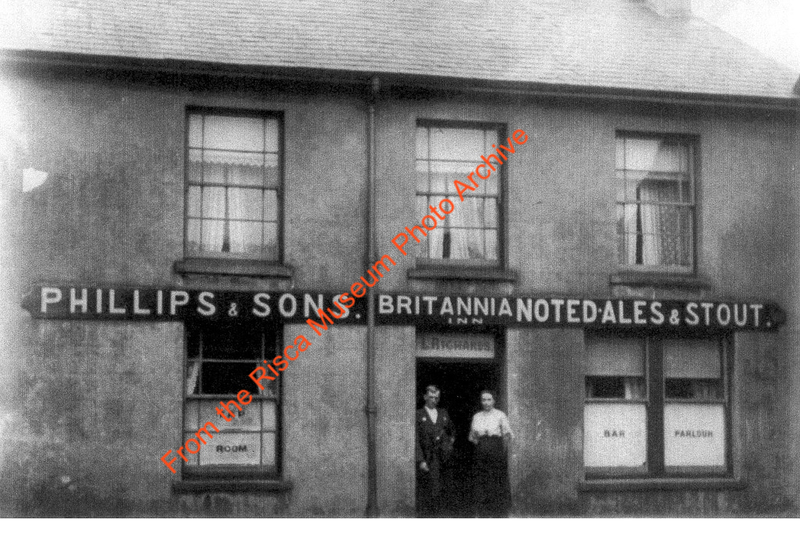 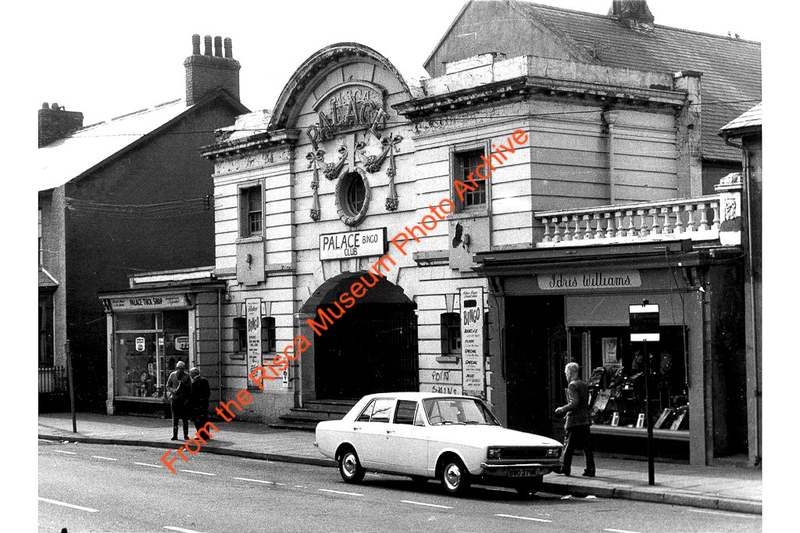 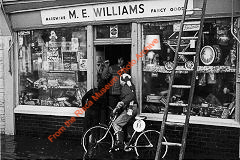 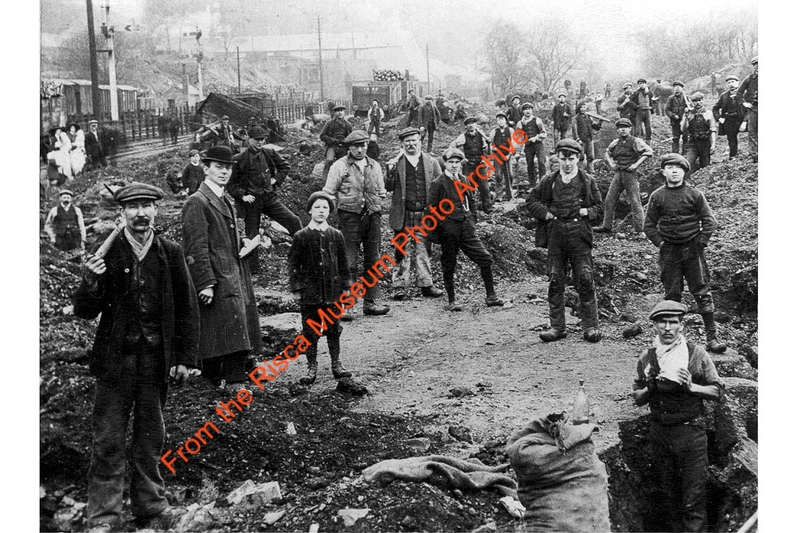 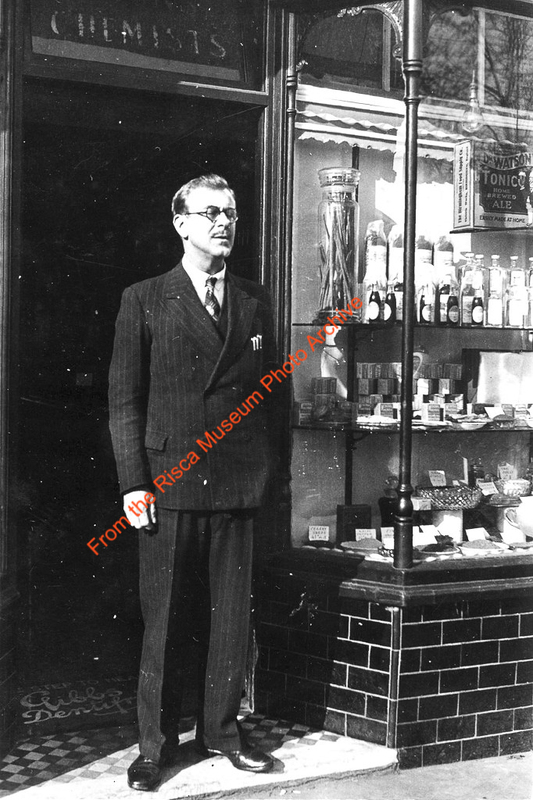 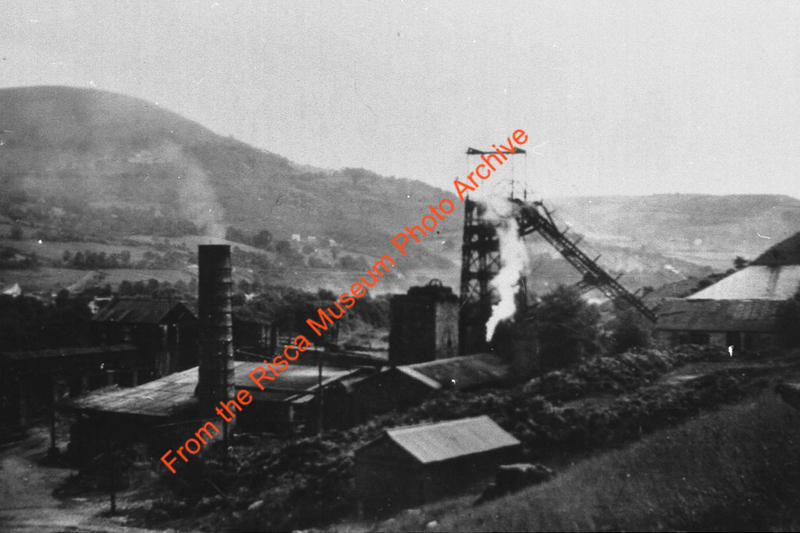 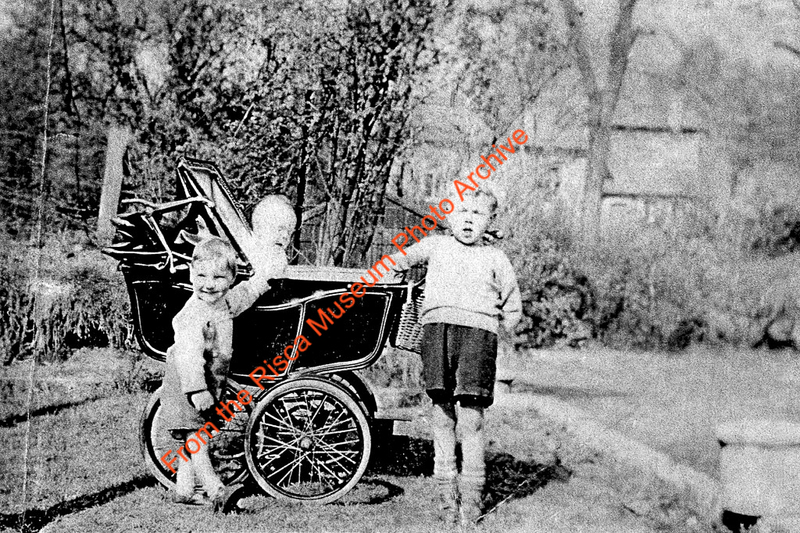 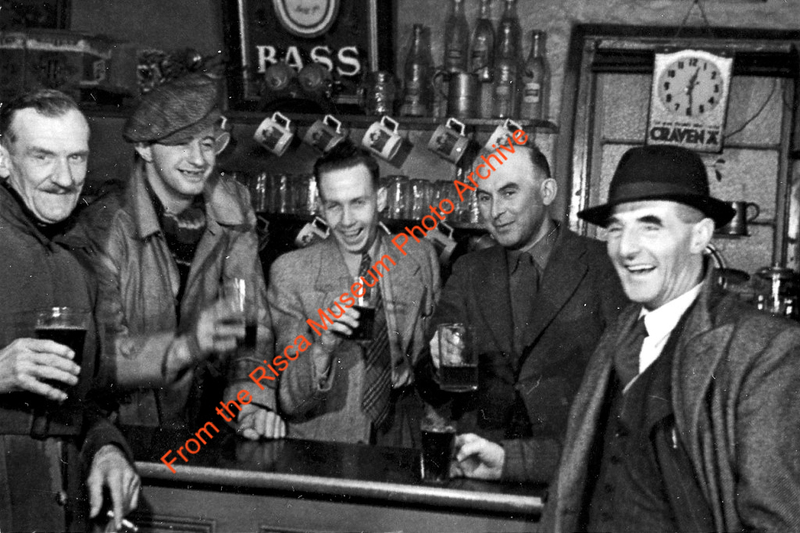 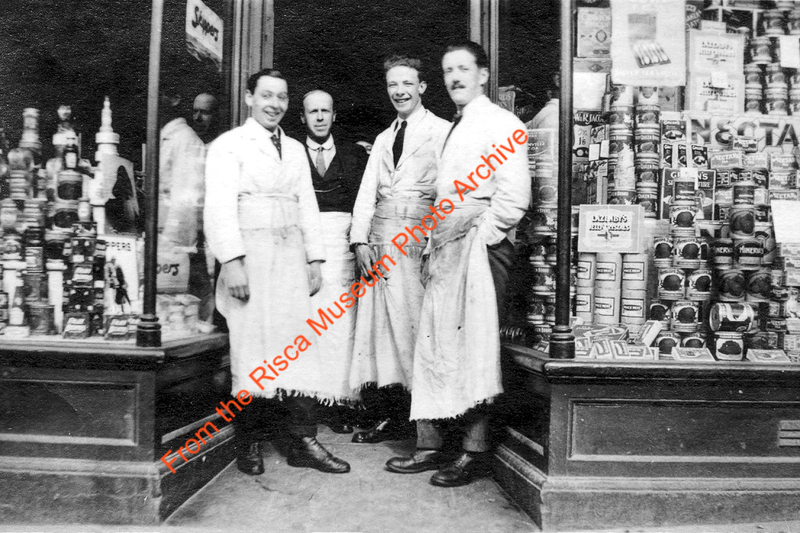 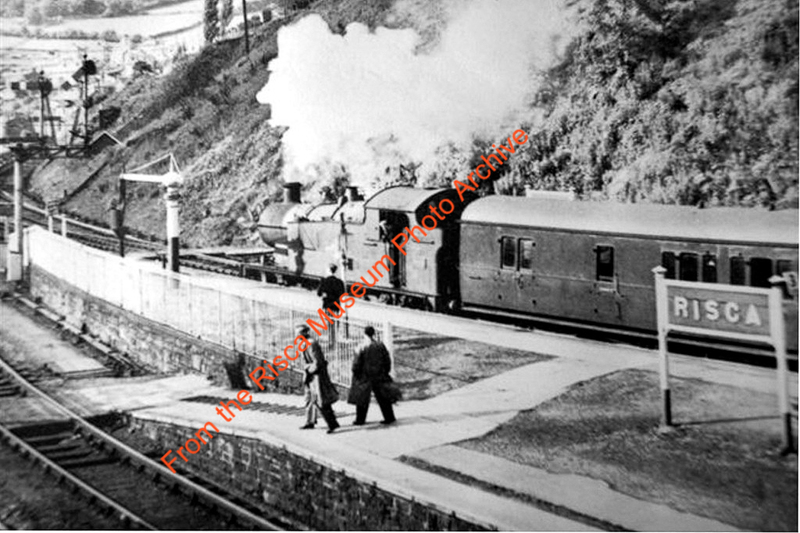 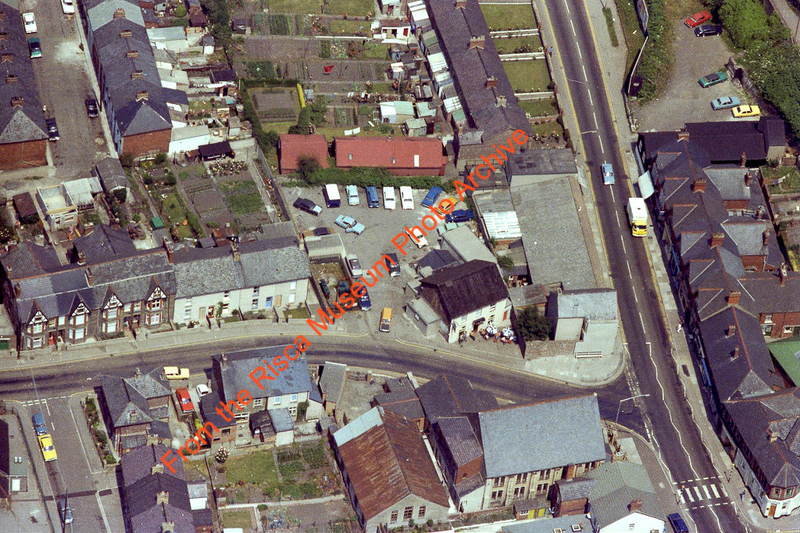 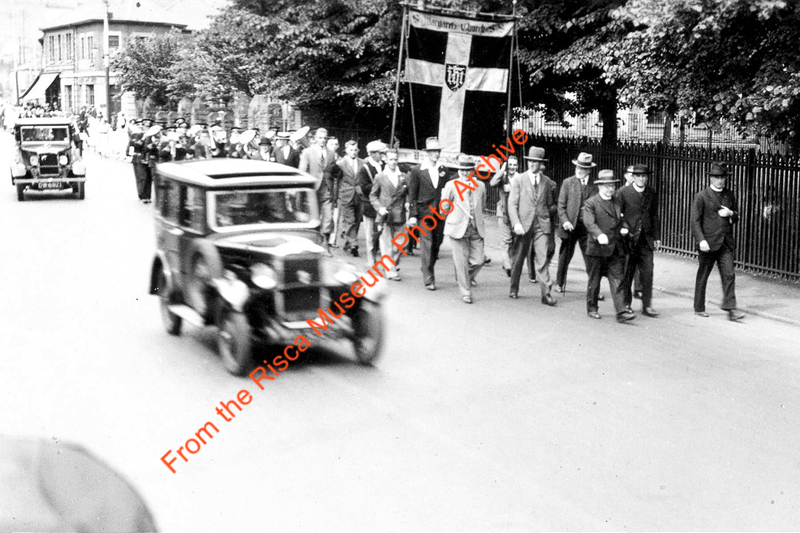 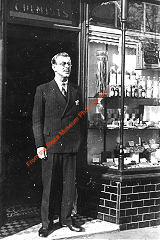 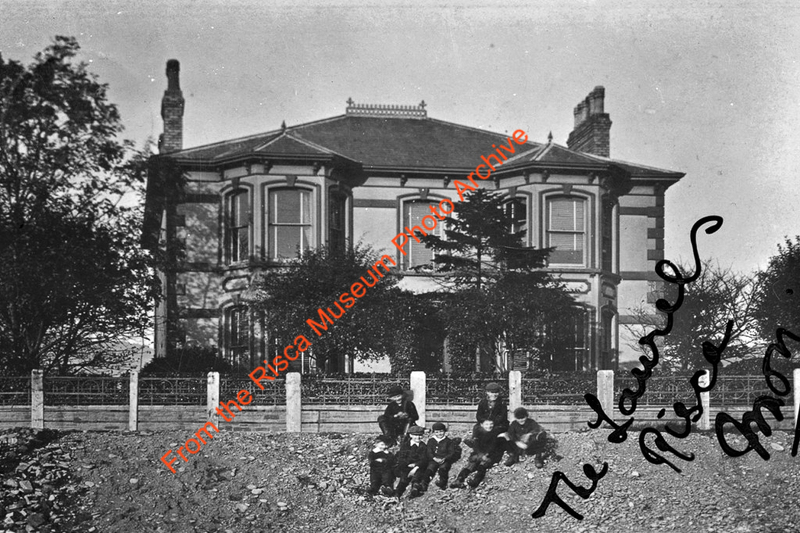 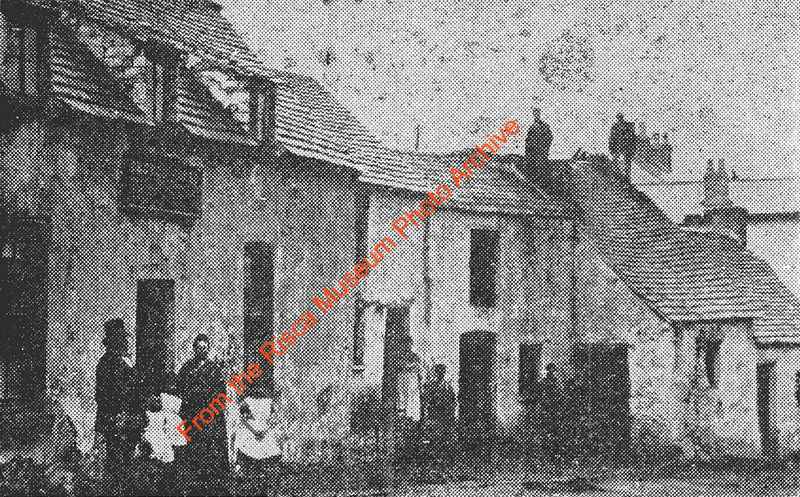 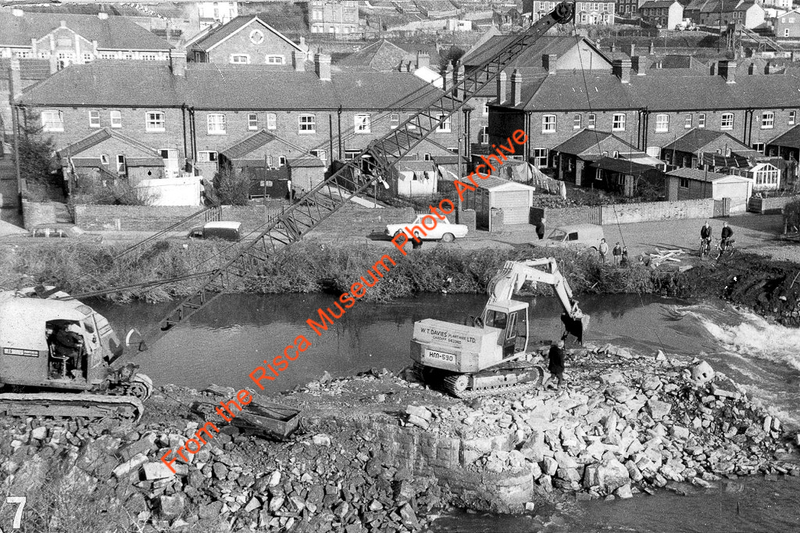 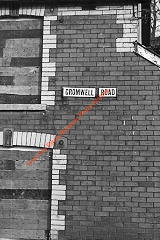 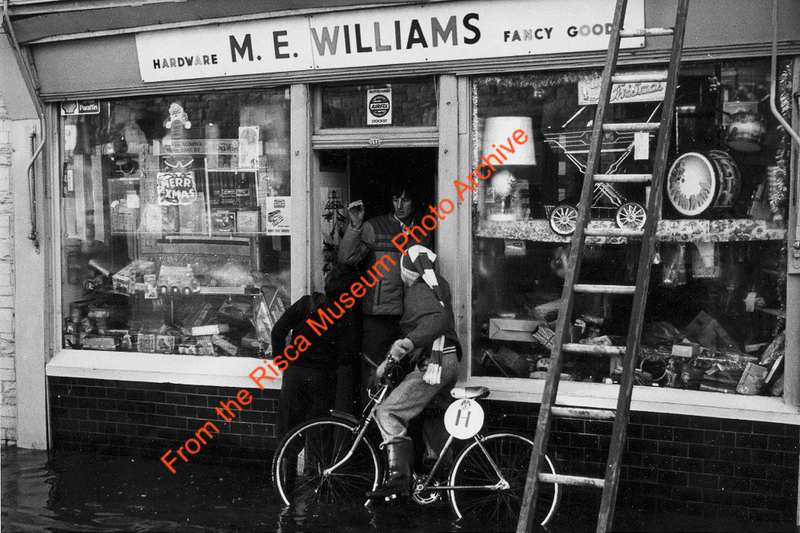 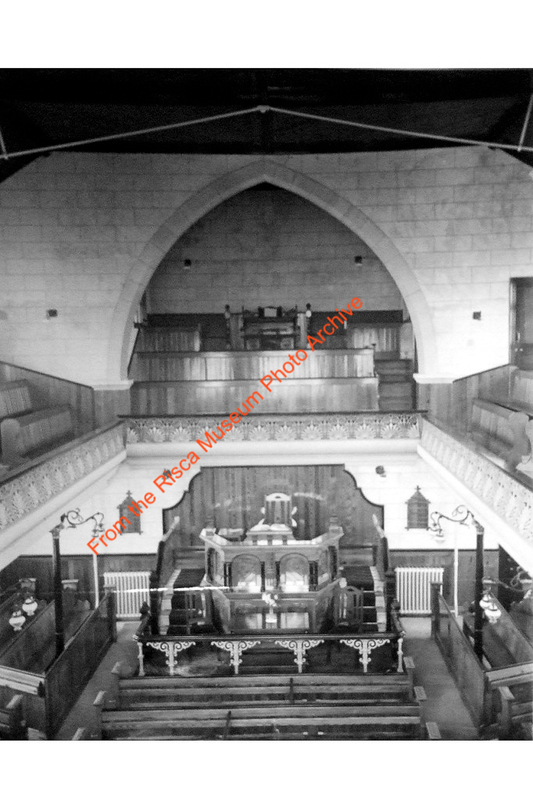 Our photographic archive is held at the museum and you are welcome to browse it on any Saturday between 10.00am and 12.30am. 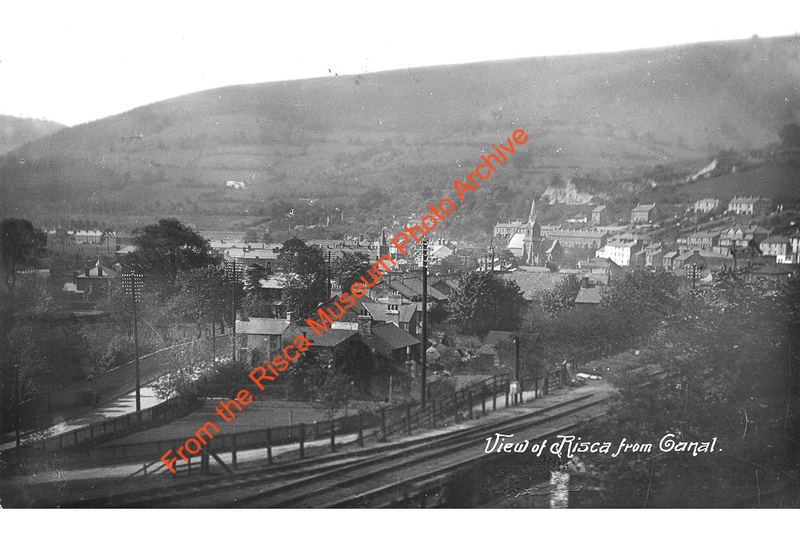 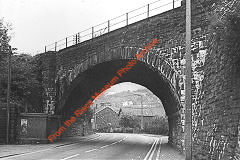 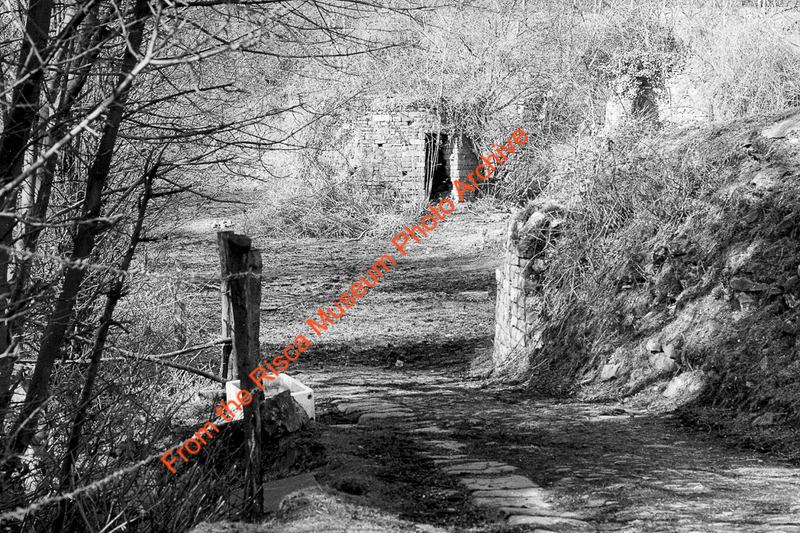 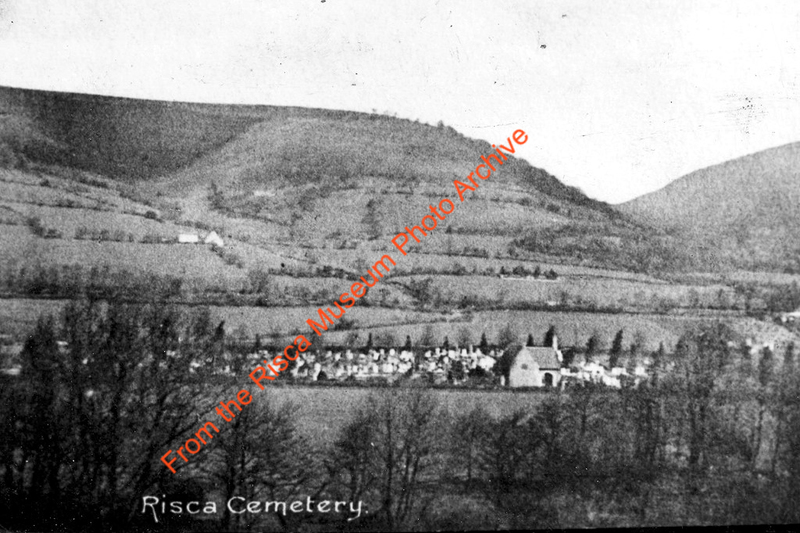 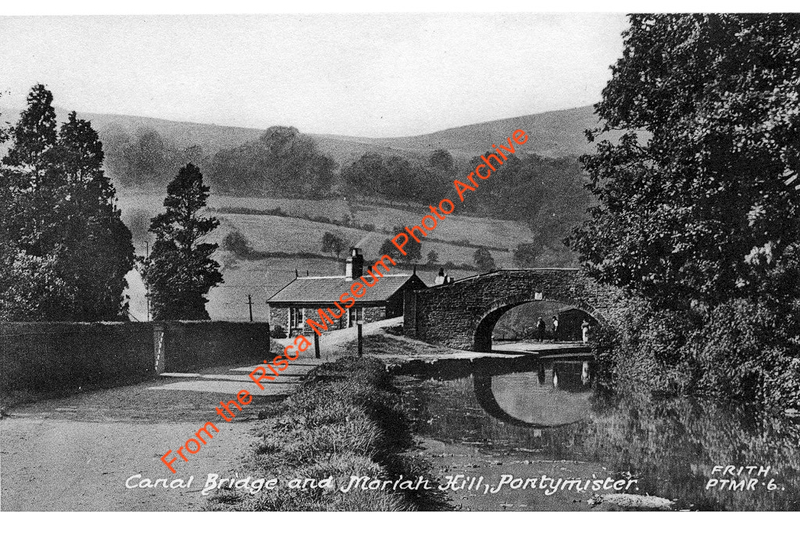 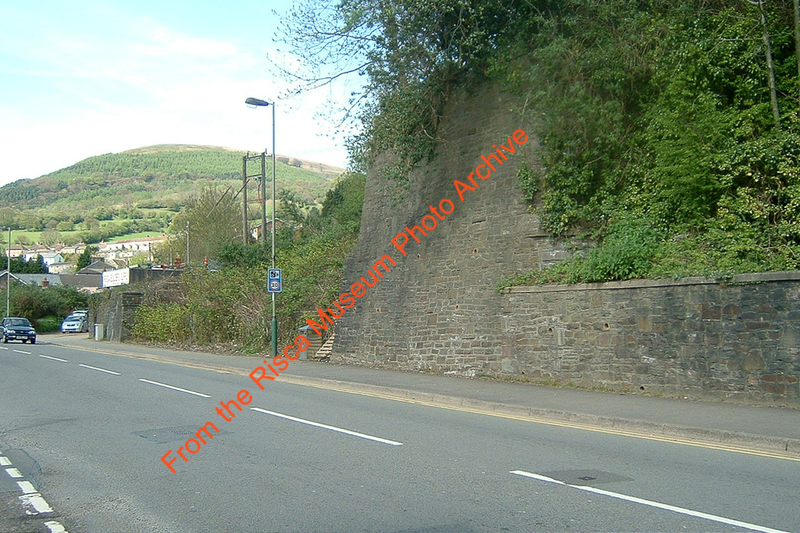 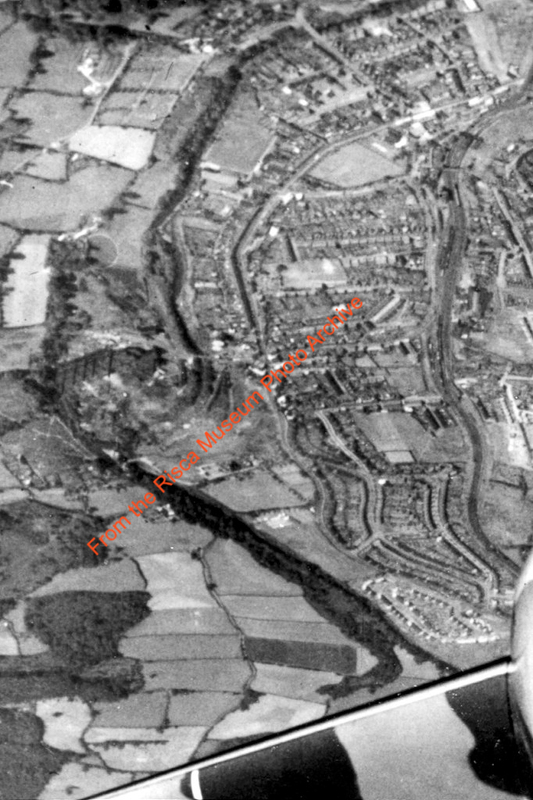 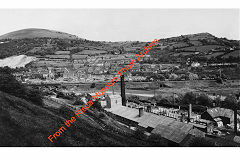 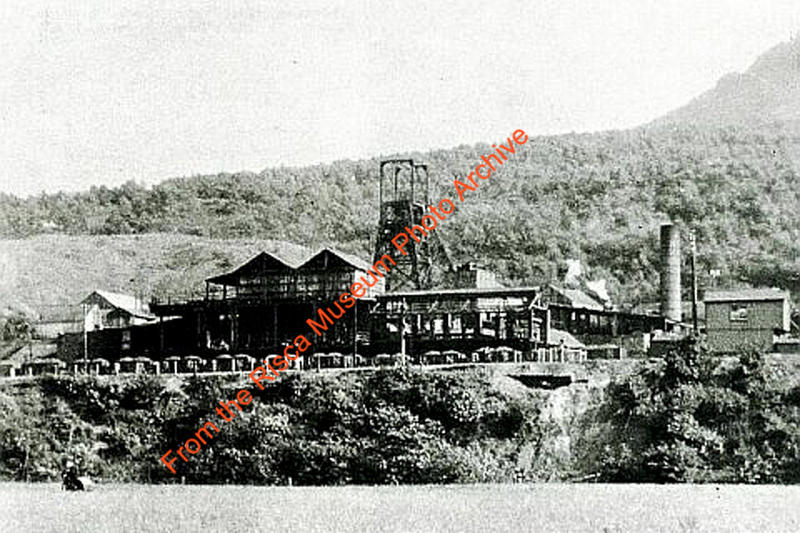 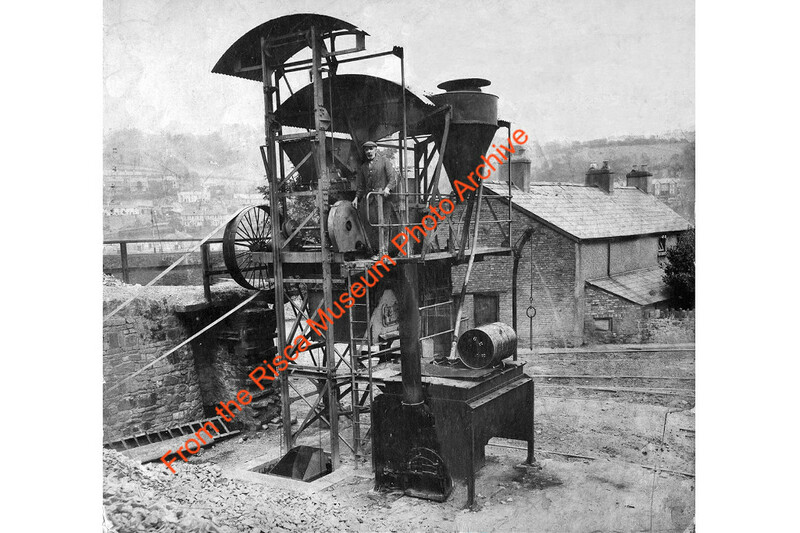 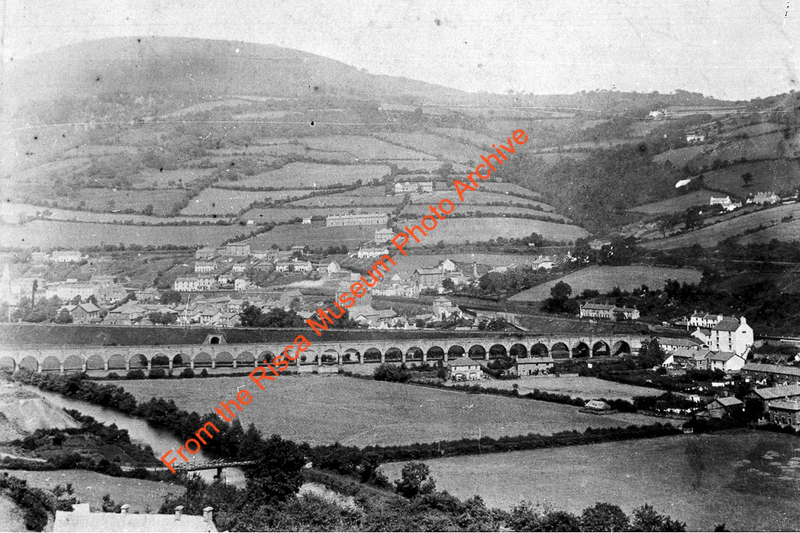 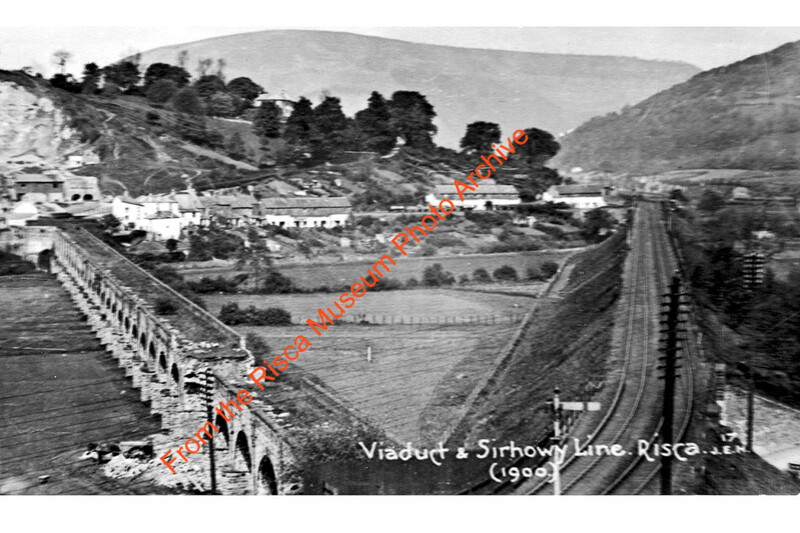 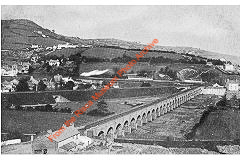 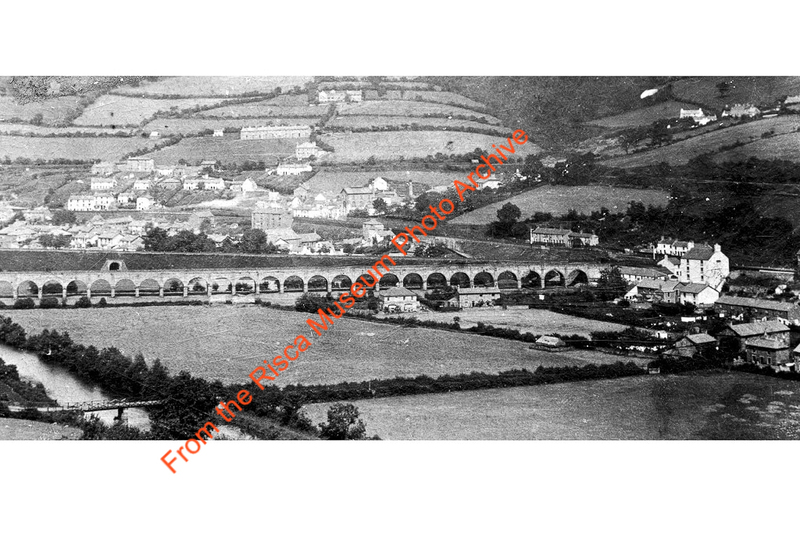 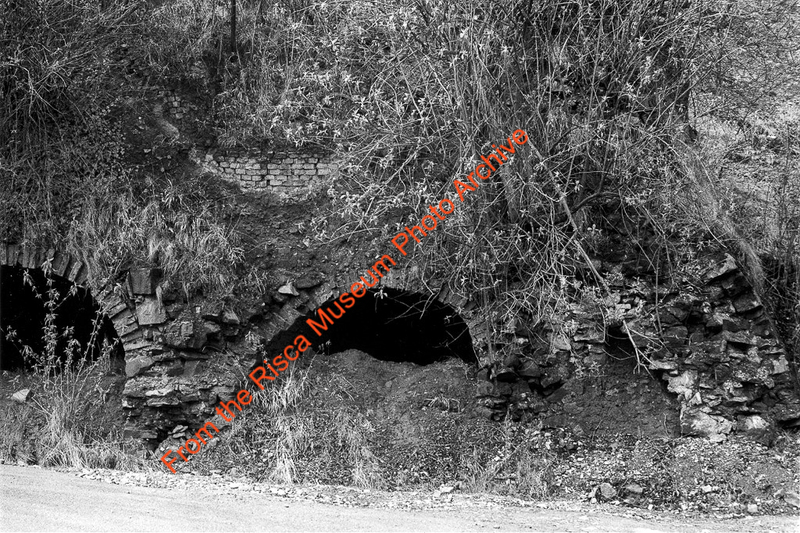 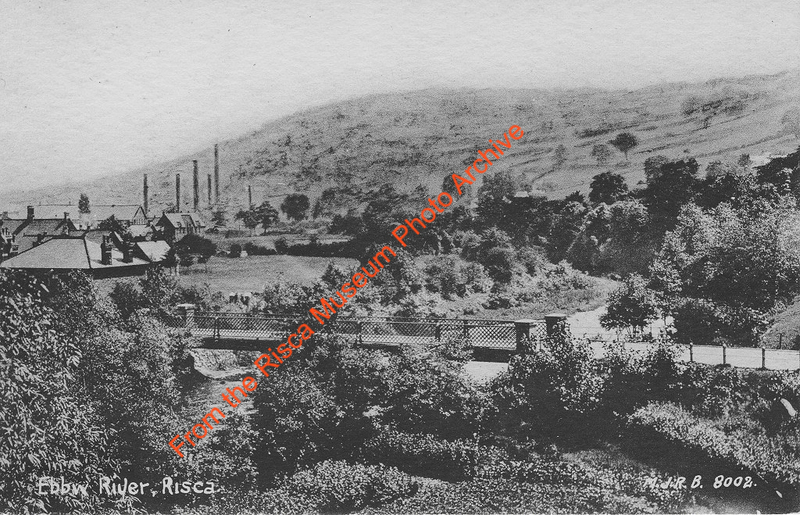 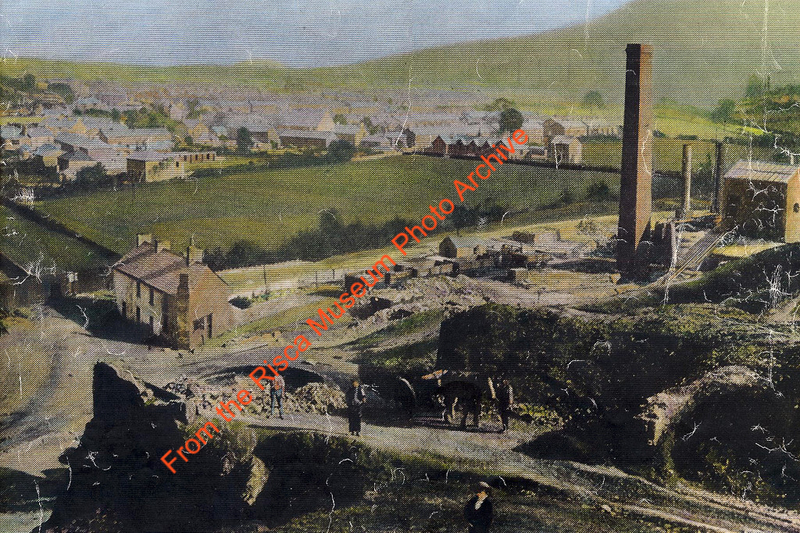 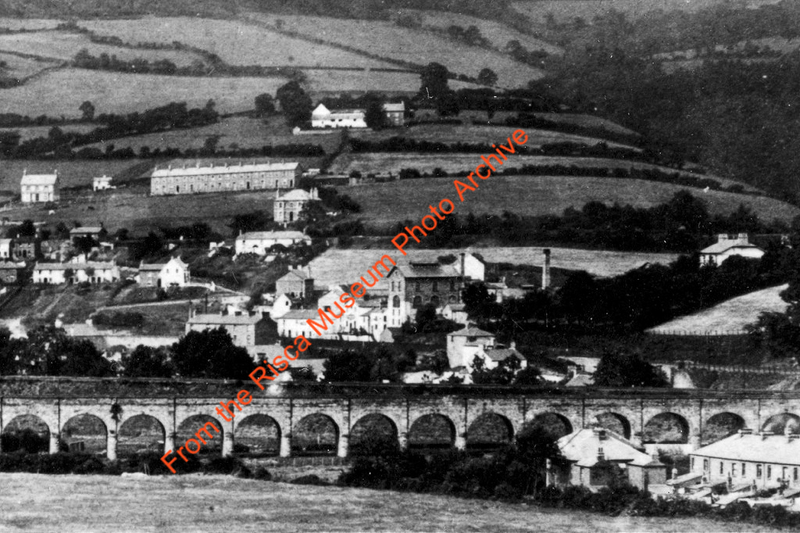 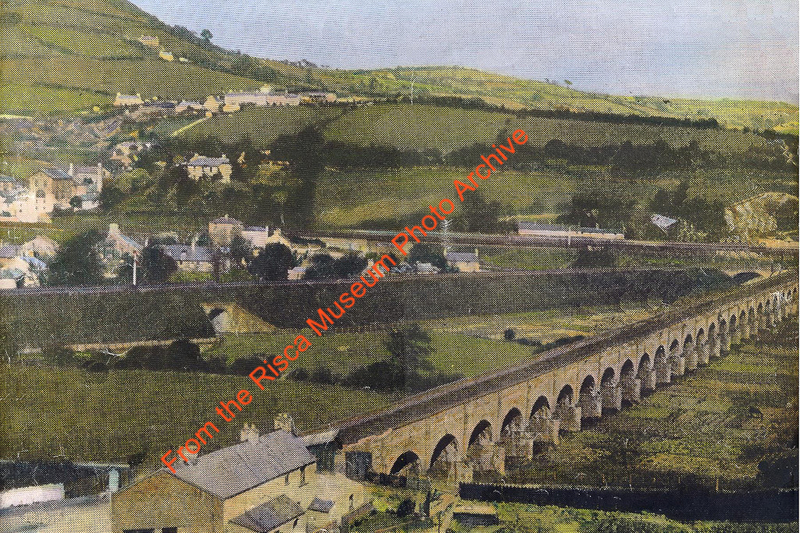 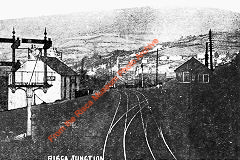 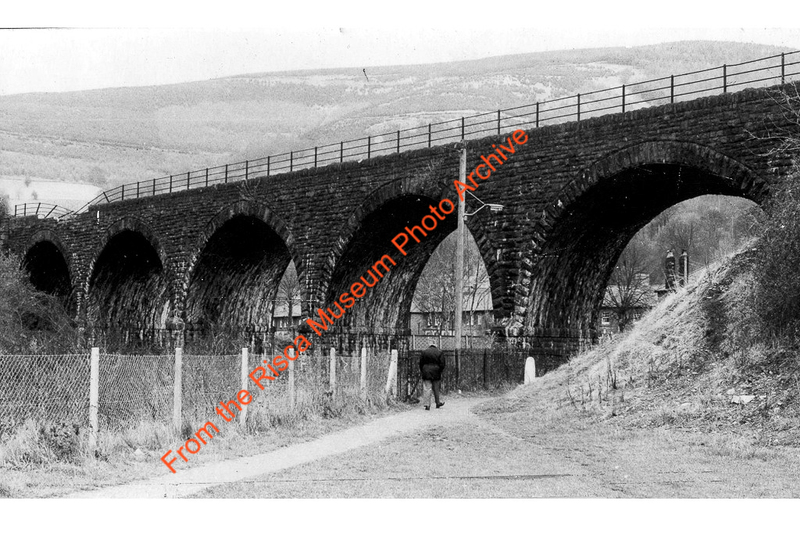 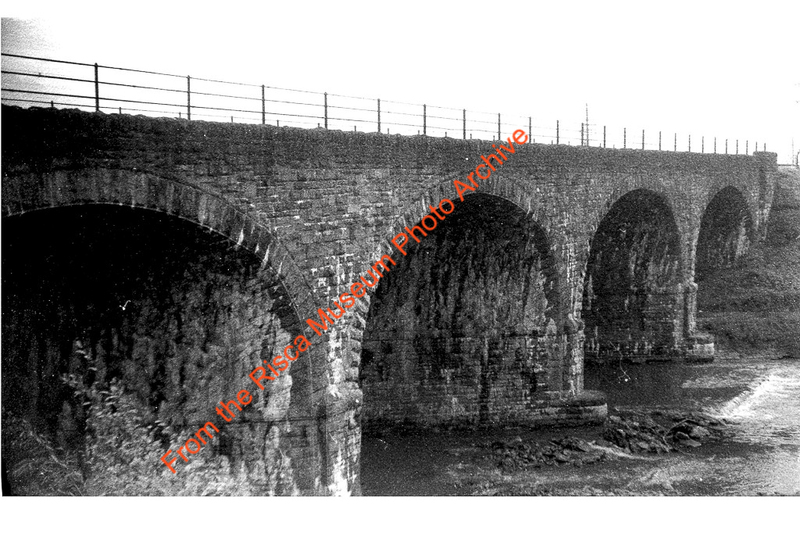 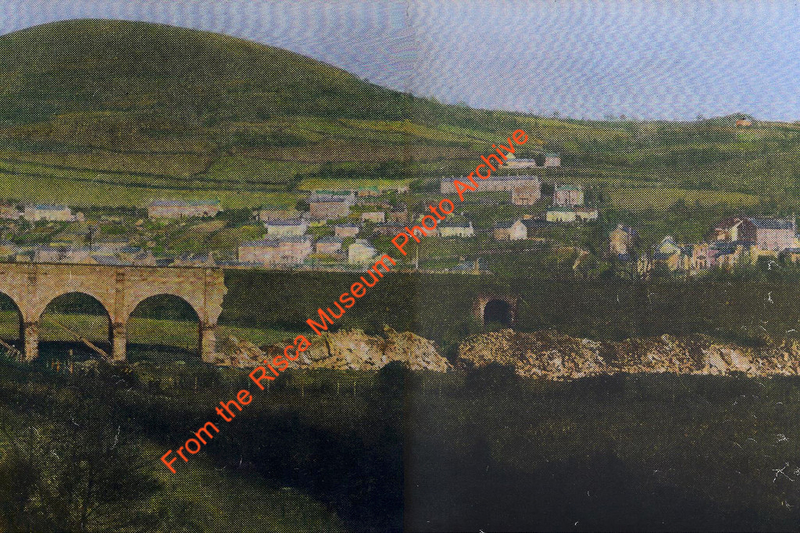 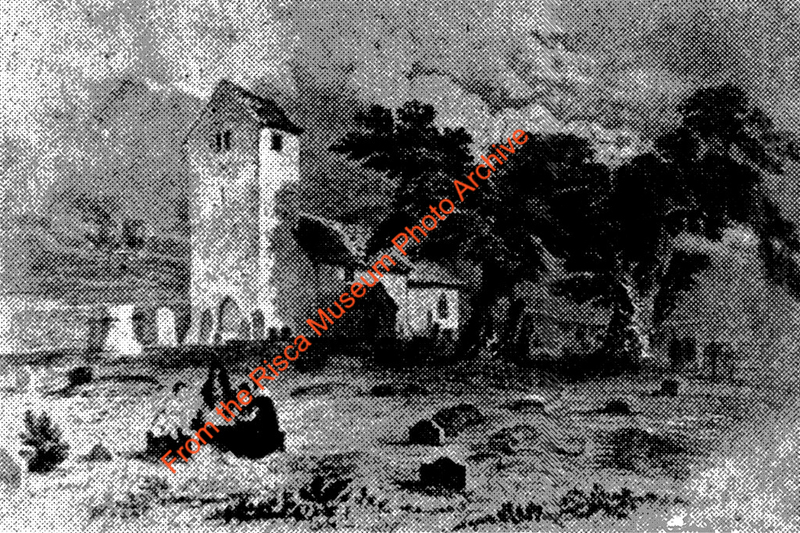 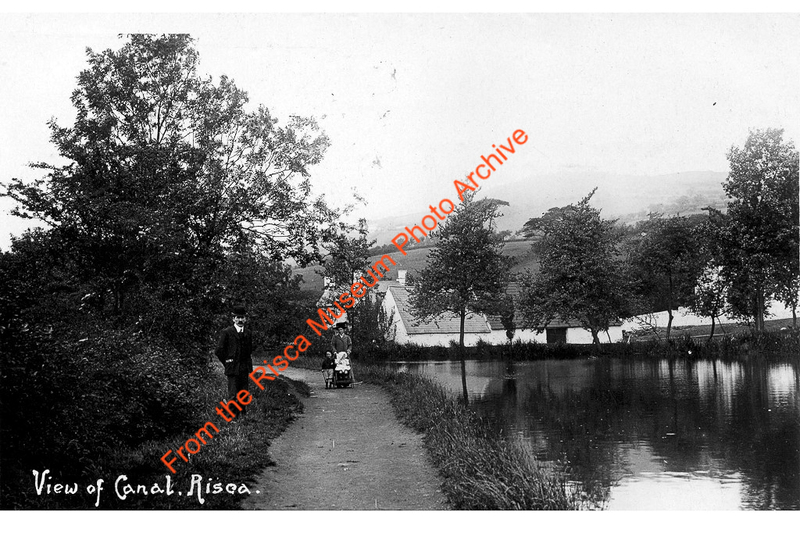 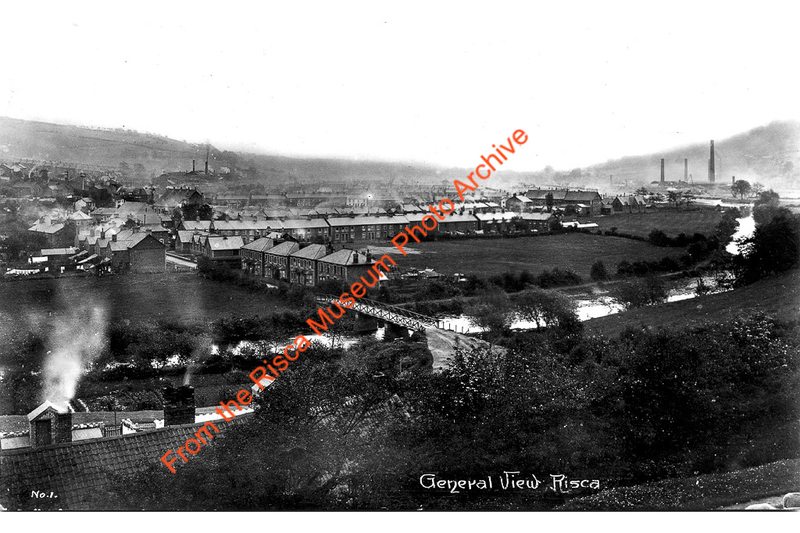 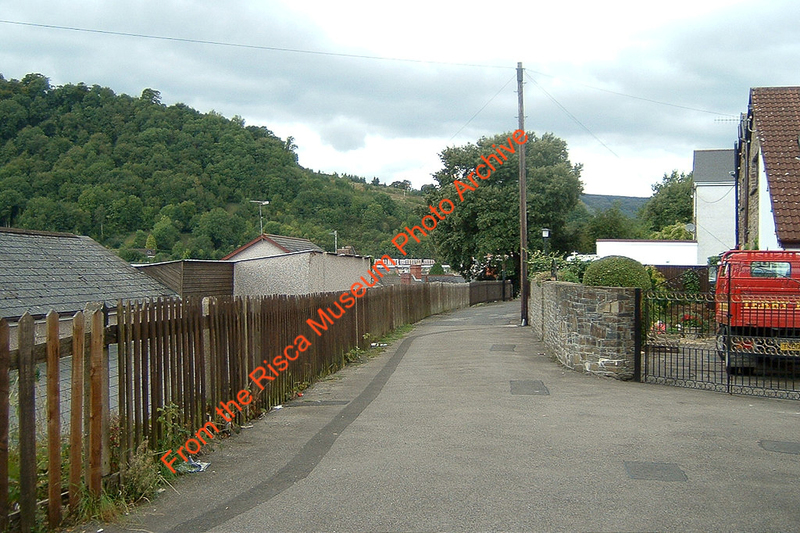 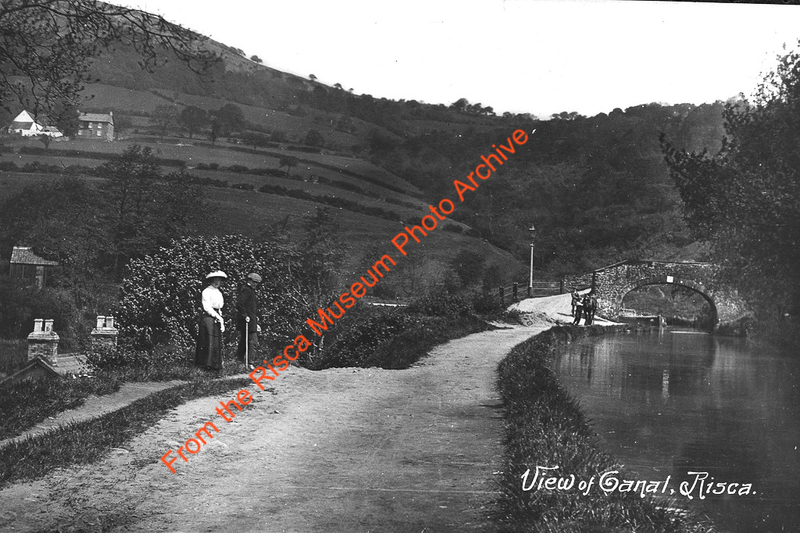 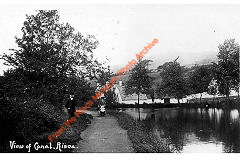 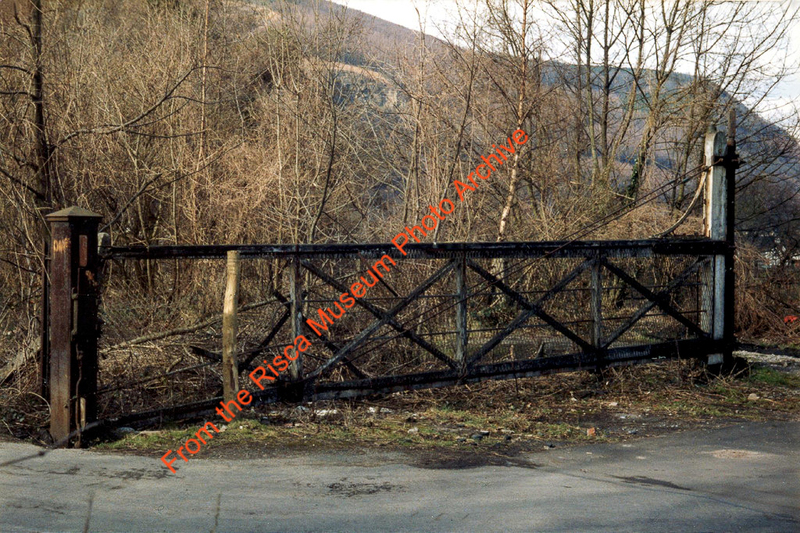 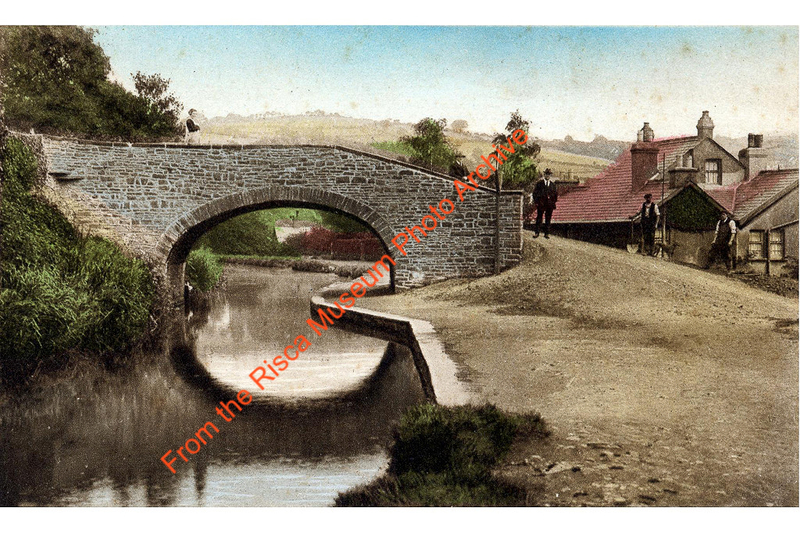 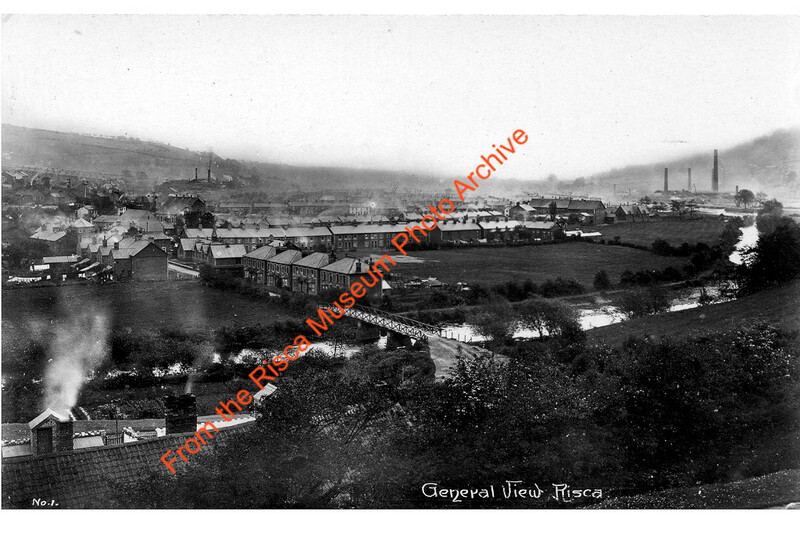 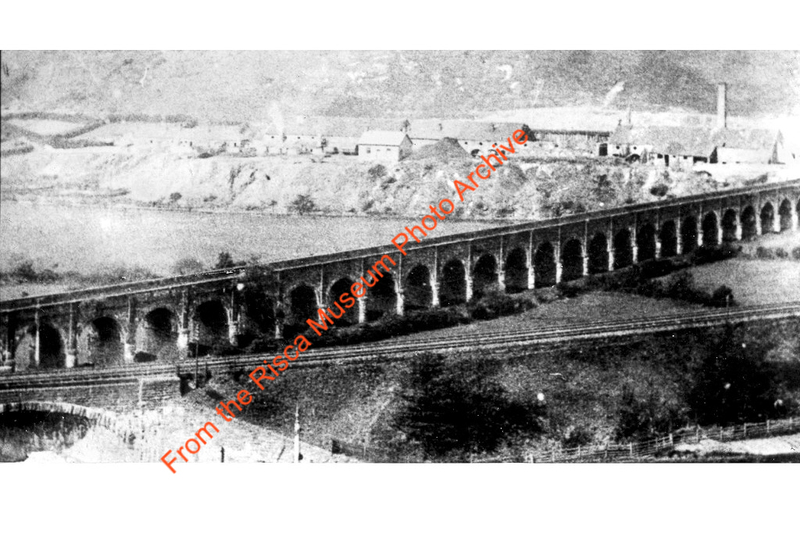 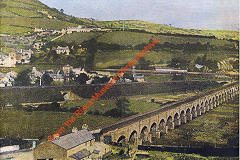 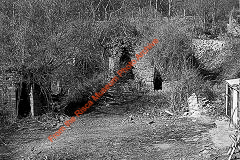 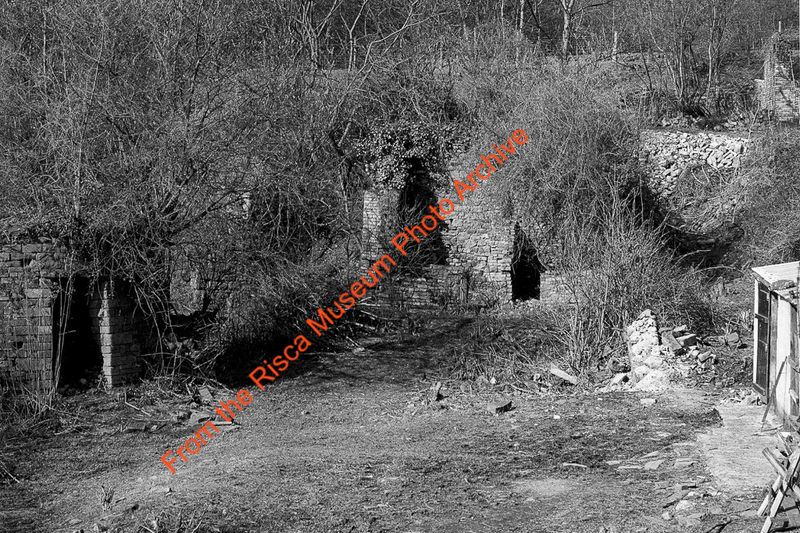 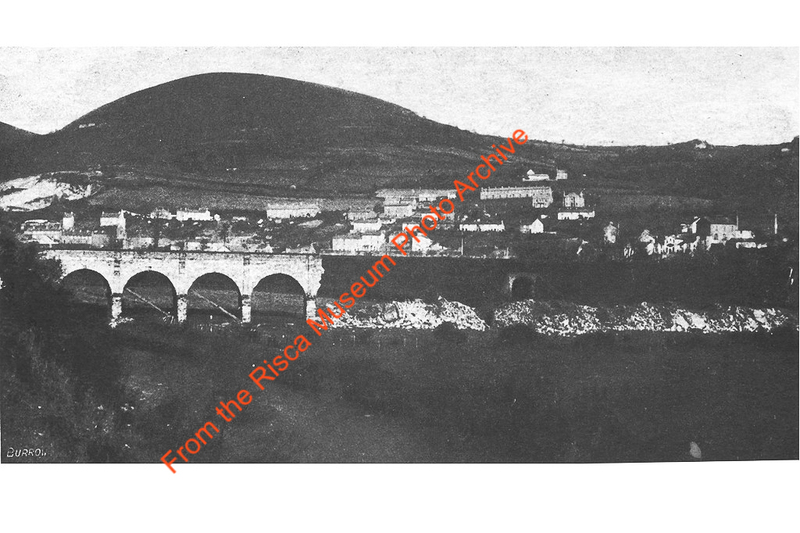 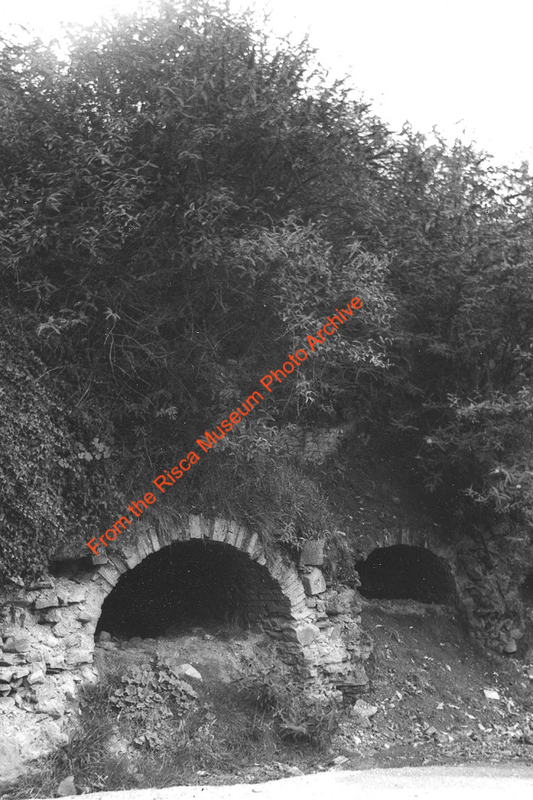 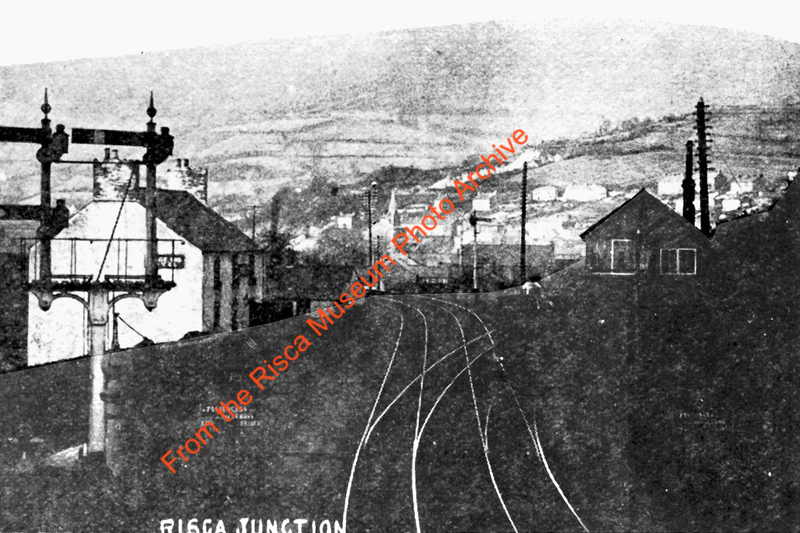 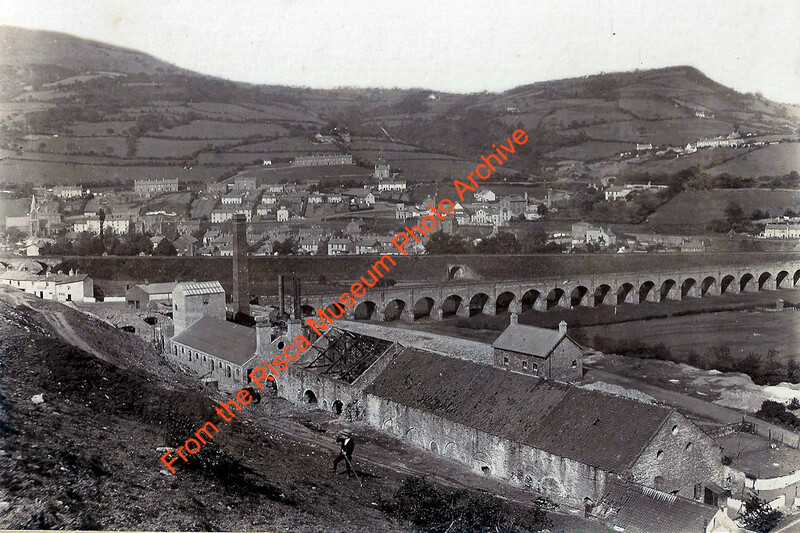 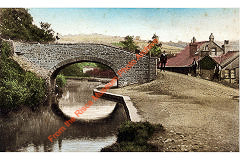 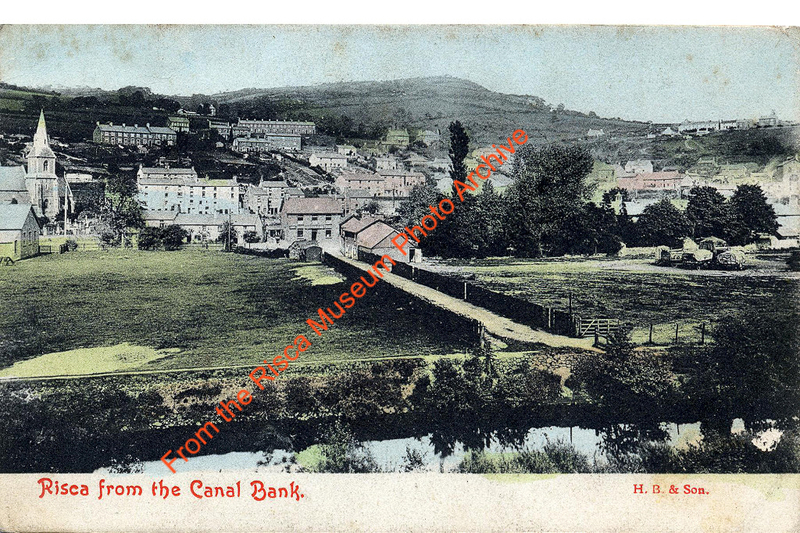 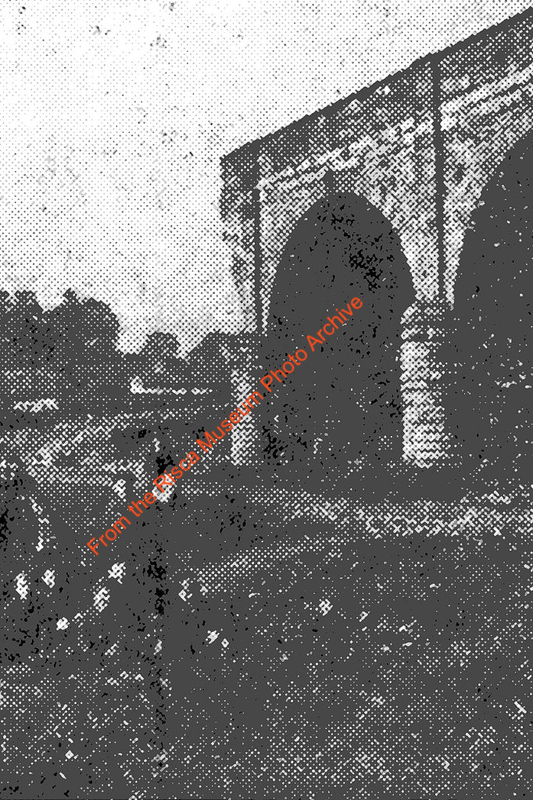 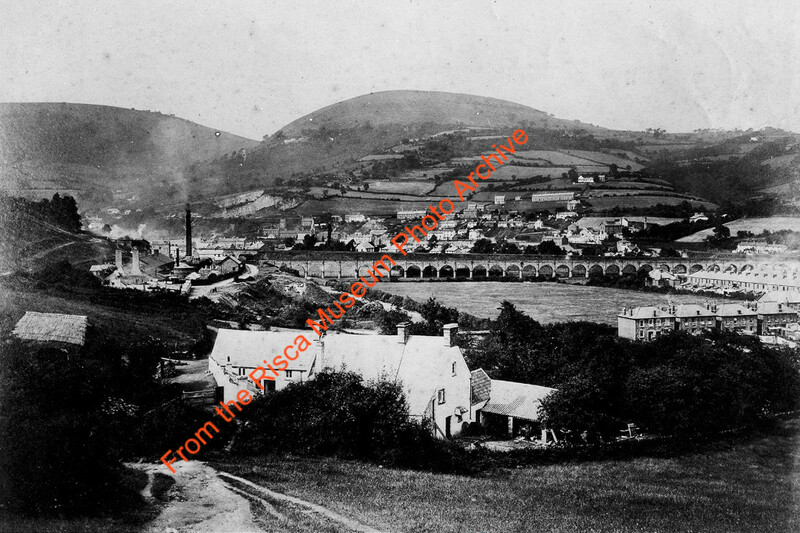 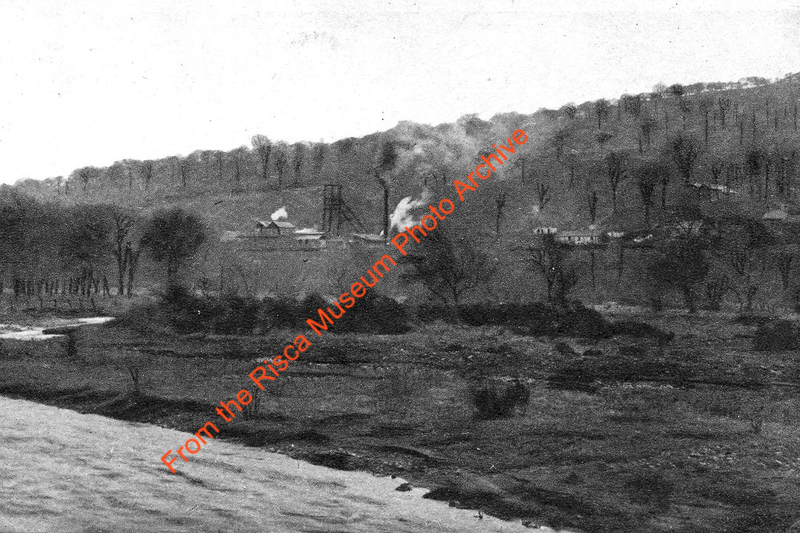 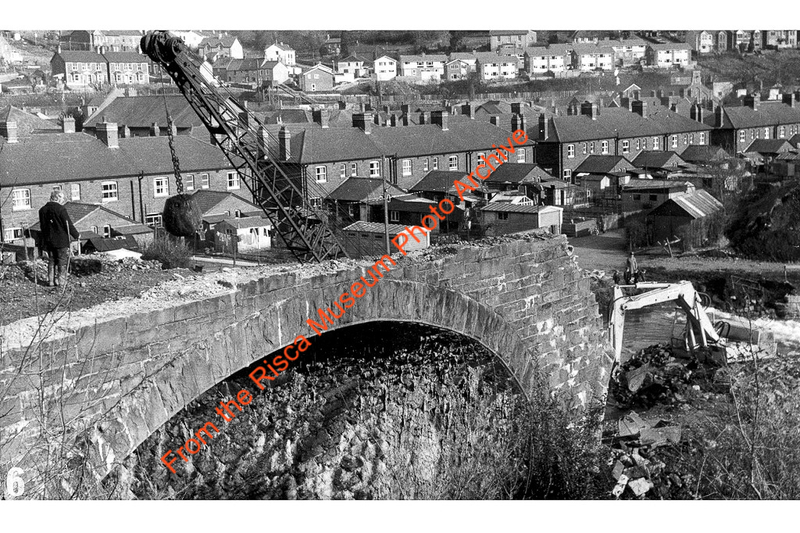 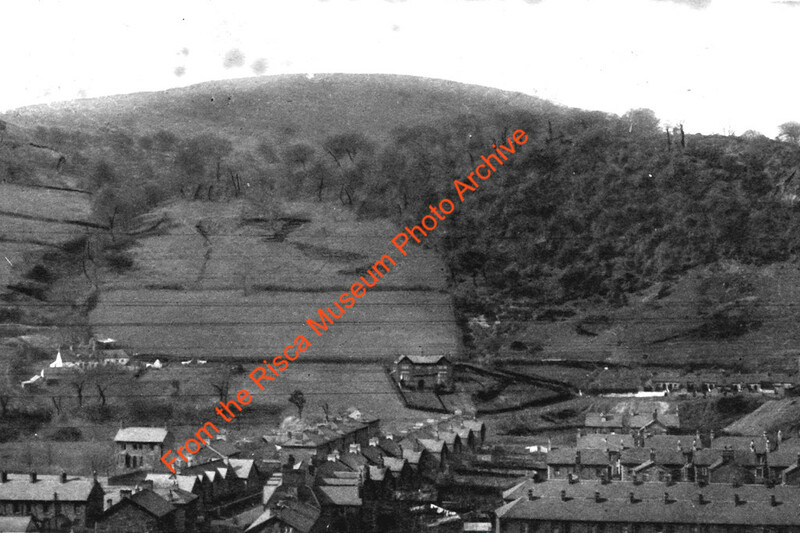 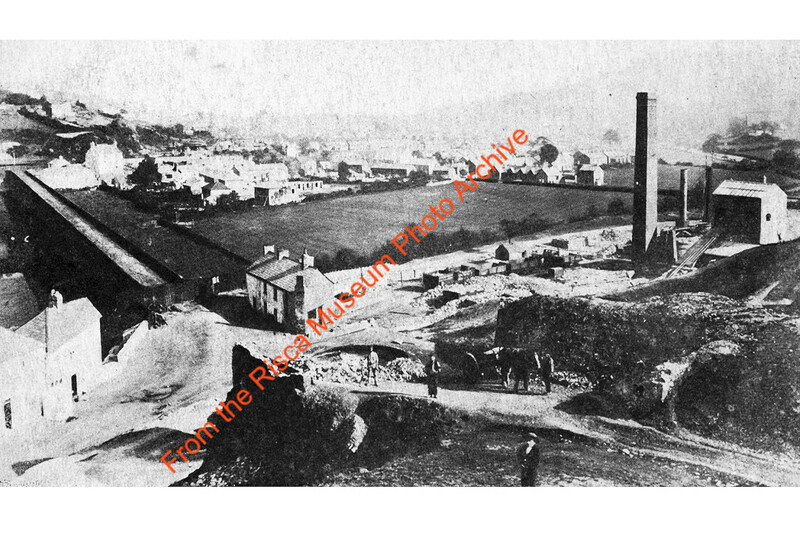 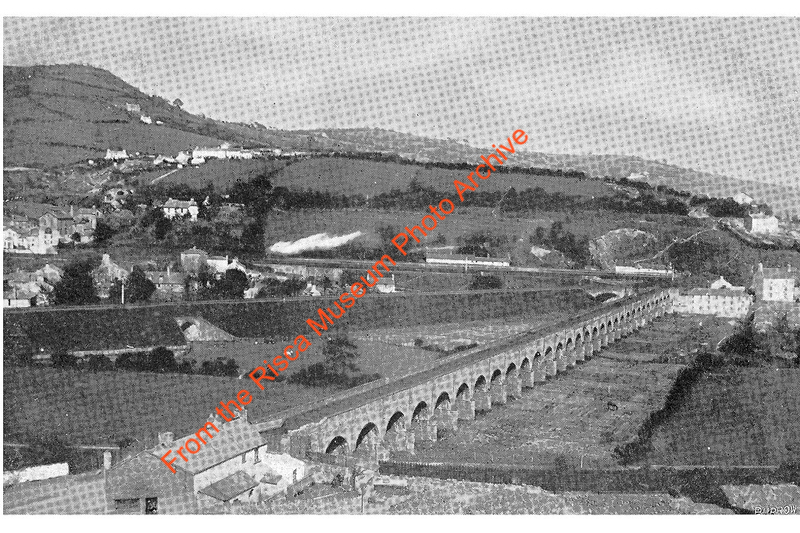 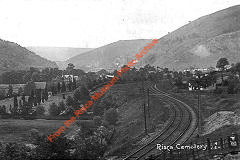 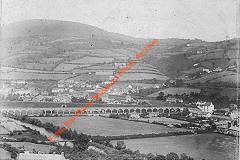 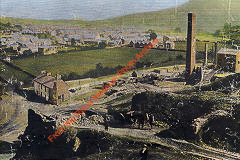 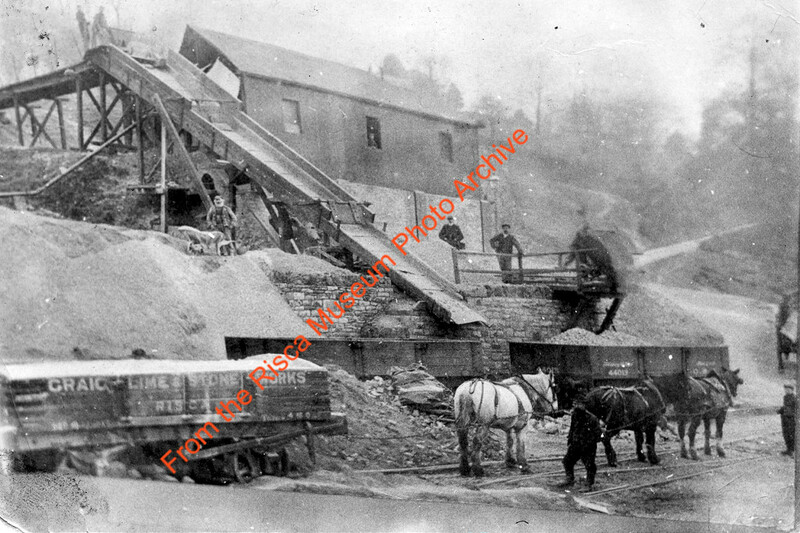 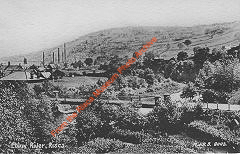 Risca Longbridge was a fine masonry viaduct with thirty-two arches that was built in 1805 to carry a branch of the Monmouthshire Canal Company's tramroad across the Ebbw Valley flood plain. 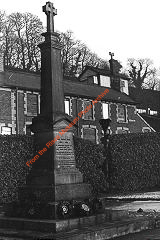 It was constructed from red pennant sandstone by John Hodgkinson. 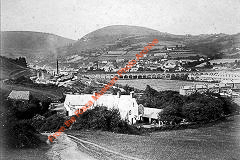 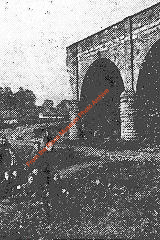 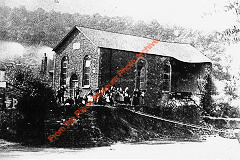 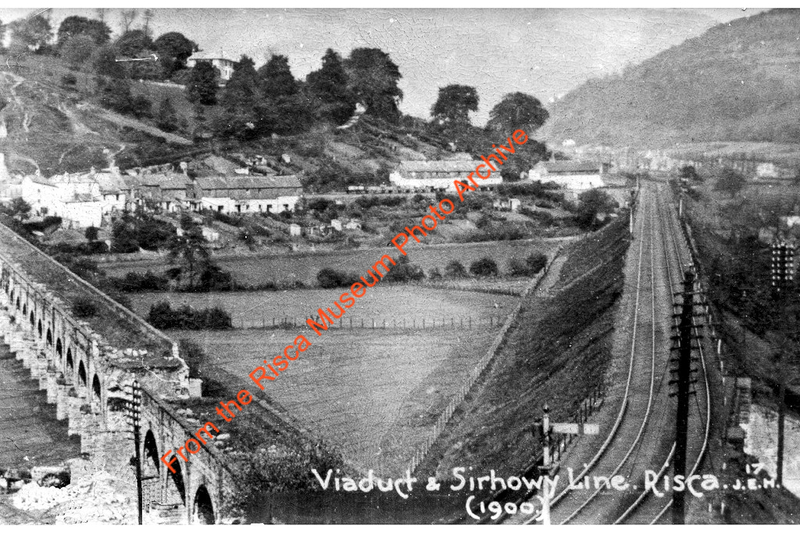 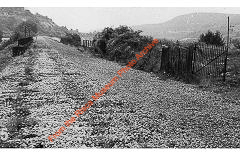 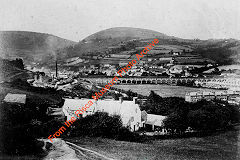 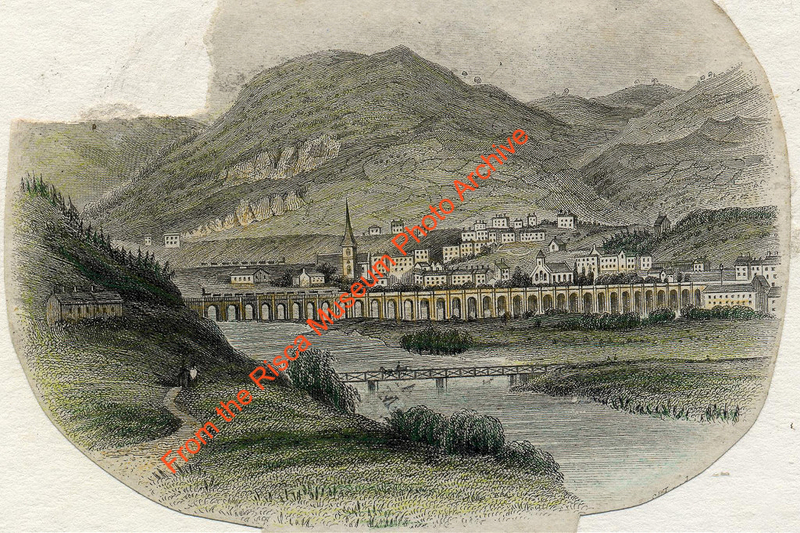 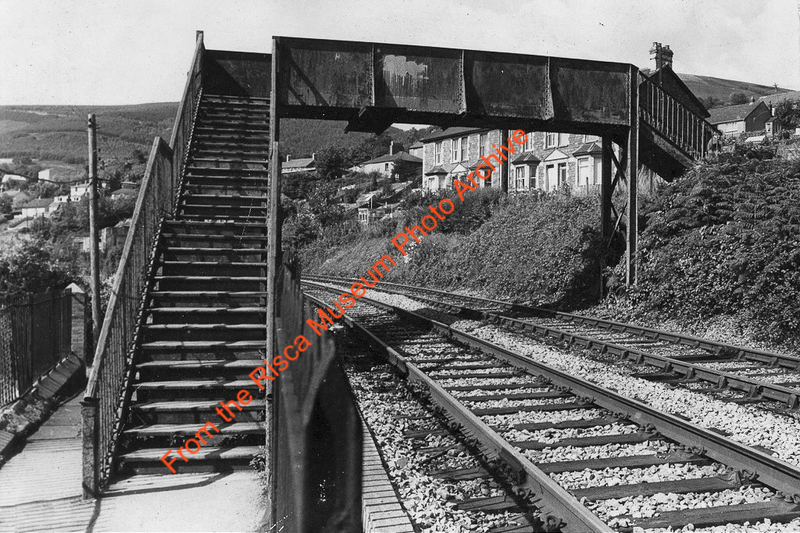 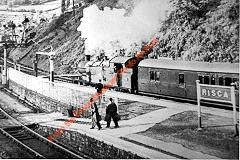 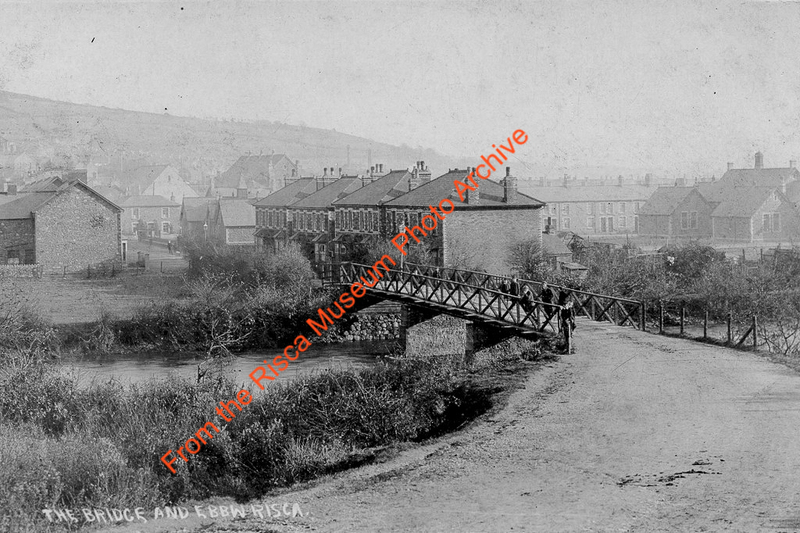 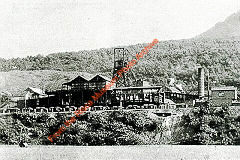 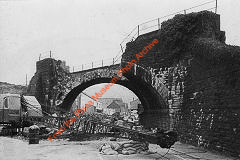 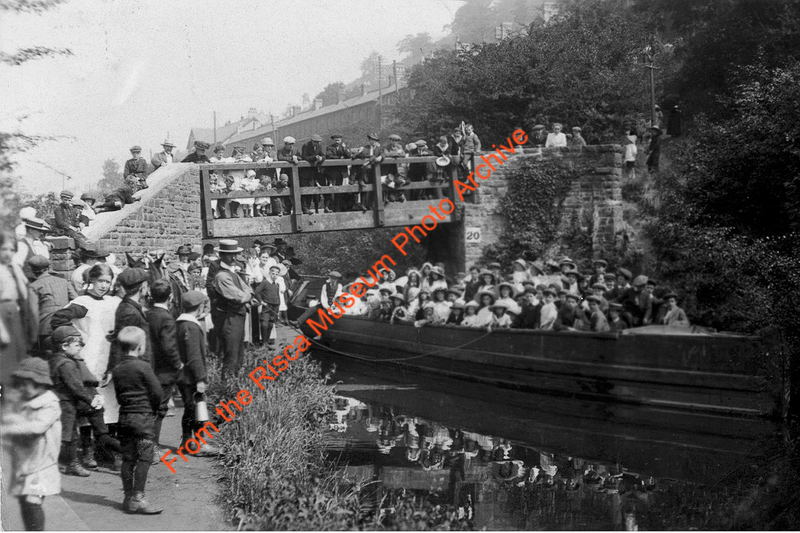 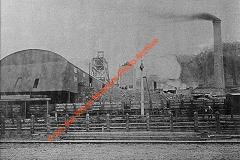 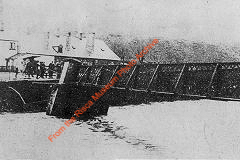 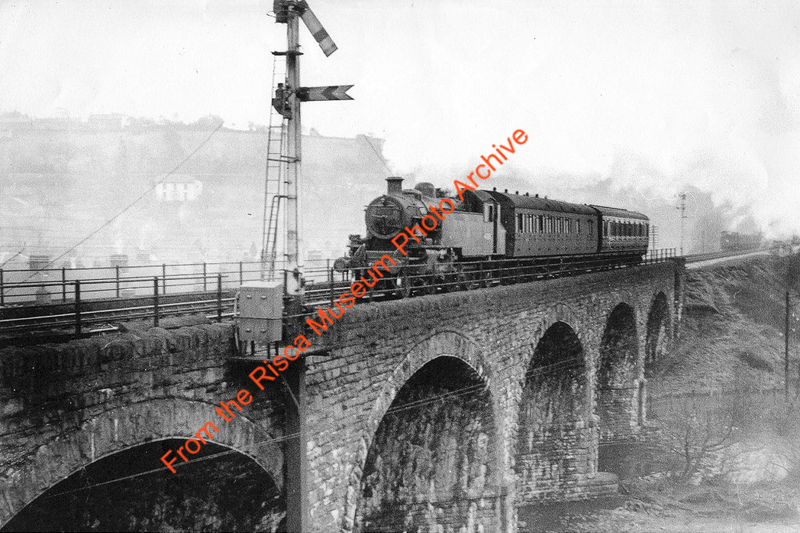 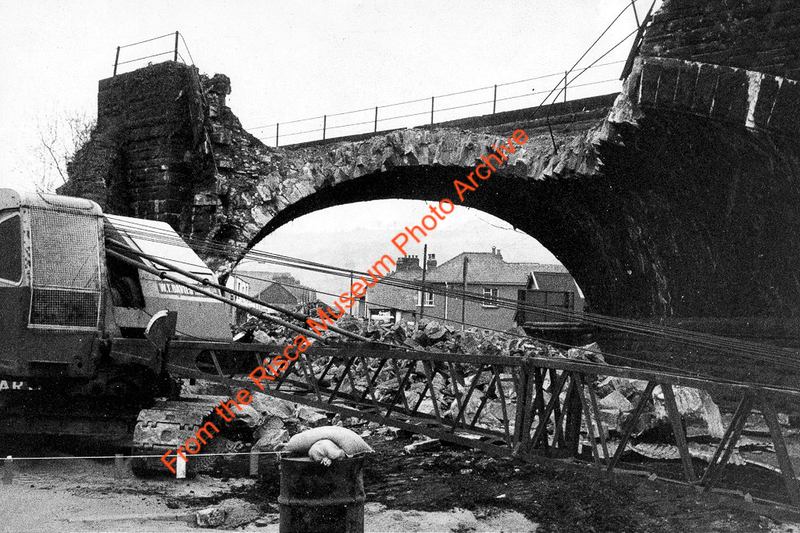 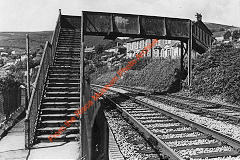 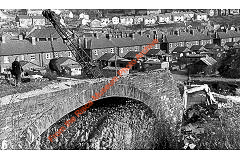 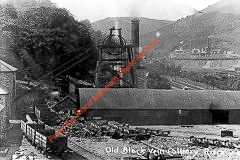 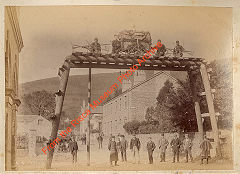 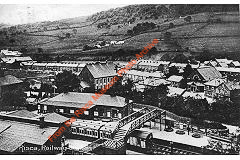 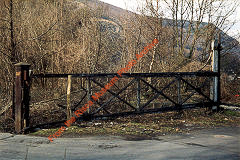 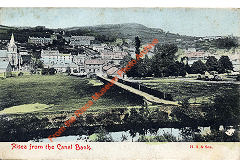 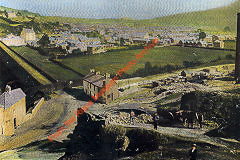 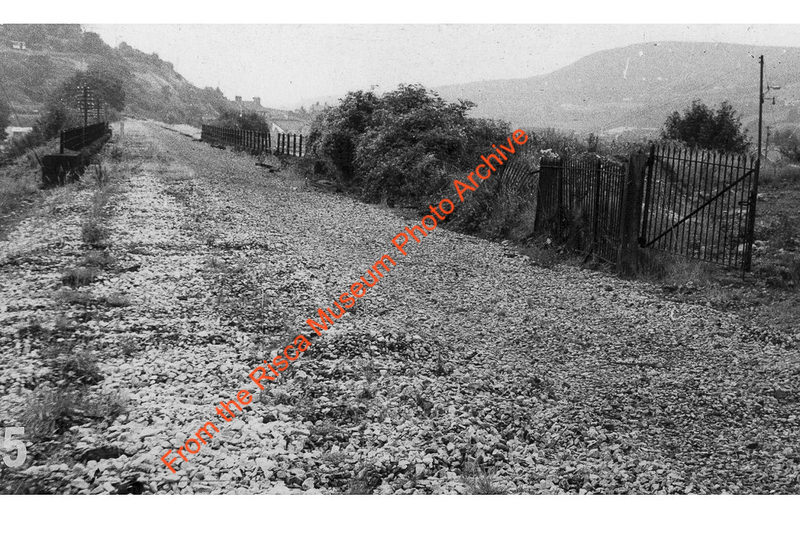 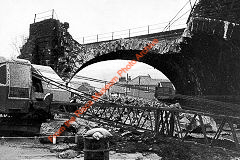 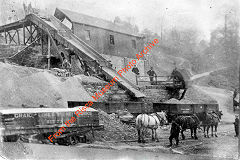 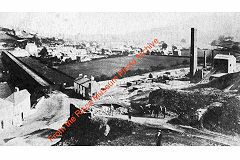 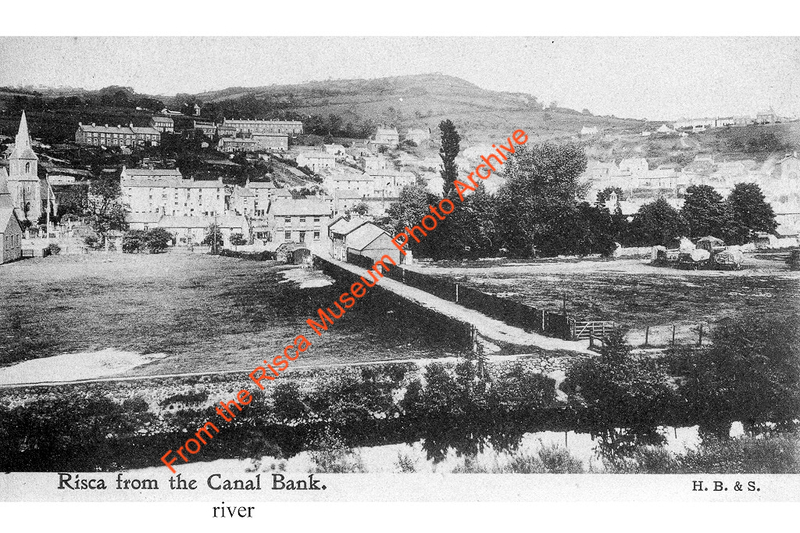 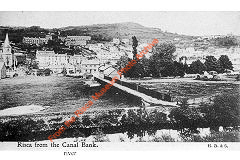 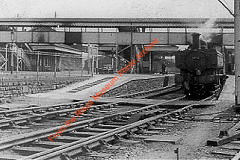 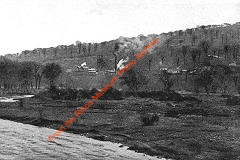 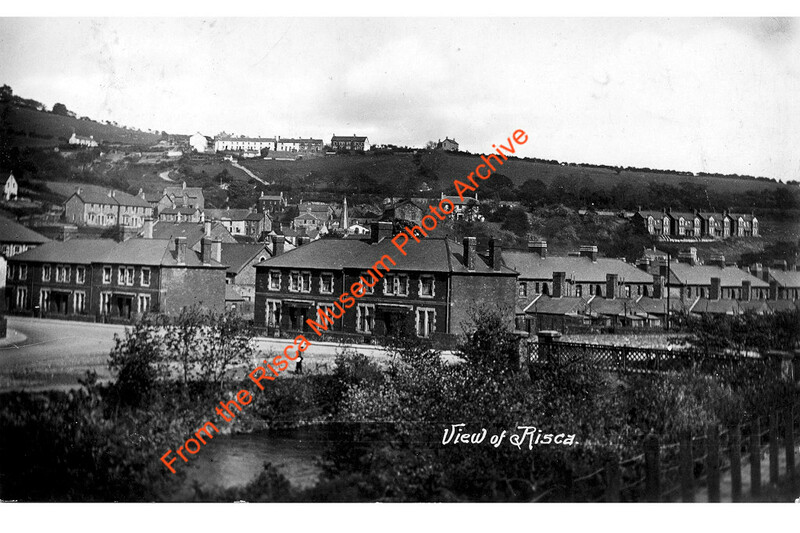 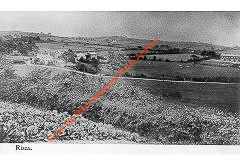 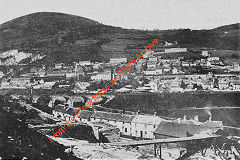 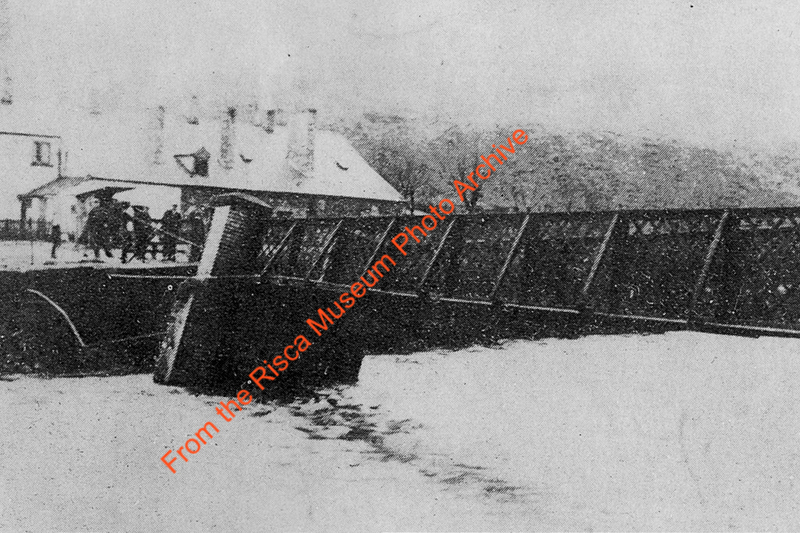 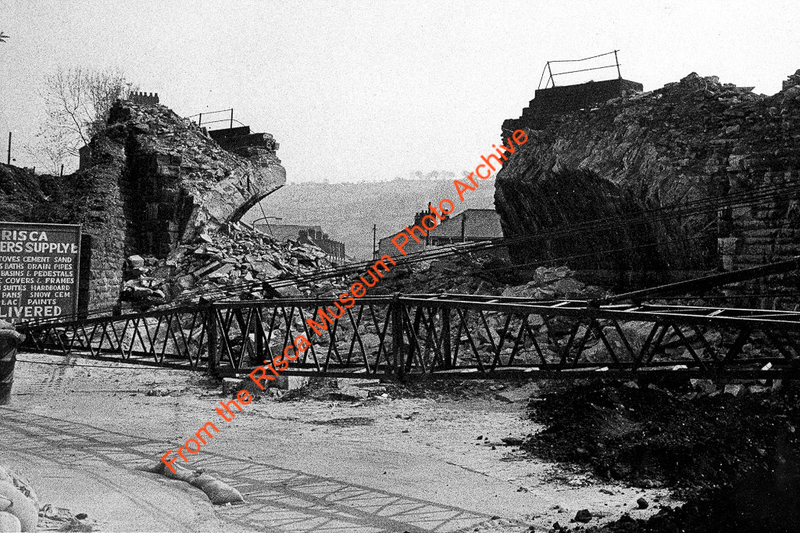 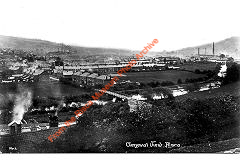 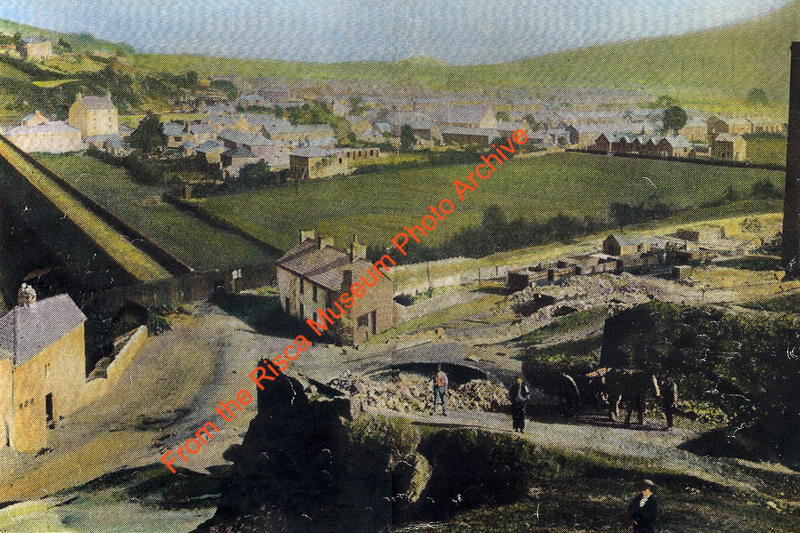 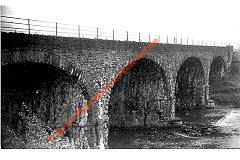 Following the opening of the Sirhowy railway, the long bridge was redundant by 1859 and was demolished in 1902. 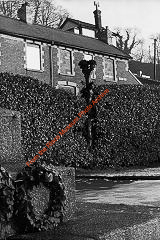 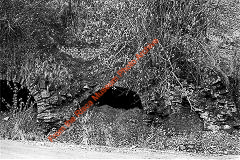 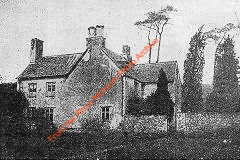 Local houses have been built from its stone and the east abutment is the only remaining fragment. 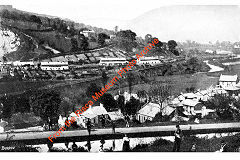 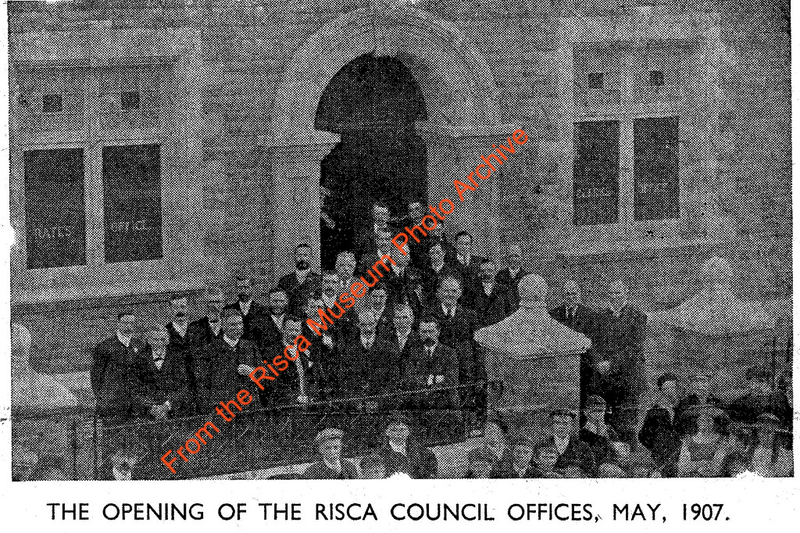 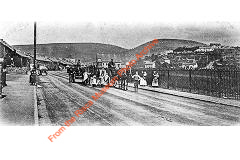 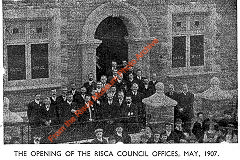 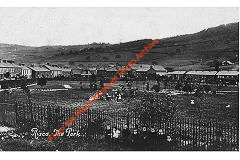 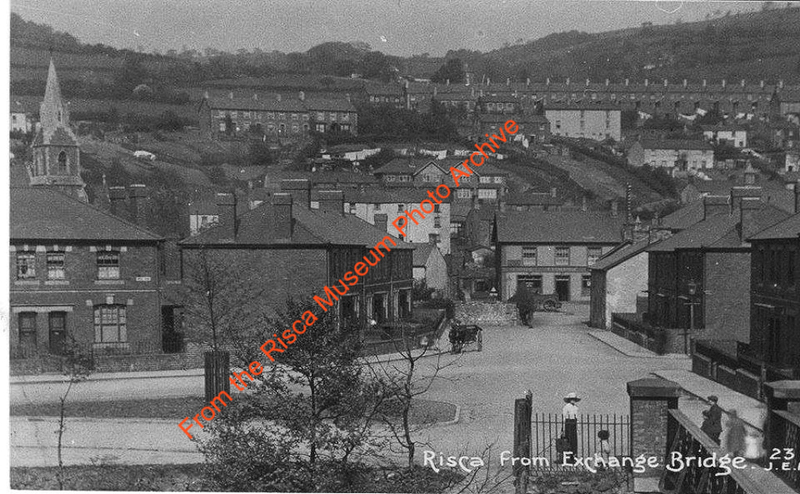 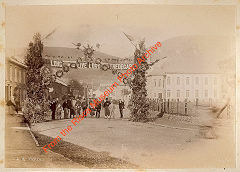 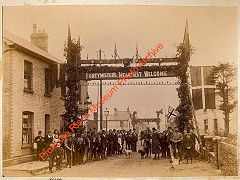 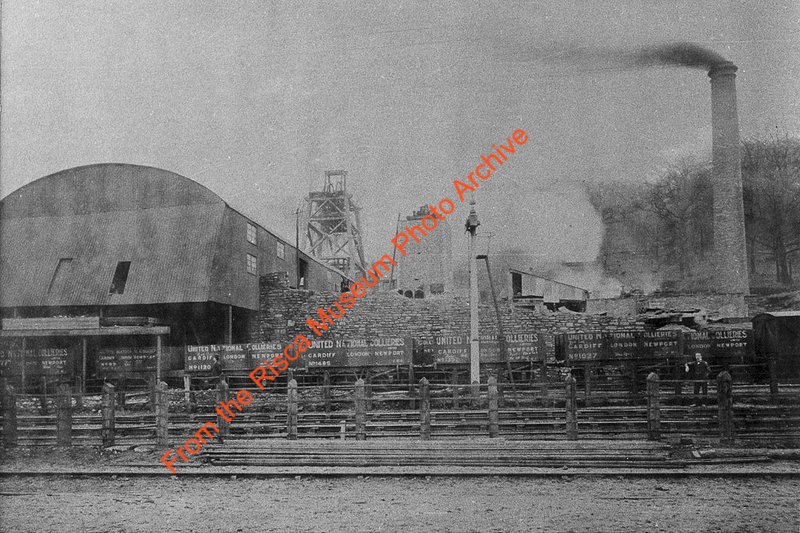 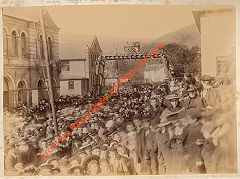 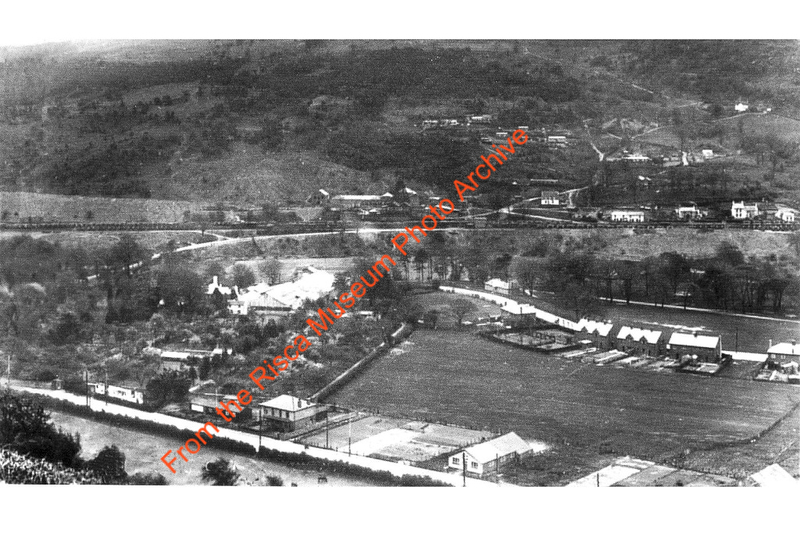 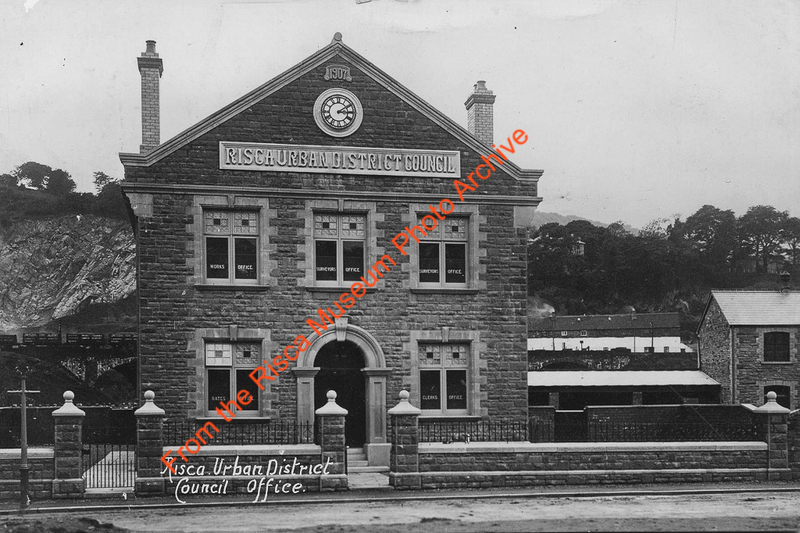 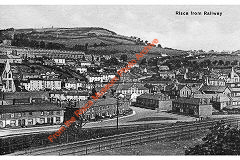 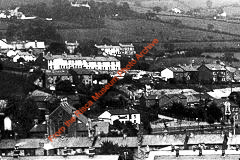 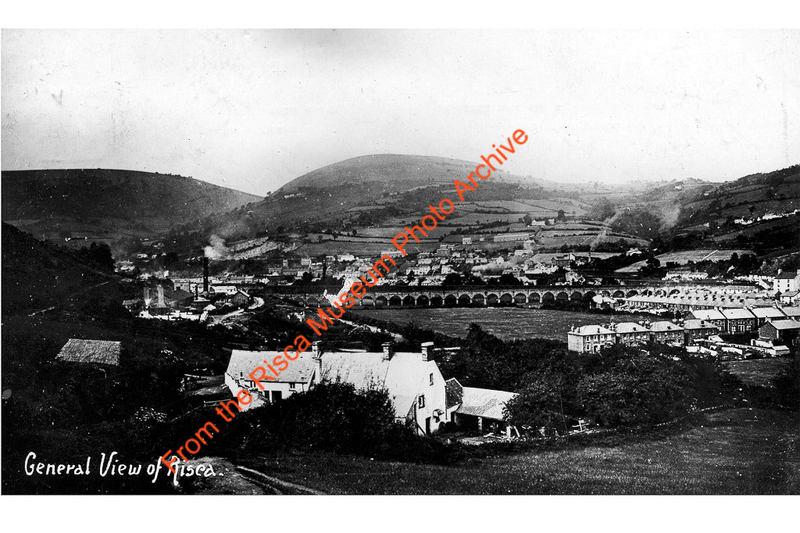 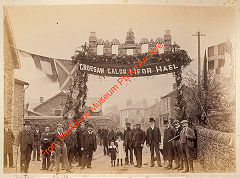 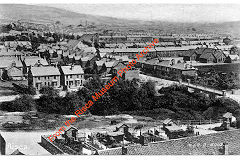 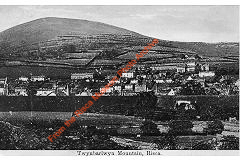 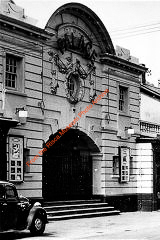 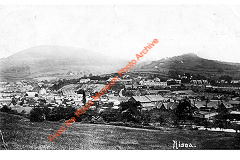 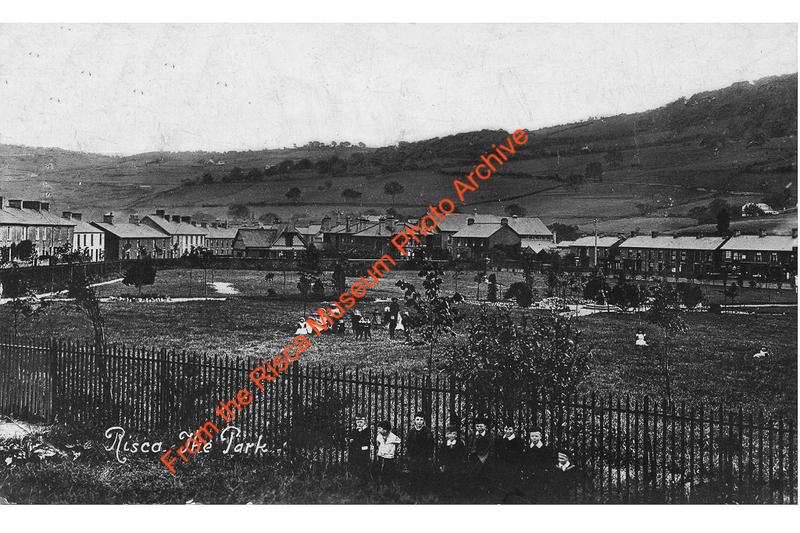 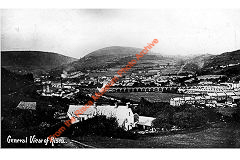 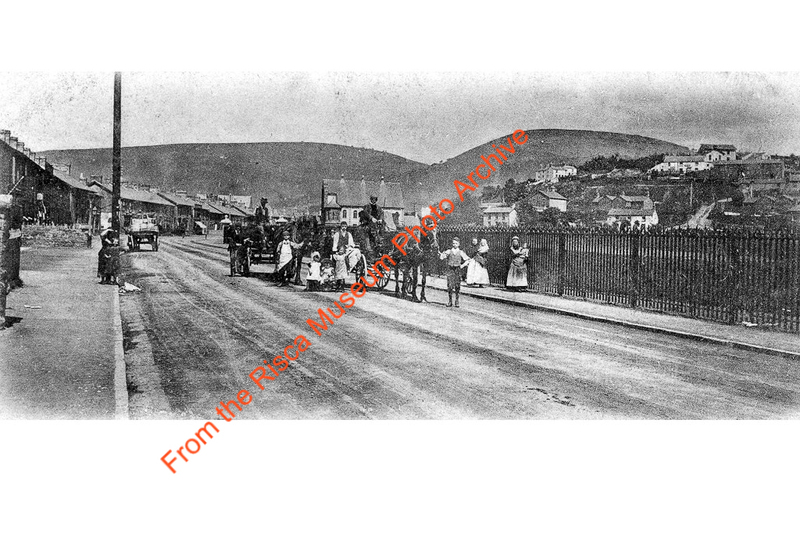 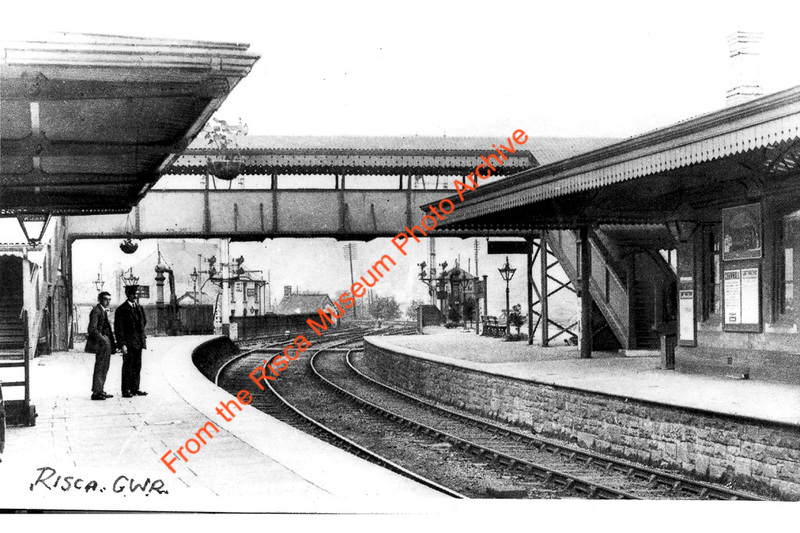 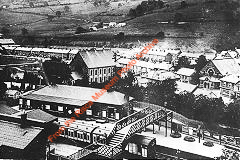 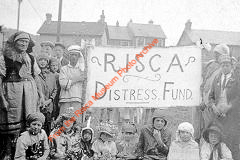 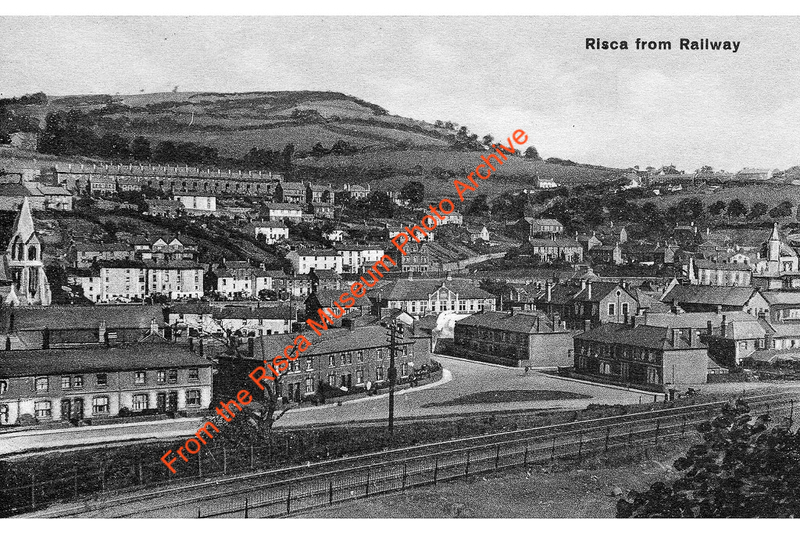 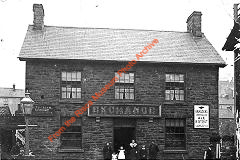 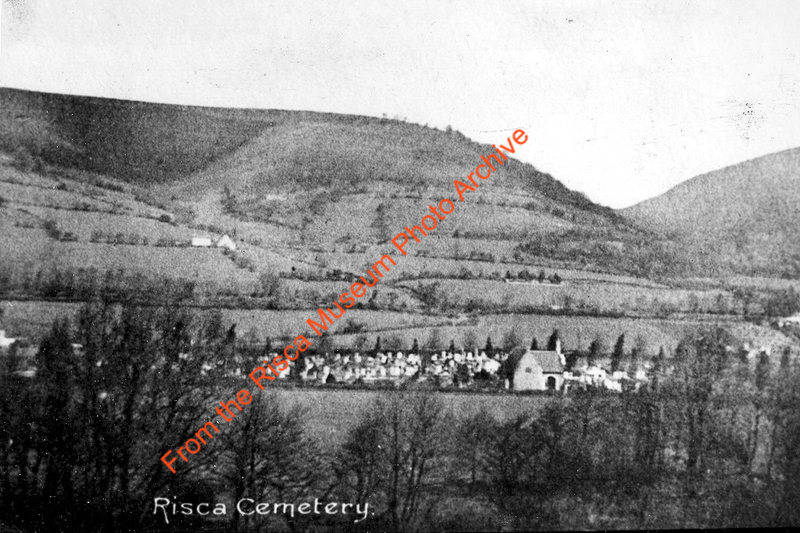 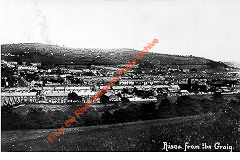 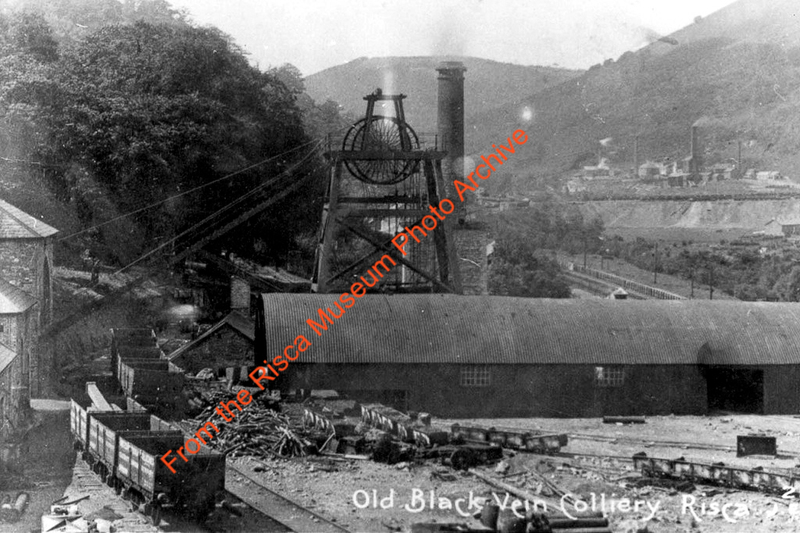 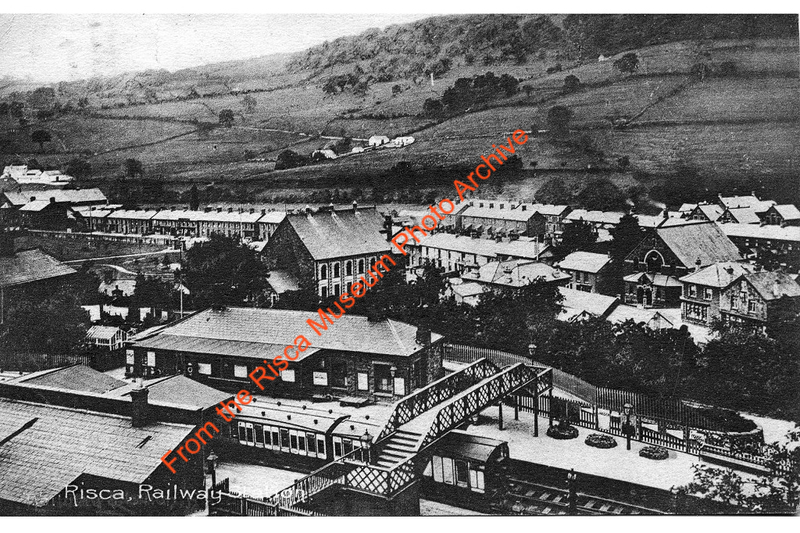 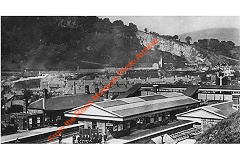 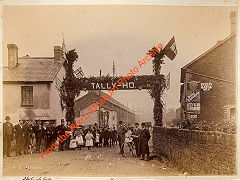 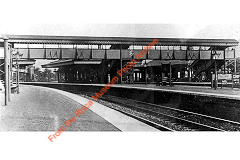 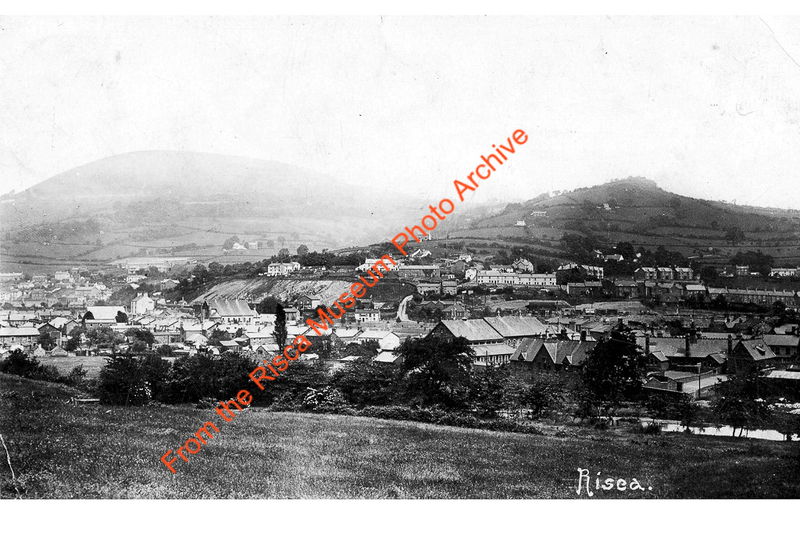 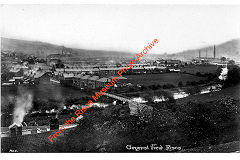 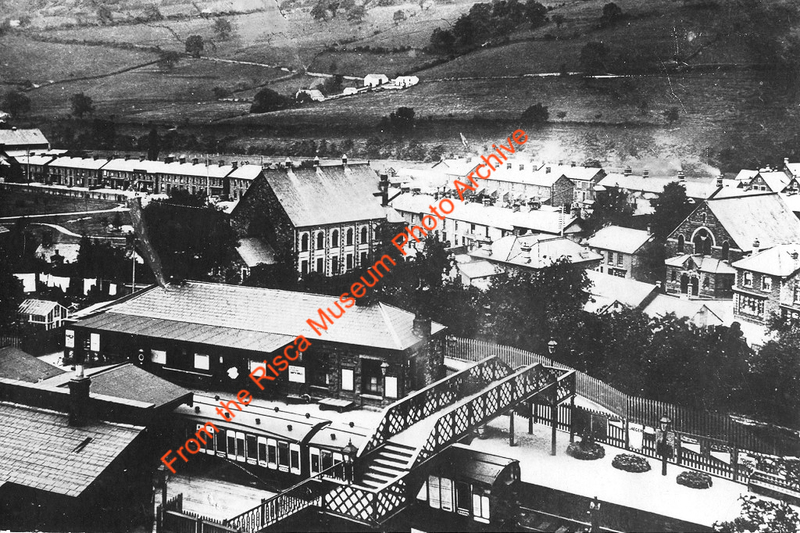 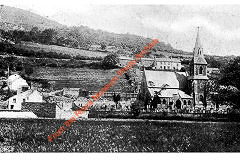 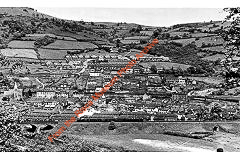 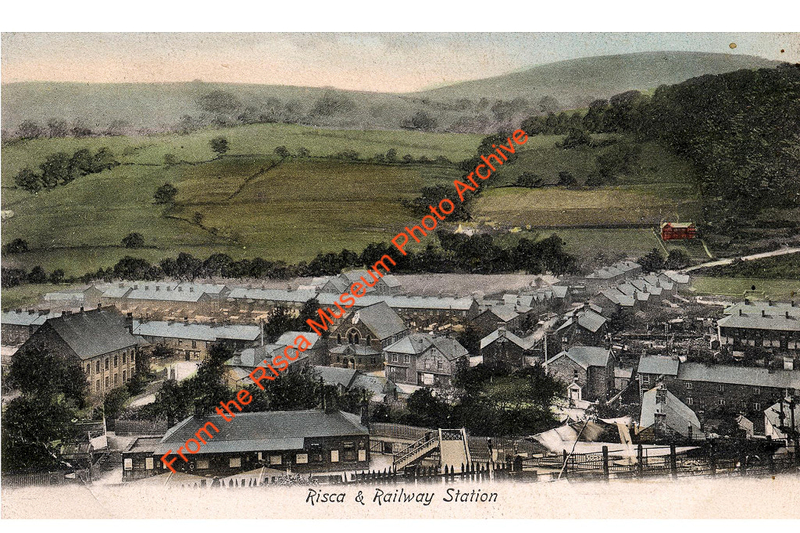 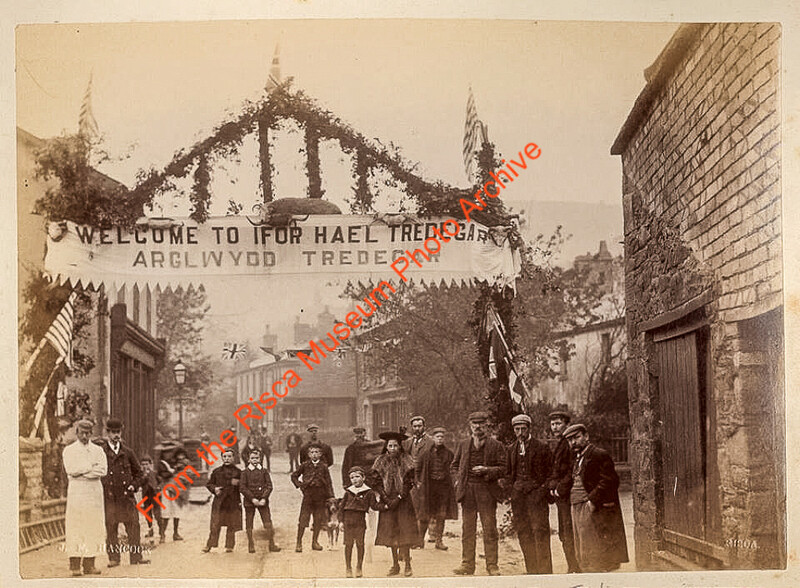 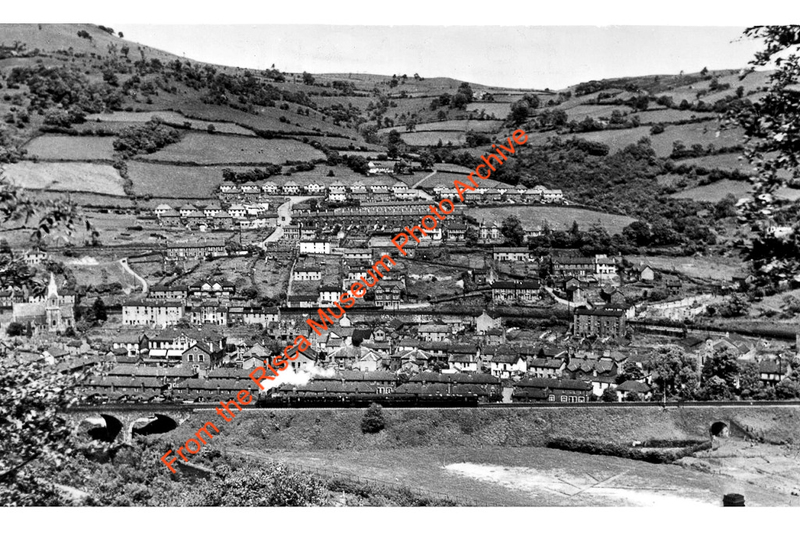 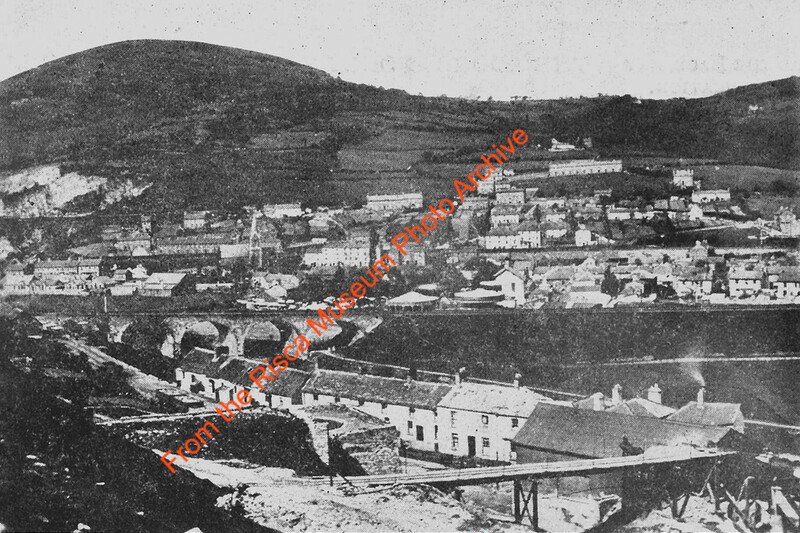 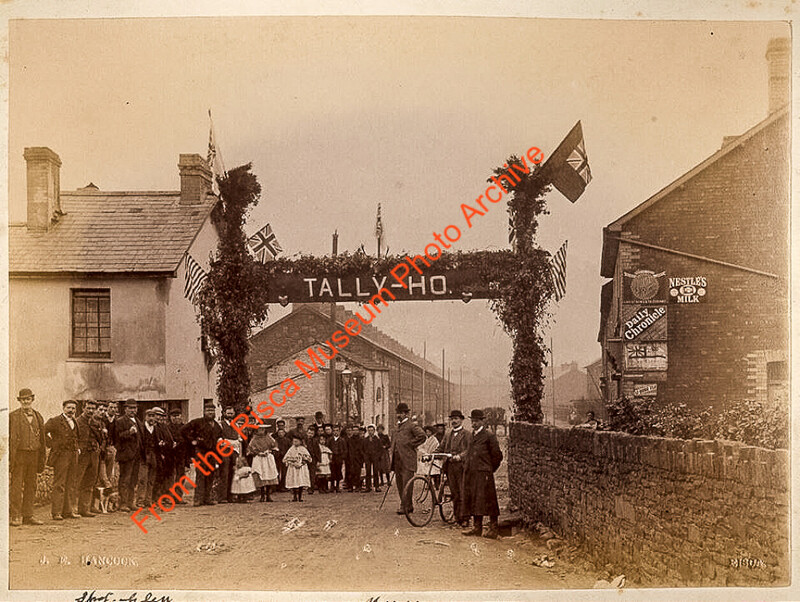 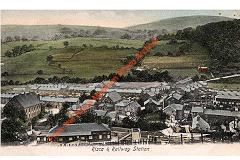 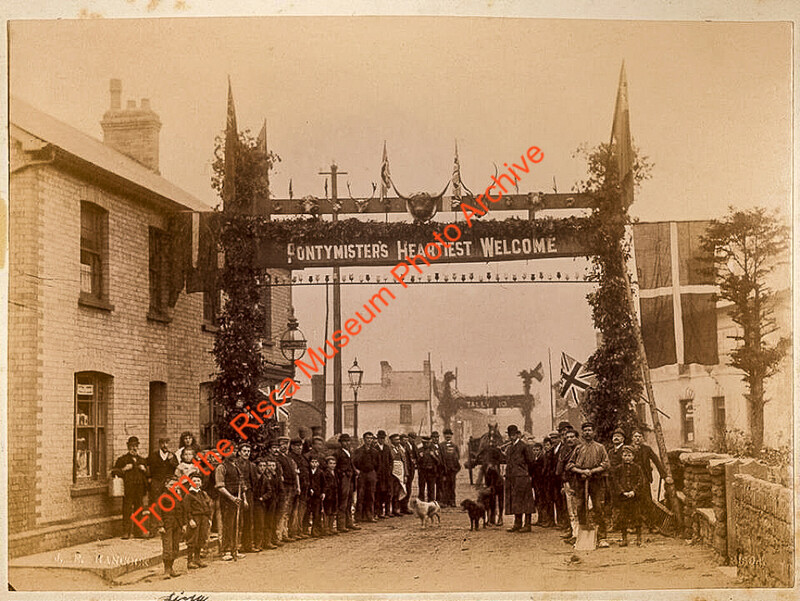 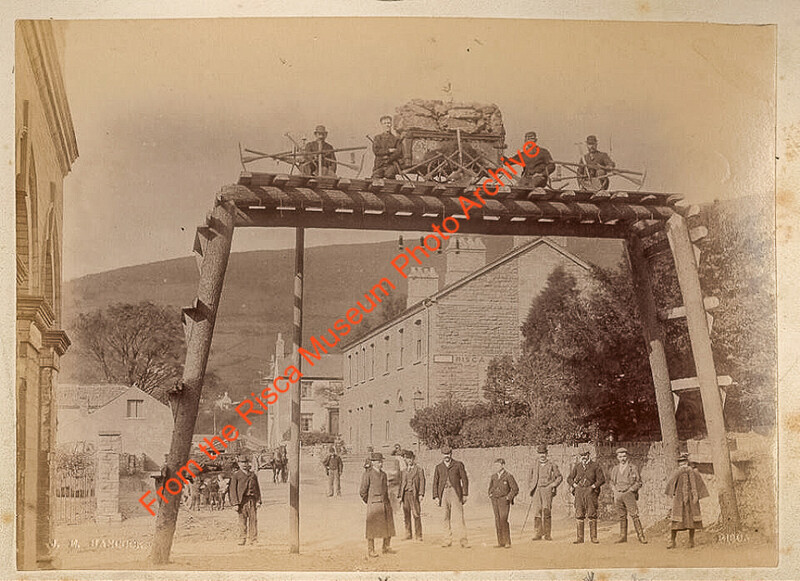 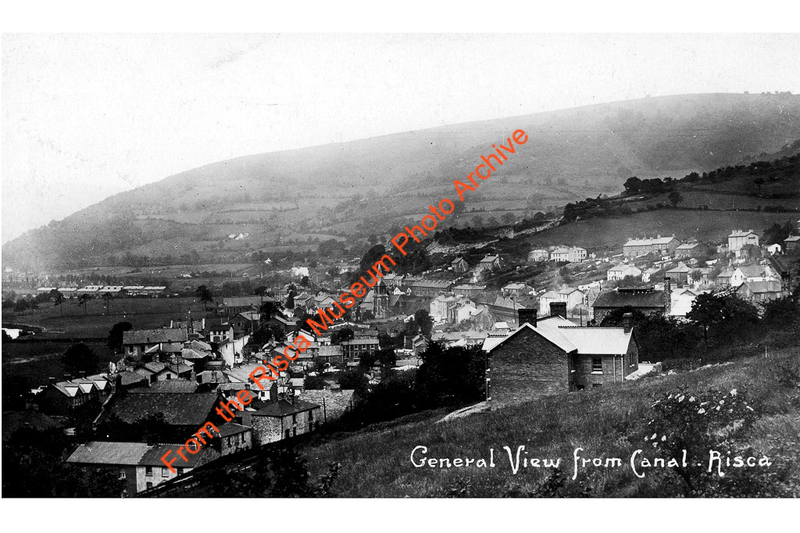 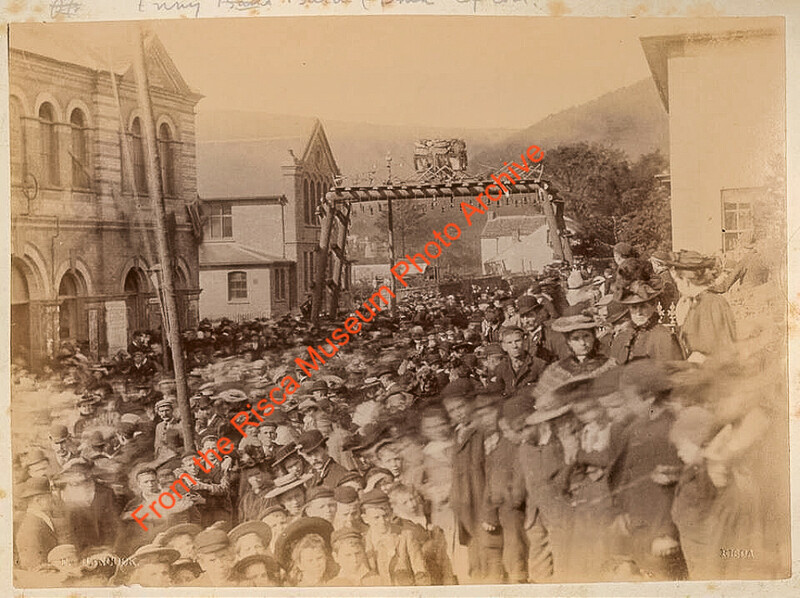 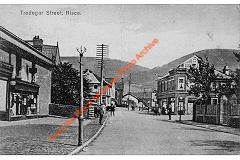 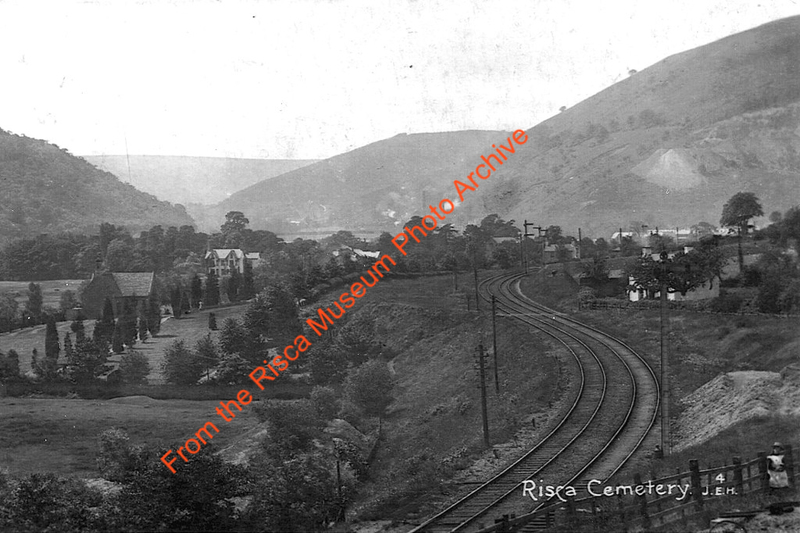 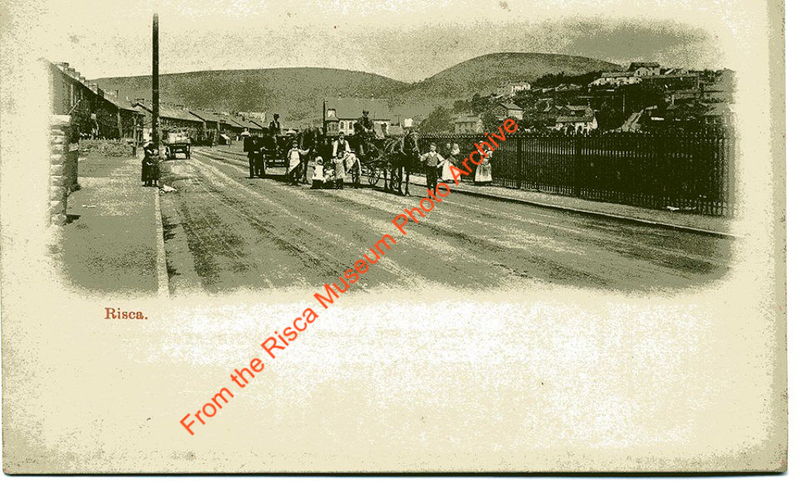 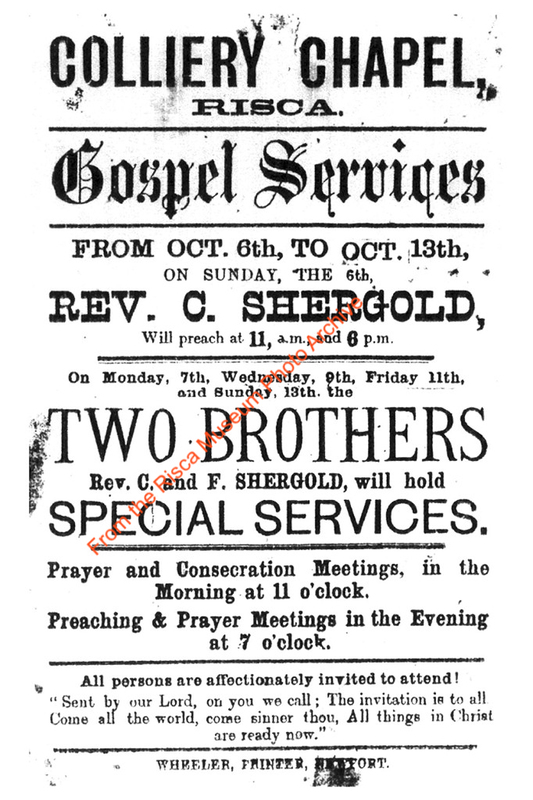 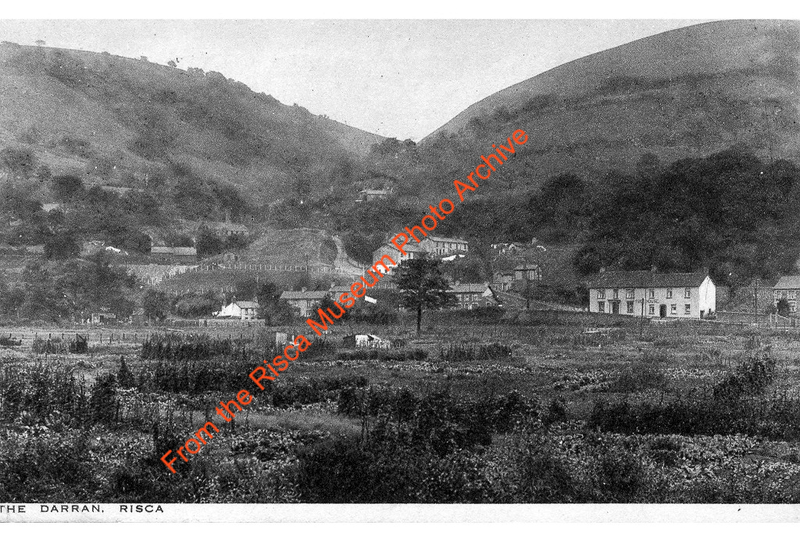 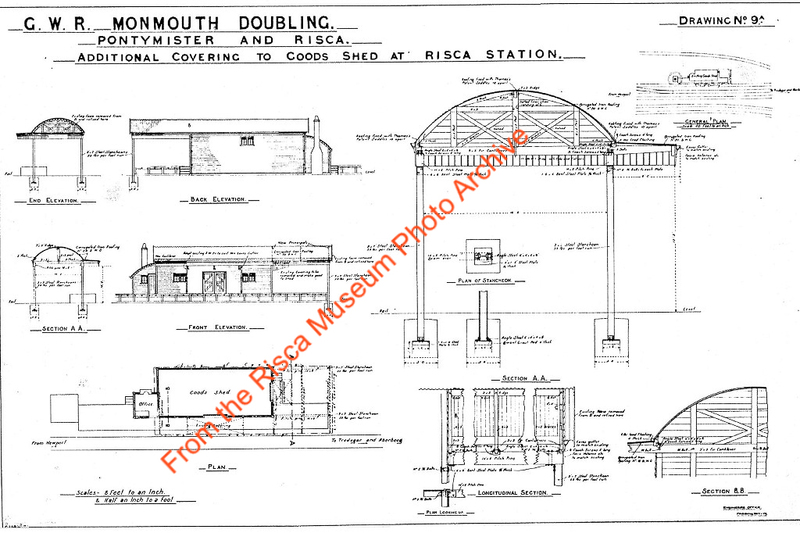 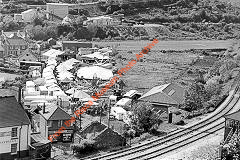 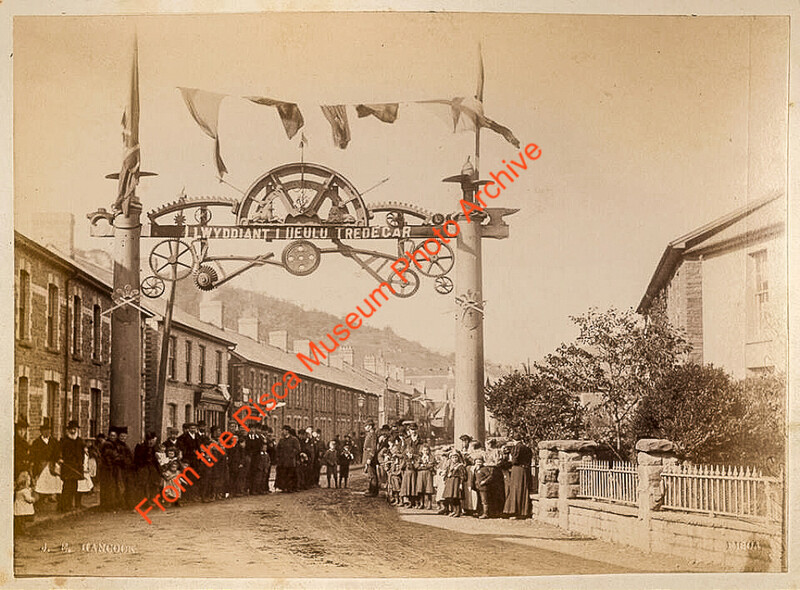 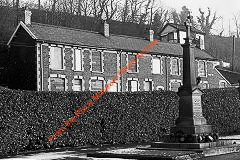 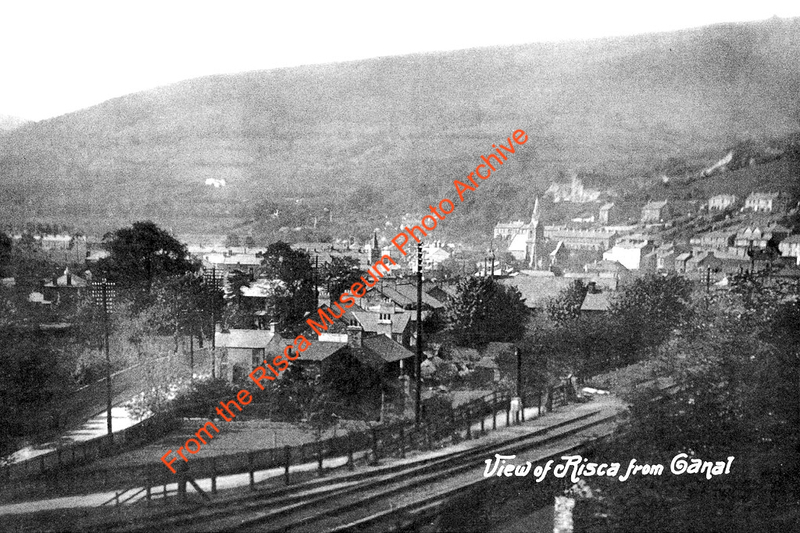 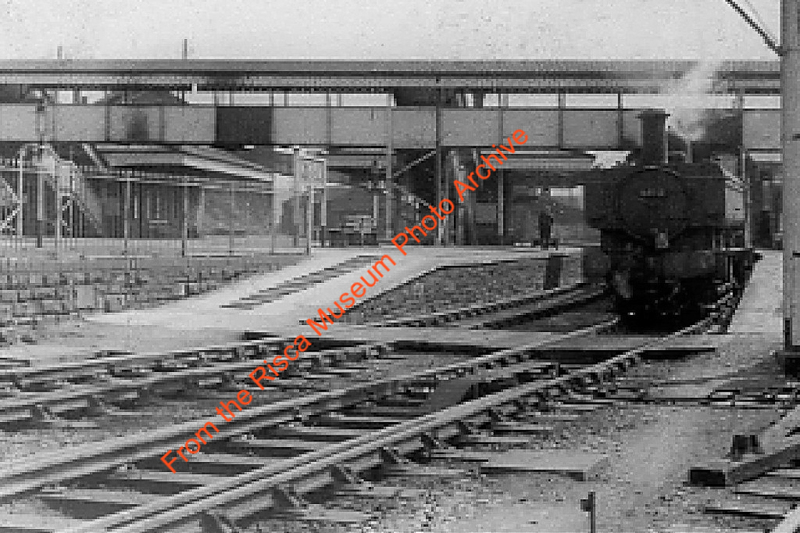 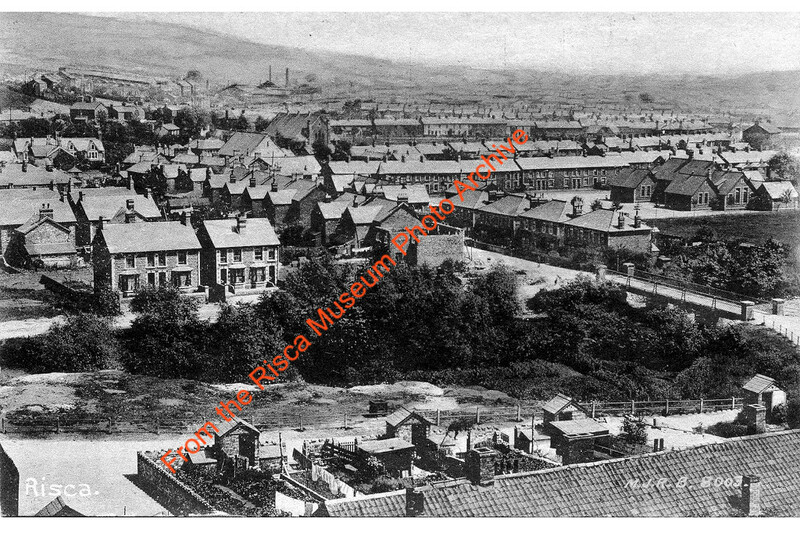 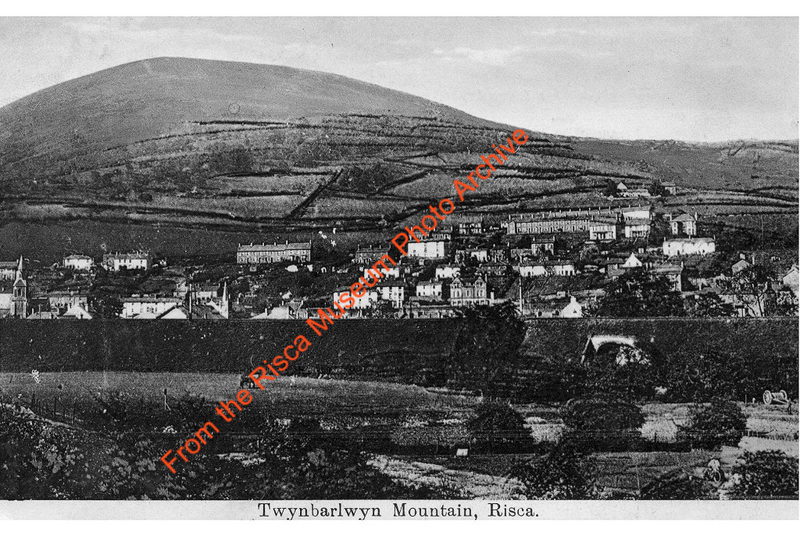 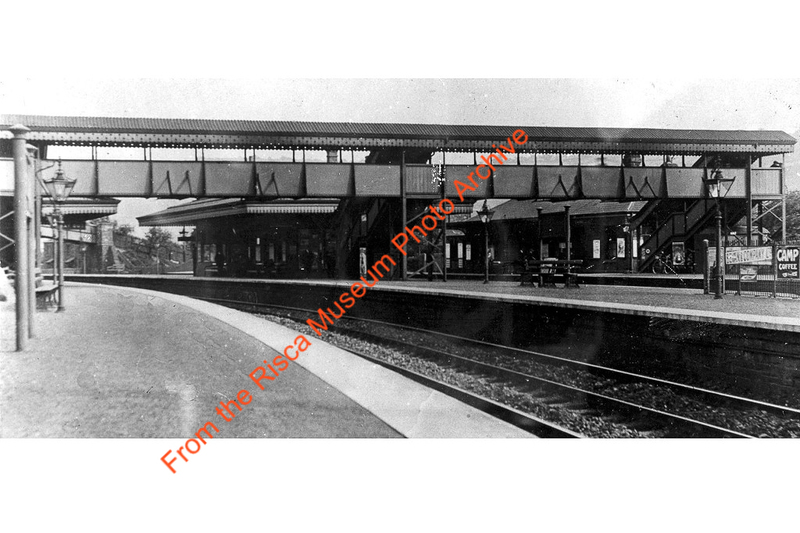 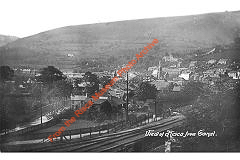 There were seven arches to welcome Lord Tredegar to the Eisteddfod at Risca on 5th October 1896. 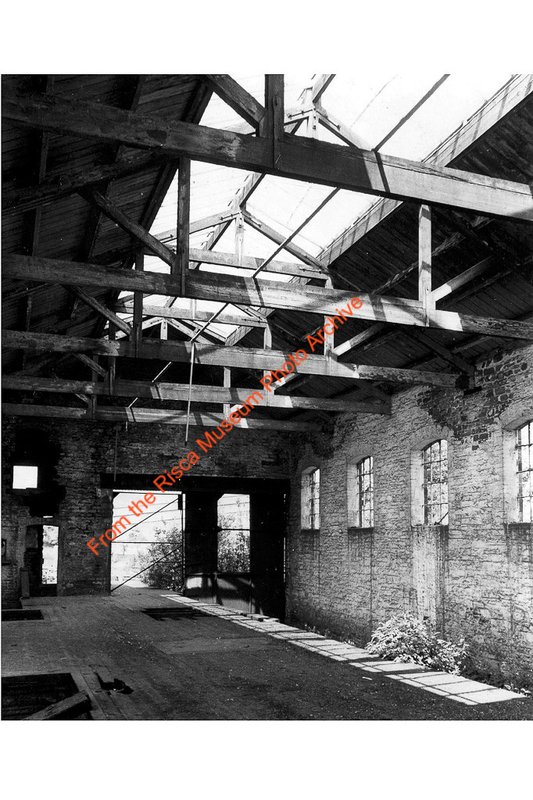 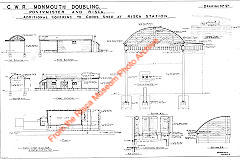 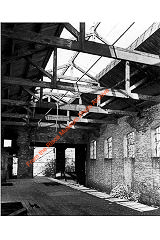 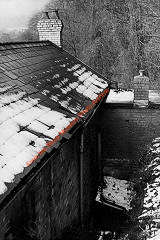 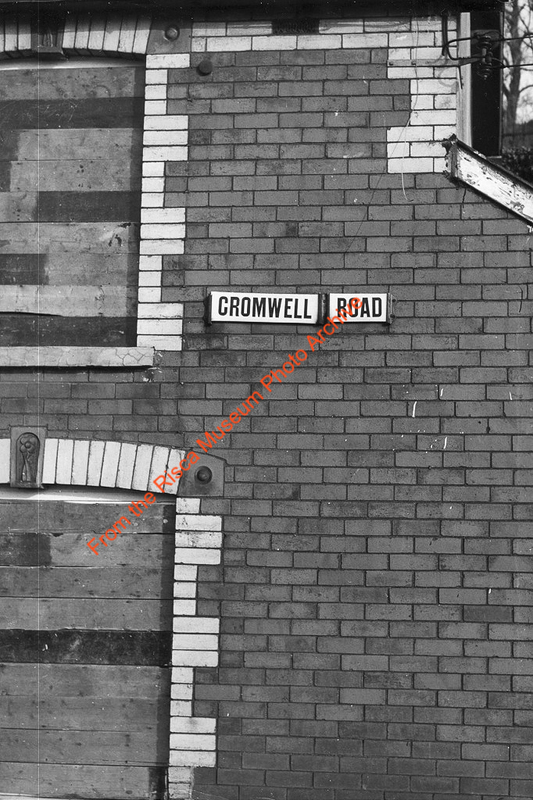 They were the Pontymister Arch, the Huntsmans Arch, the Foundry Arch, the Gardeners Arch, the Tenants Arch, the Darren Arch and the Colliery Arch. 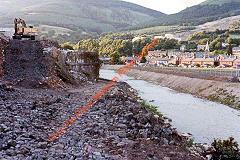 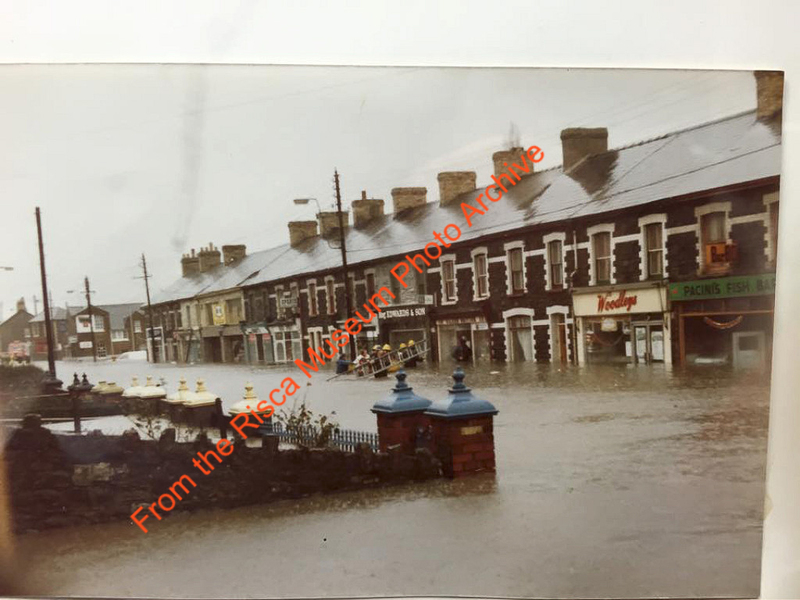 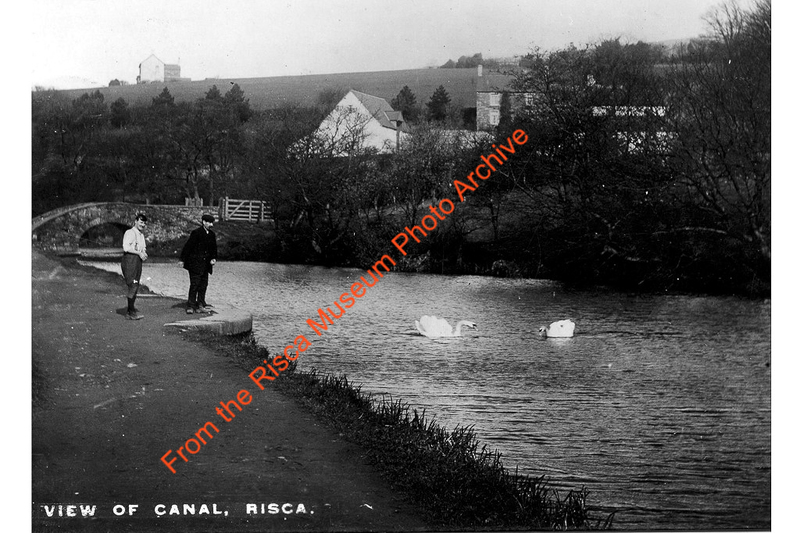 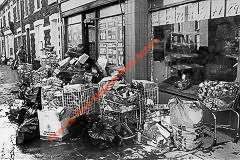 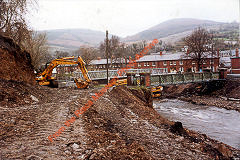 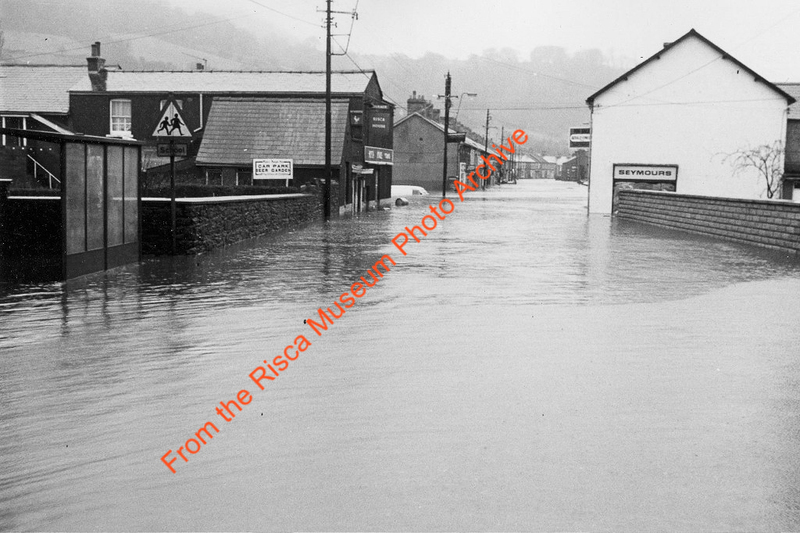 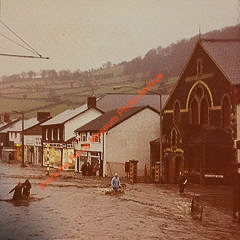 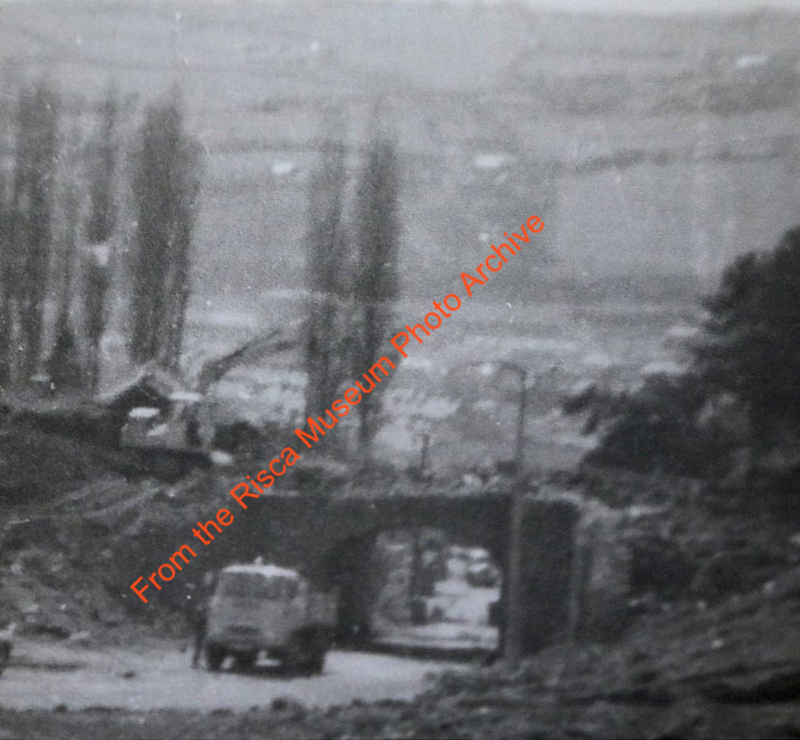 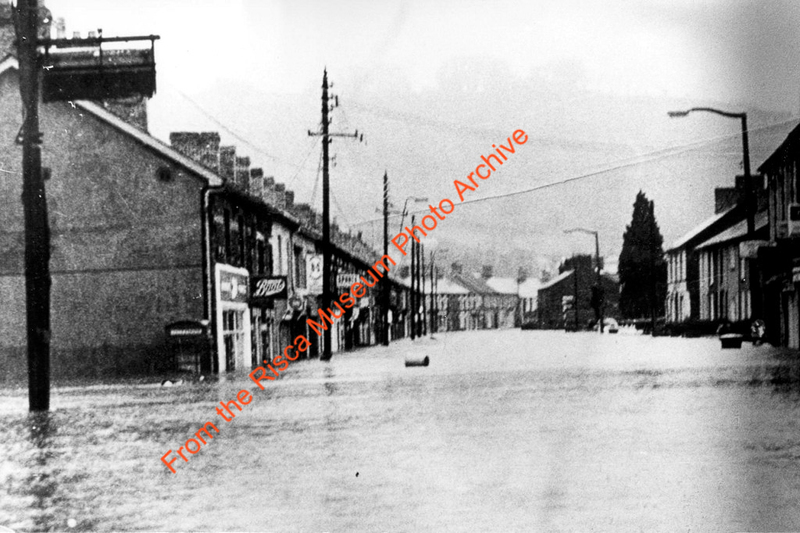 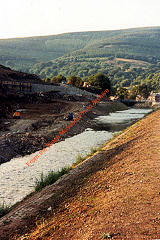 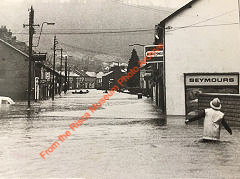 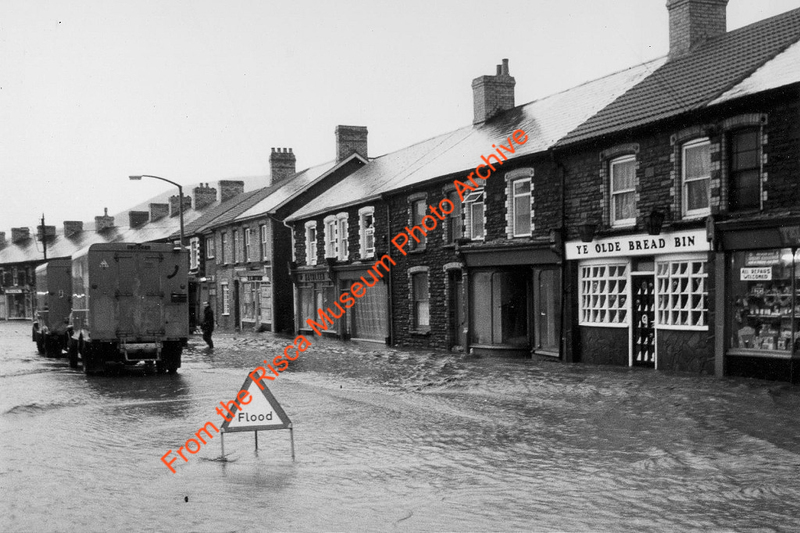 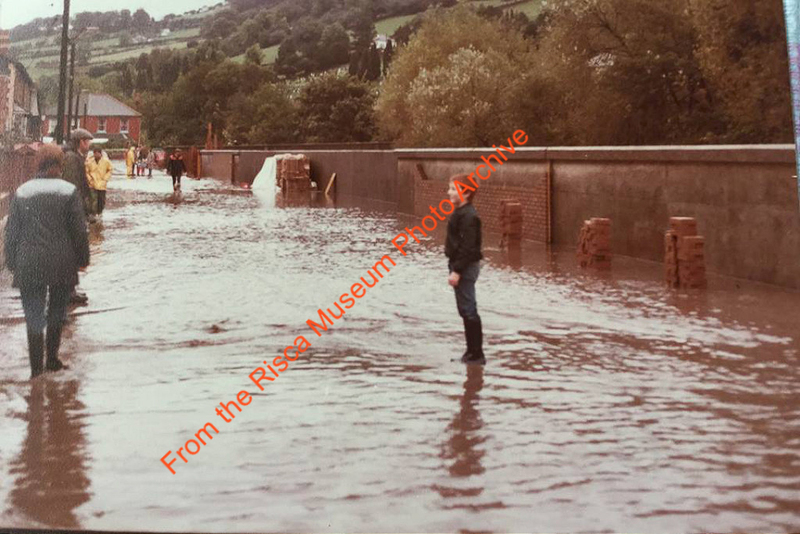 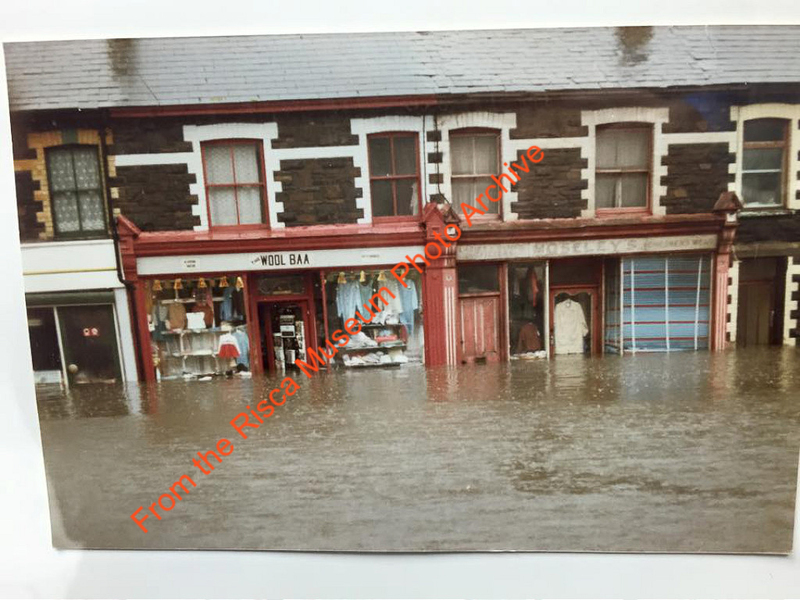 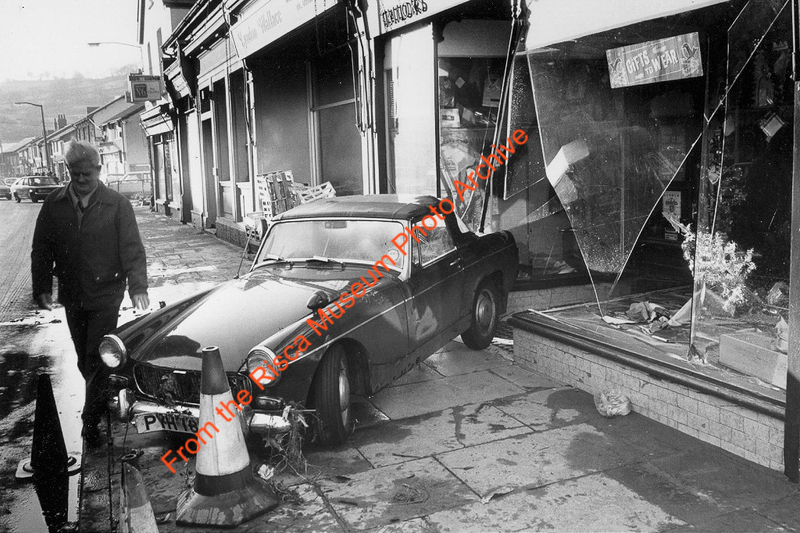 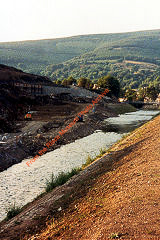 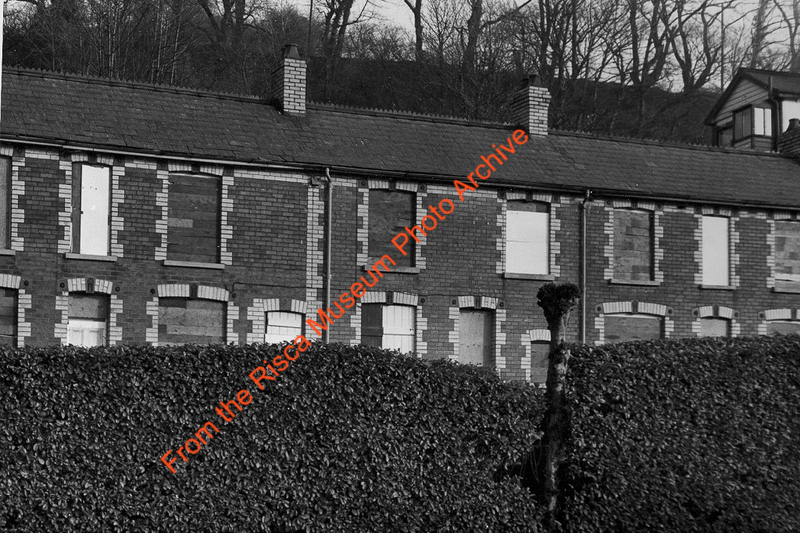 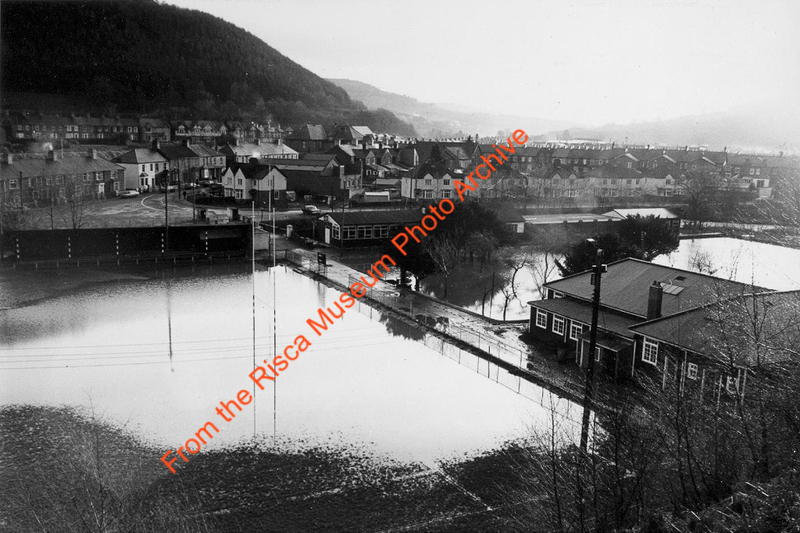 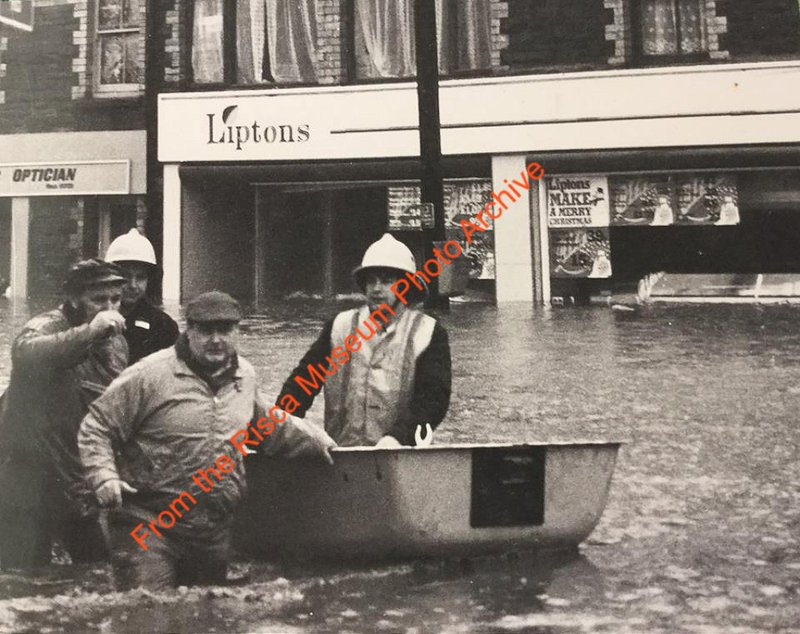 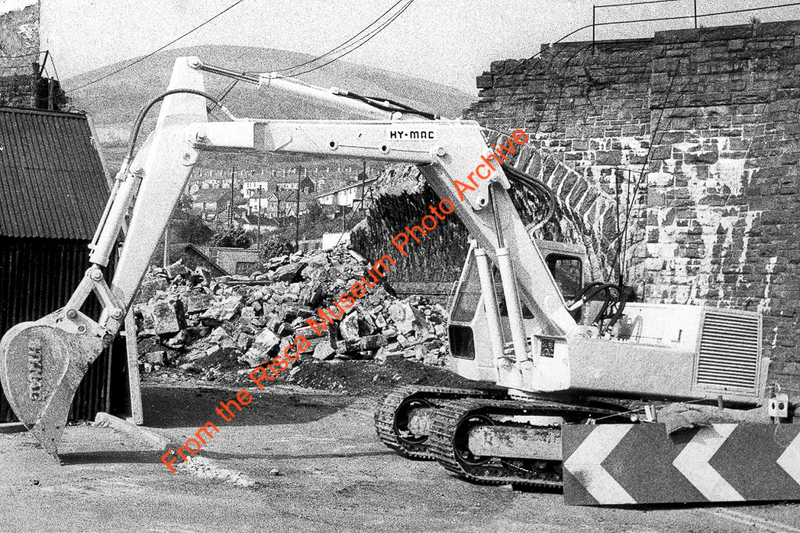 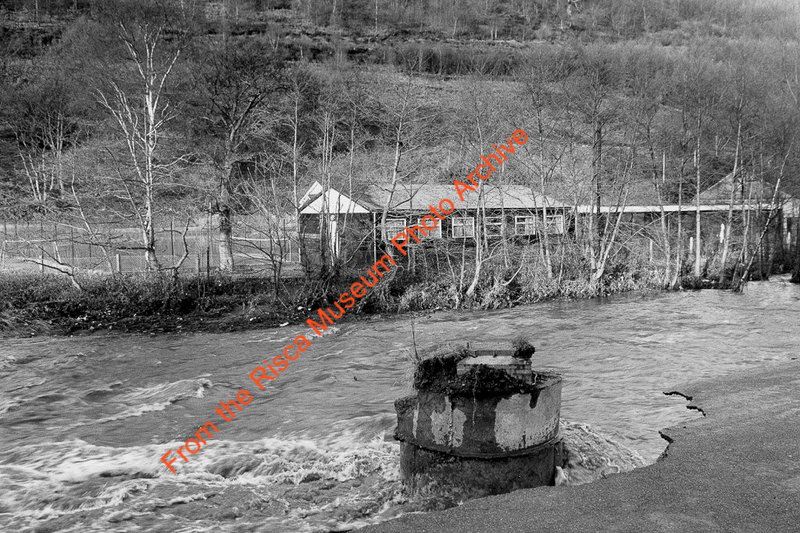 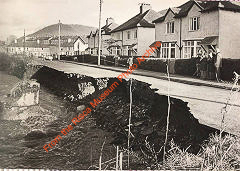 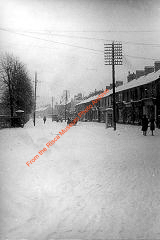 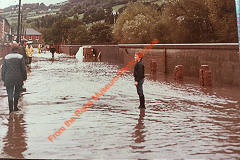 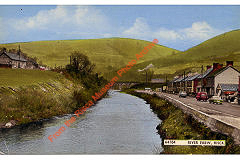 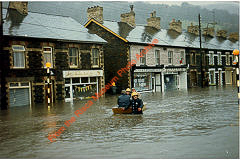 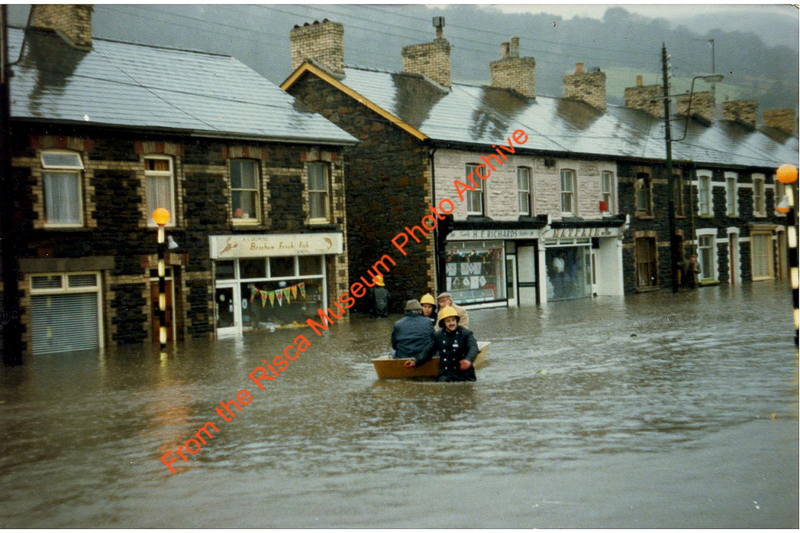 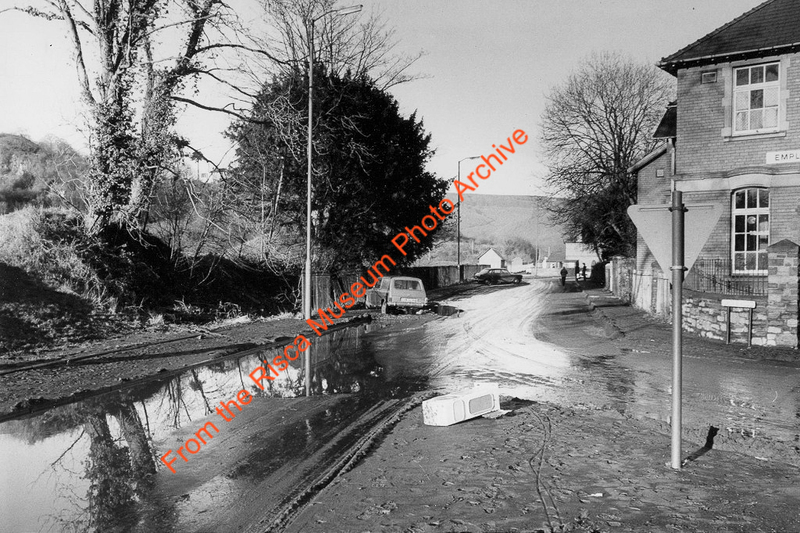 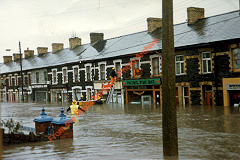 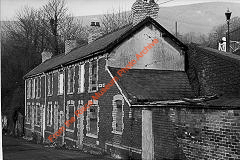 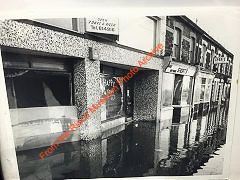 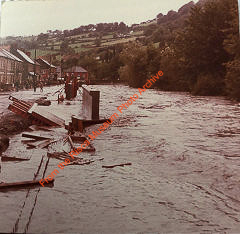 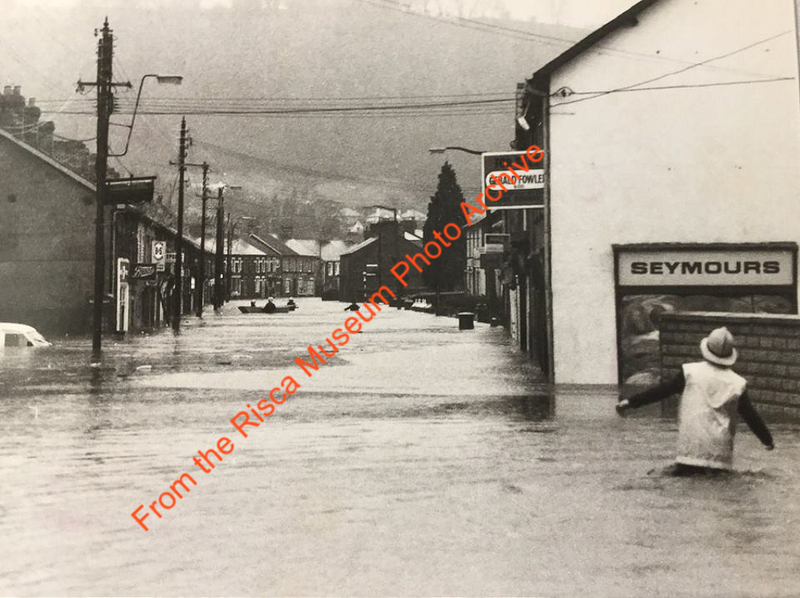 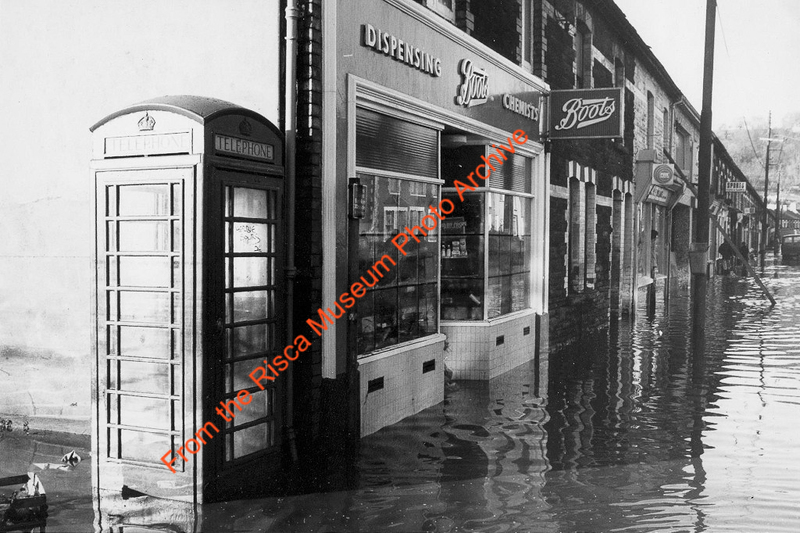 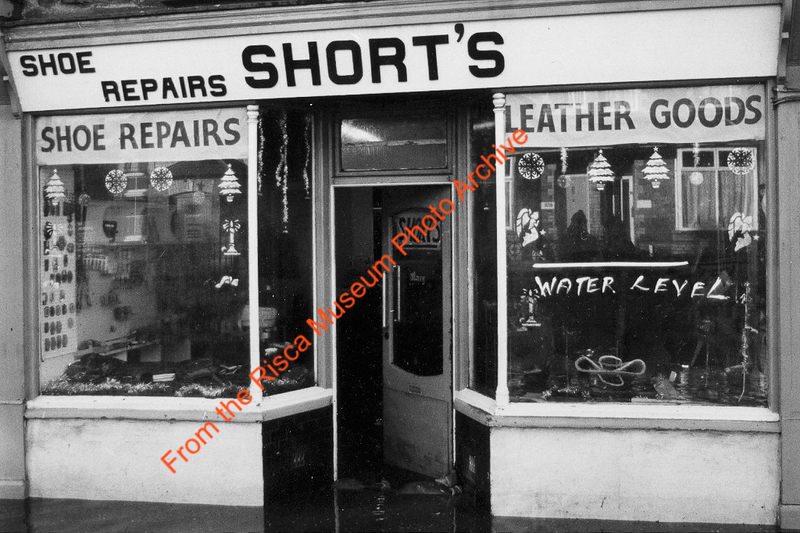 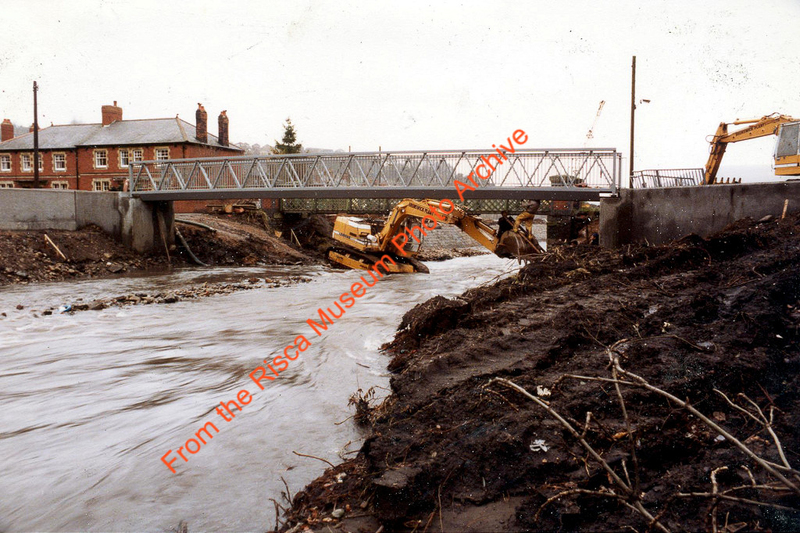 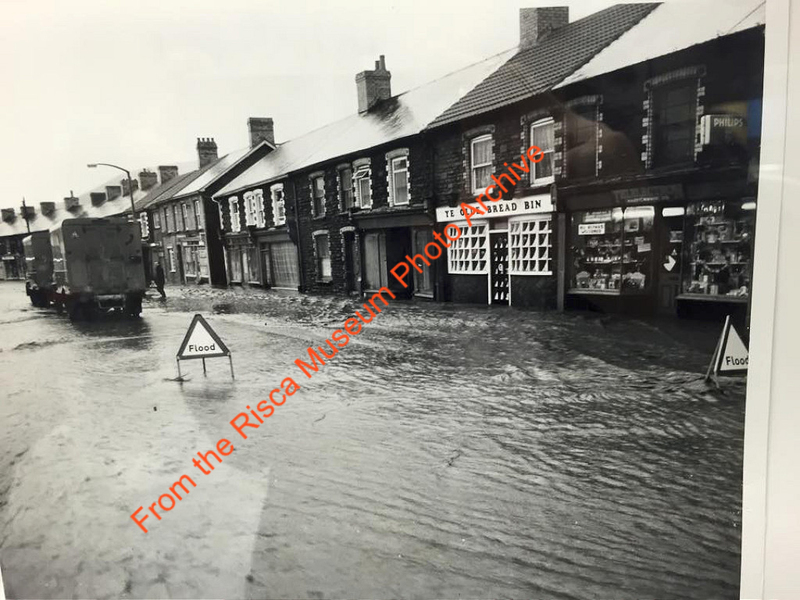 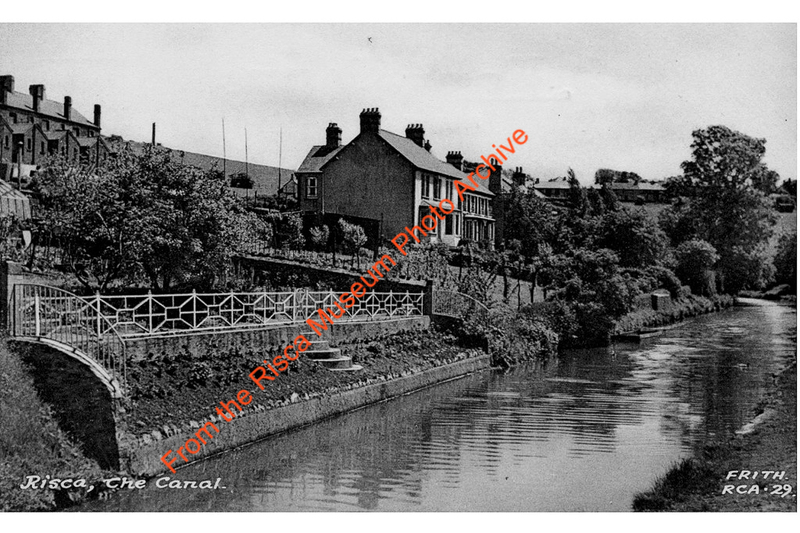 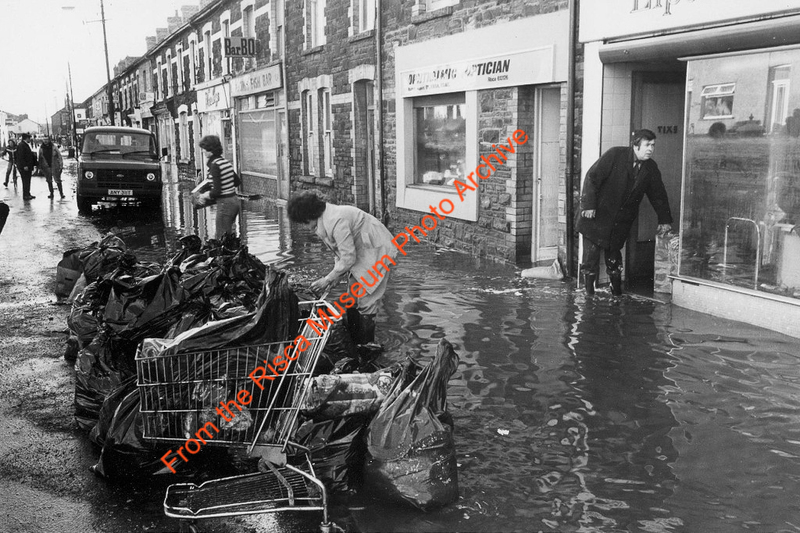 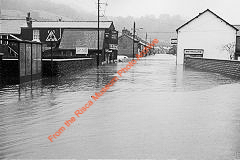 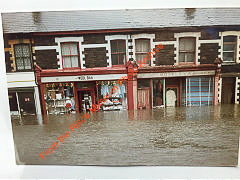 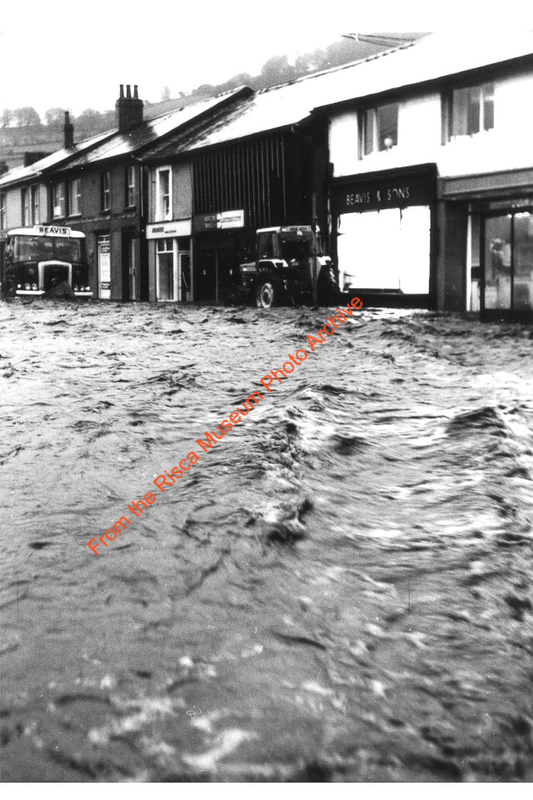 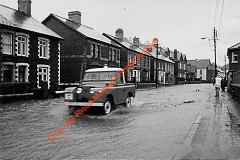 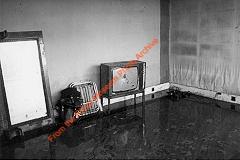 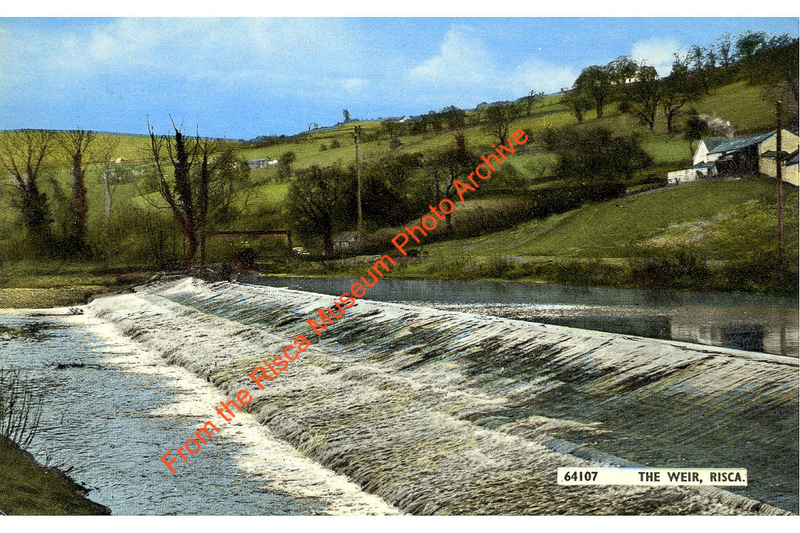 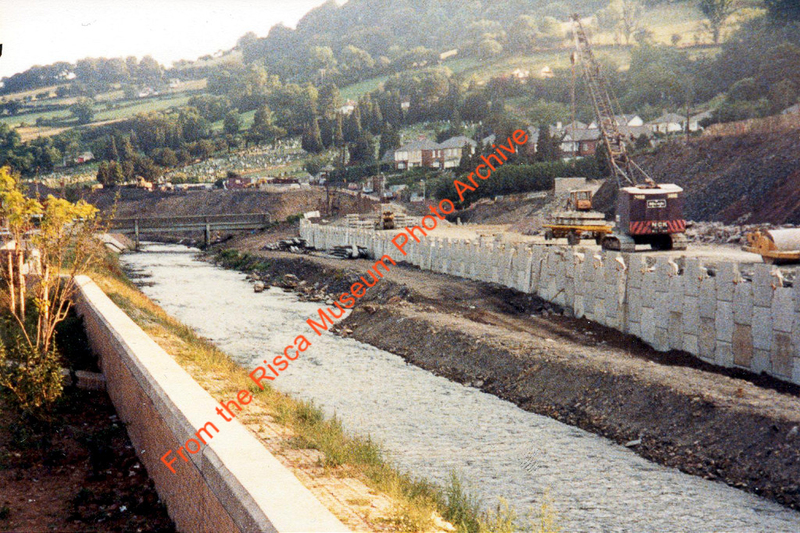 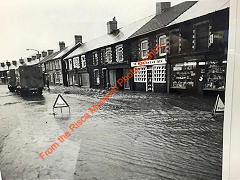 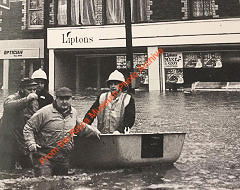 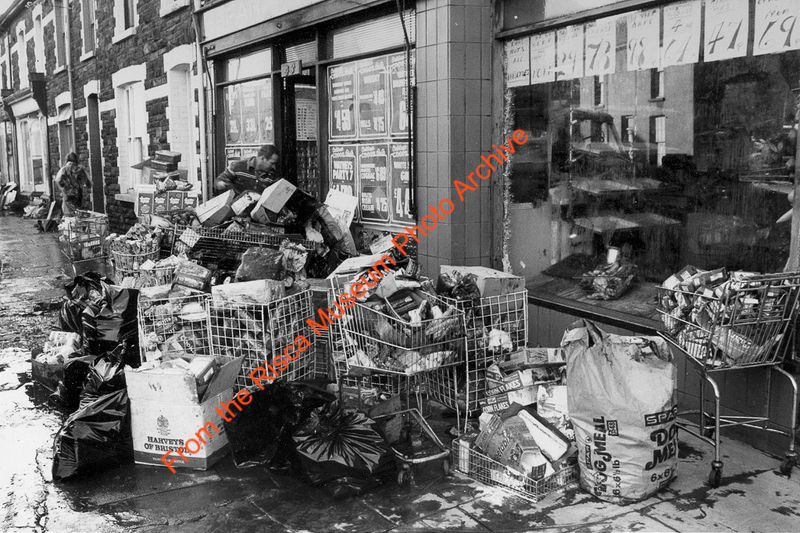 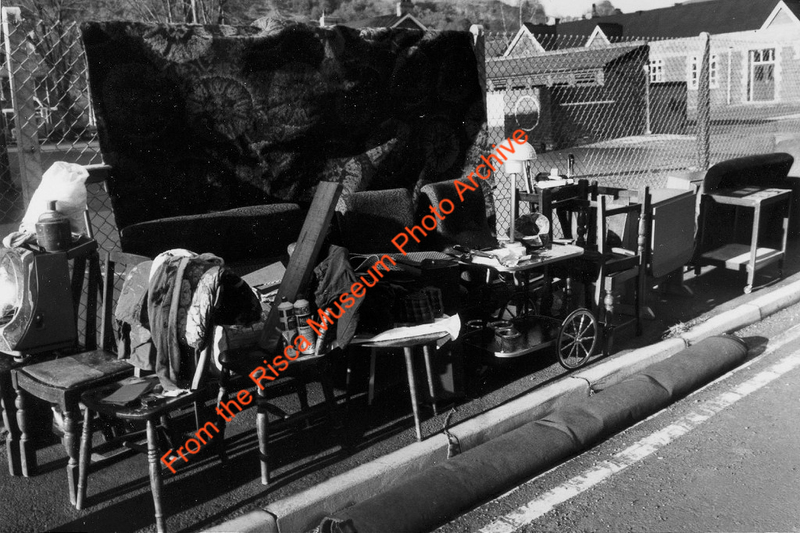 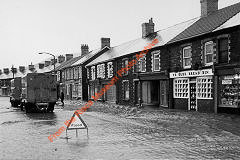 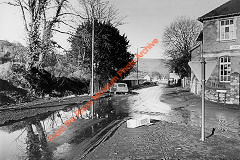 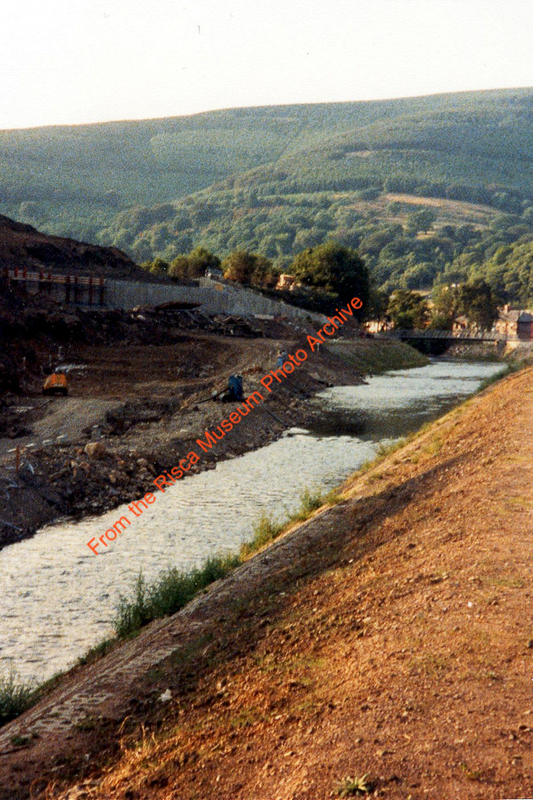 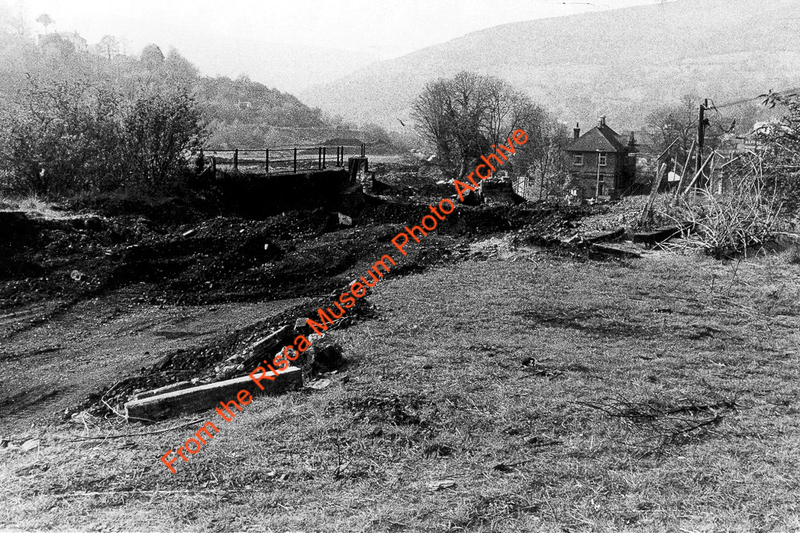 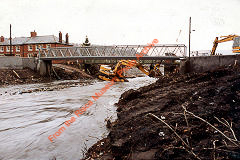 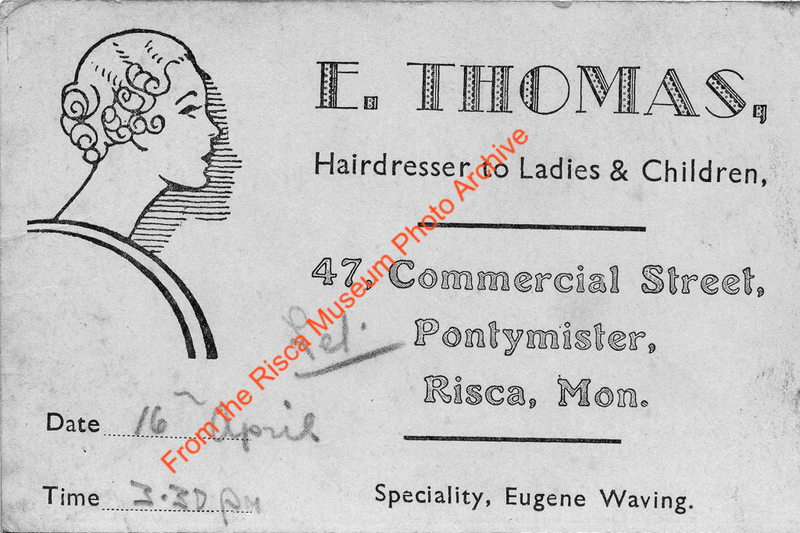 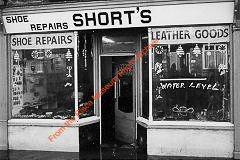 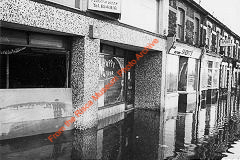 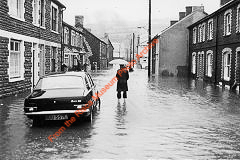 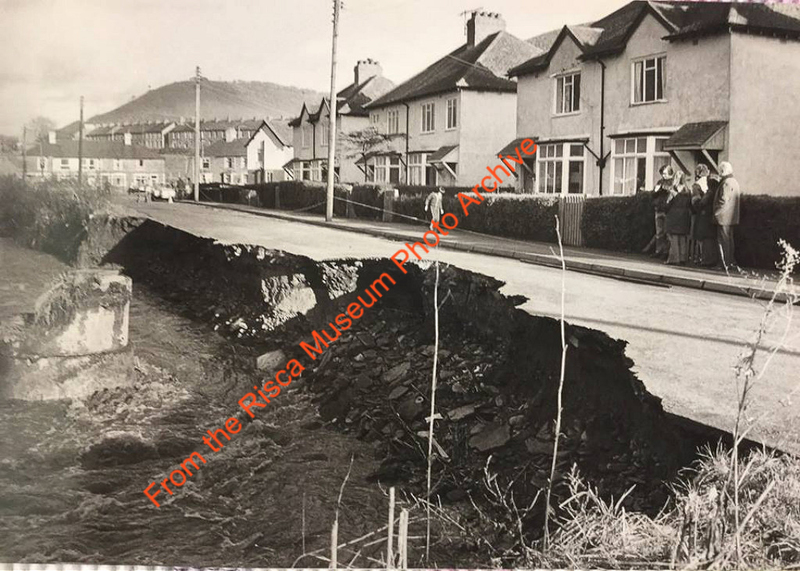 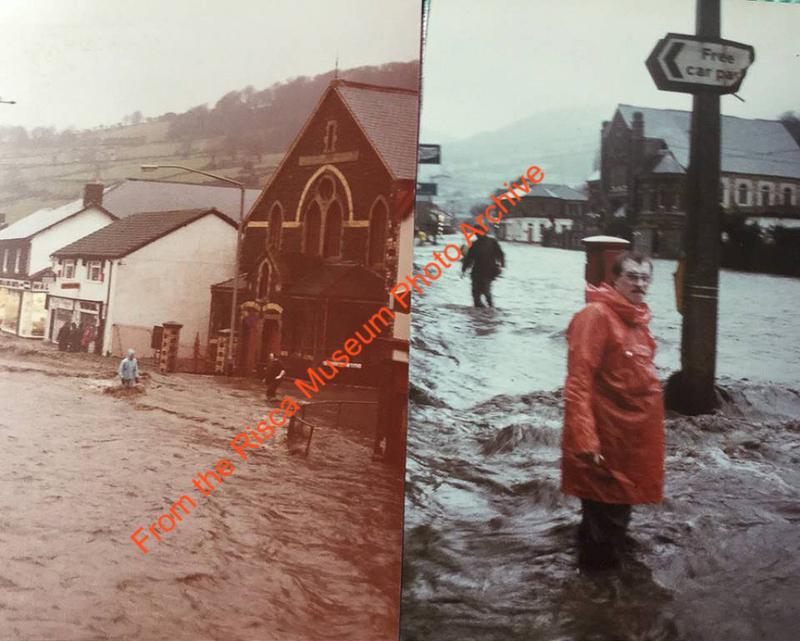 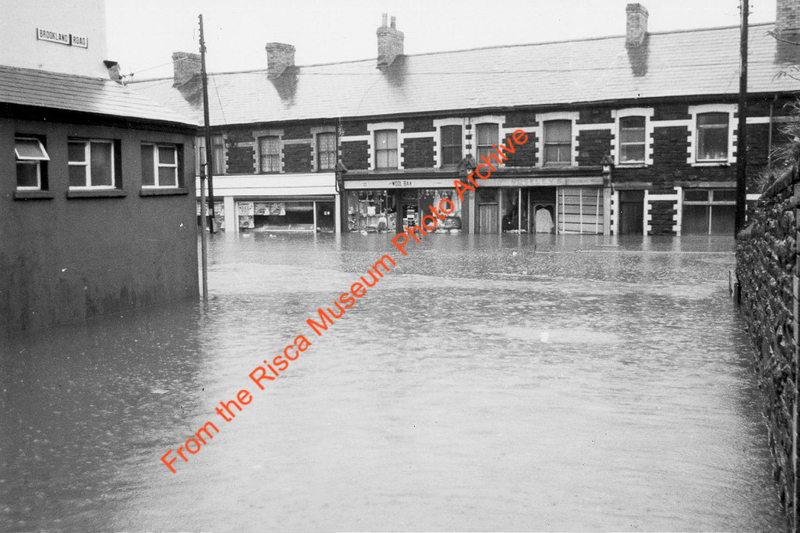 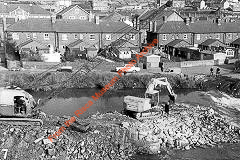 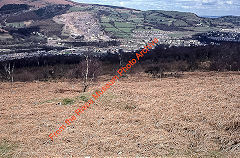 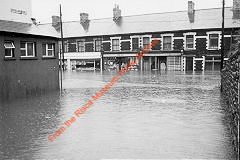 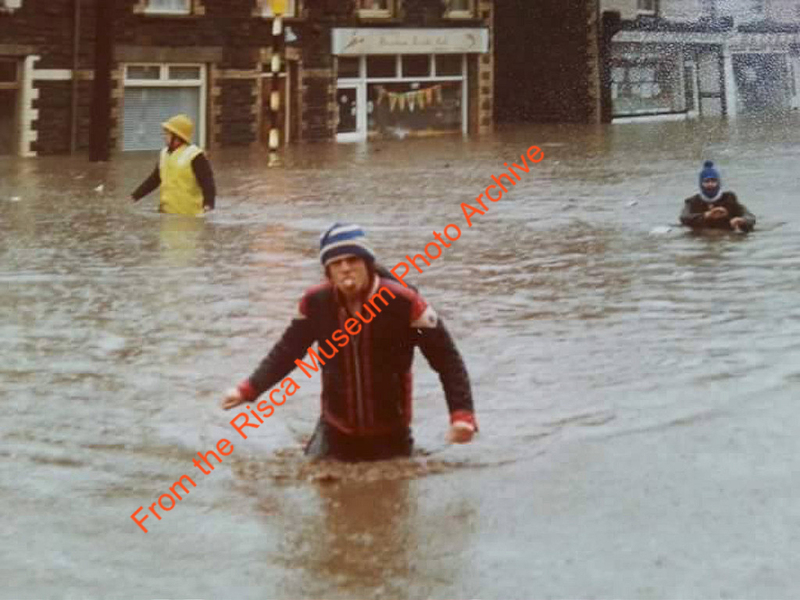 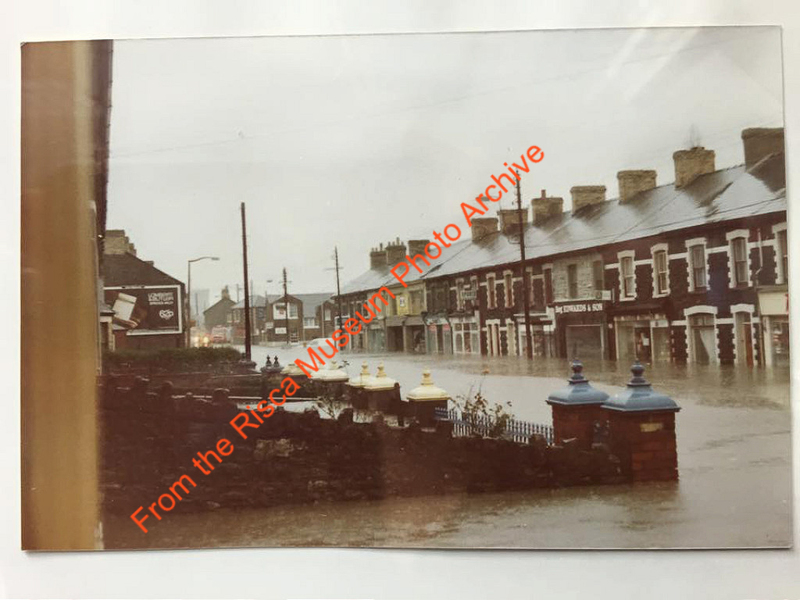 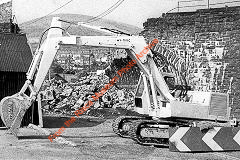 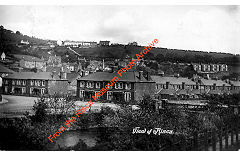 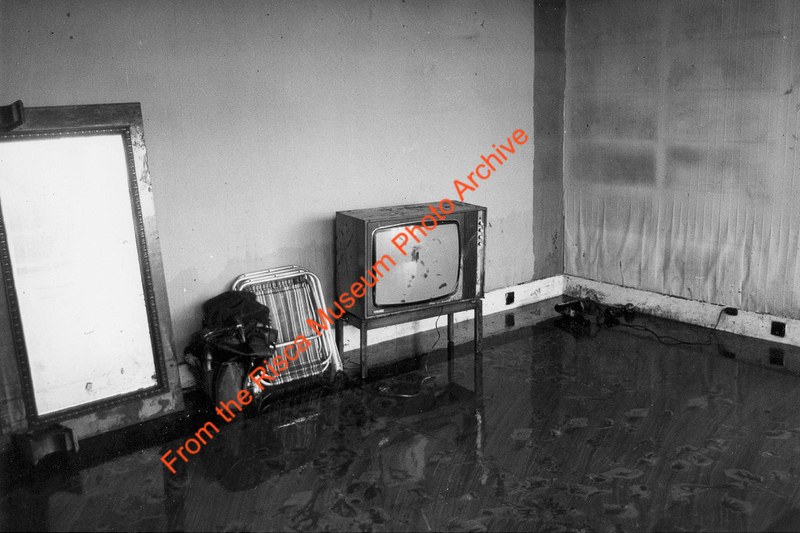 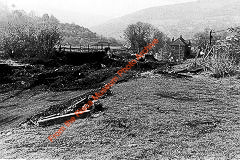 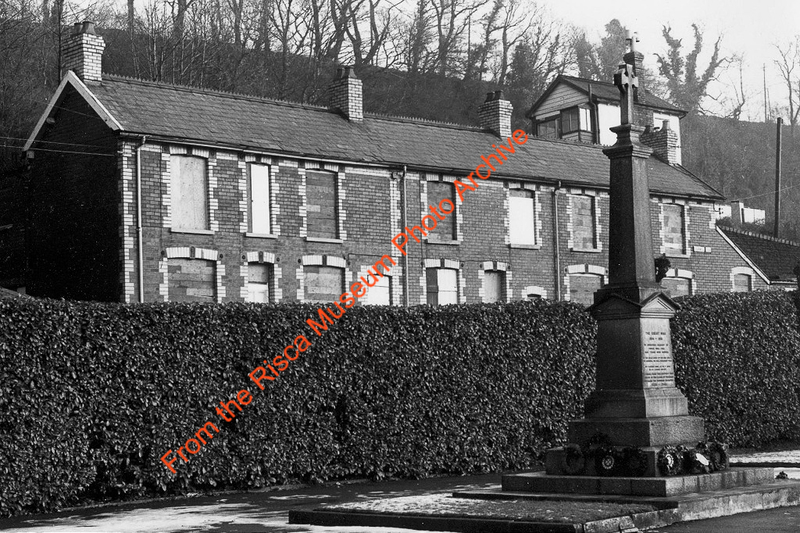 On 27th December 1979 the River Ebbw burst its banks and Risca and Pontmister were inundated with floodwater.